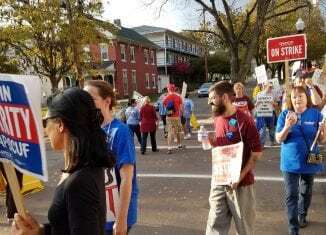 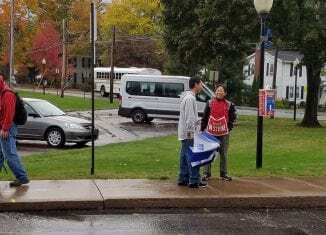 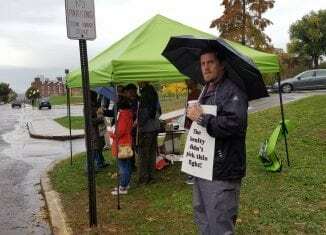 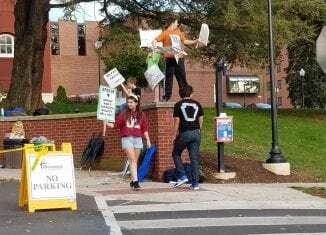 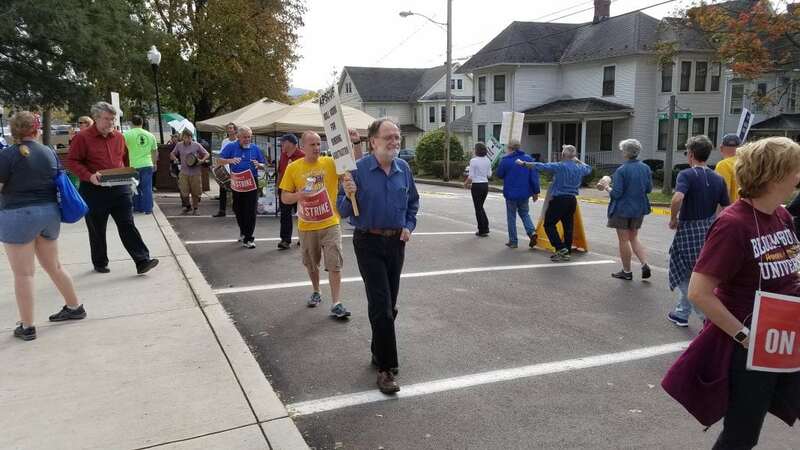 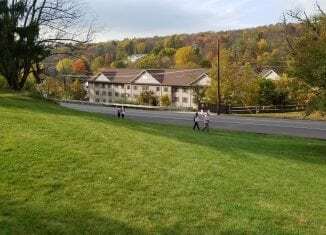 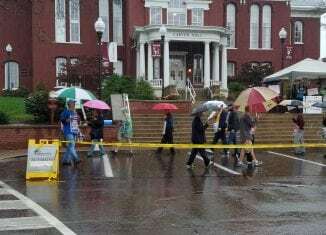 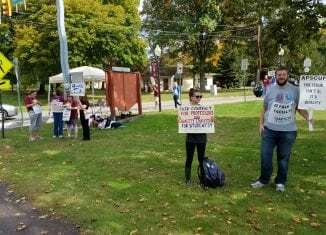 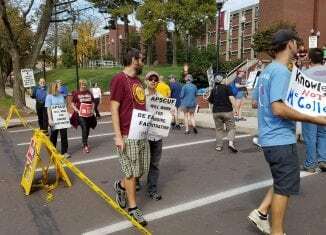 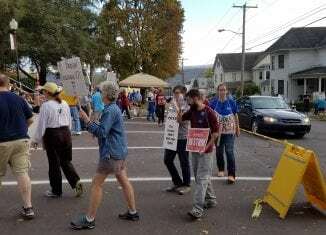 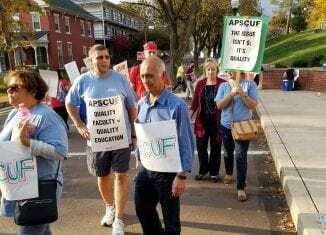 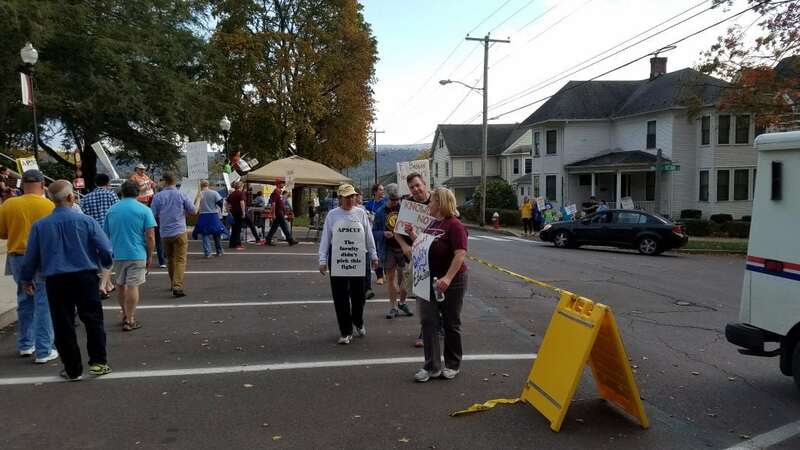 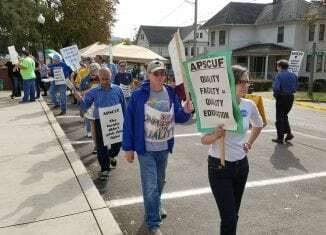 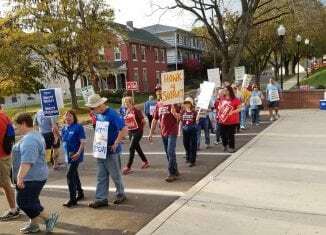 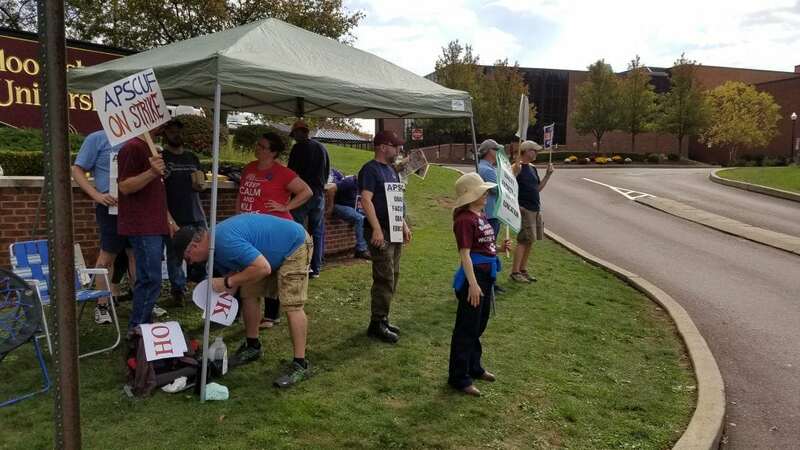 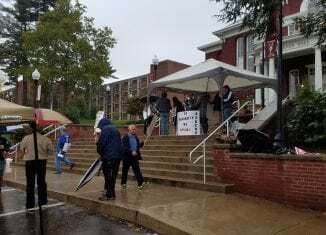 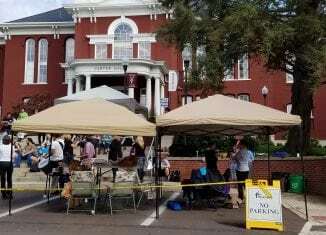 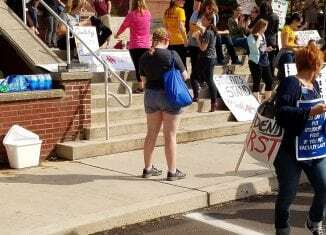 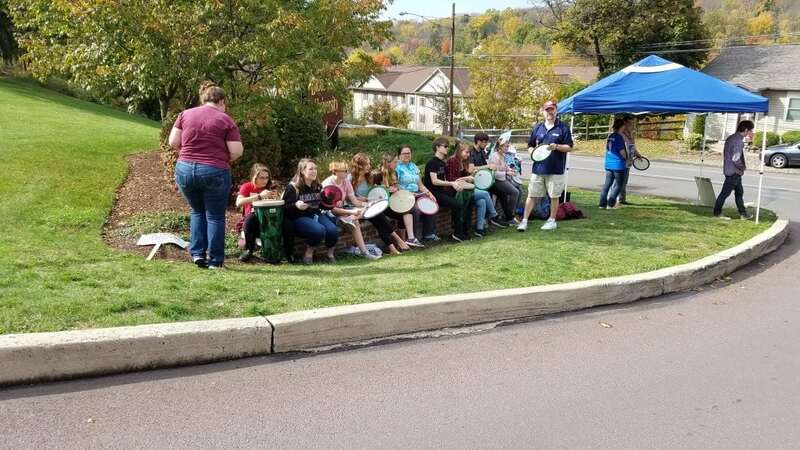 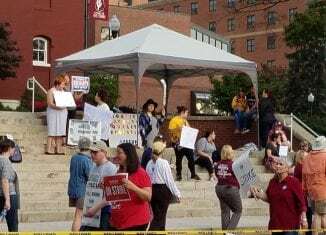 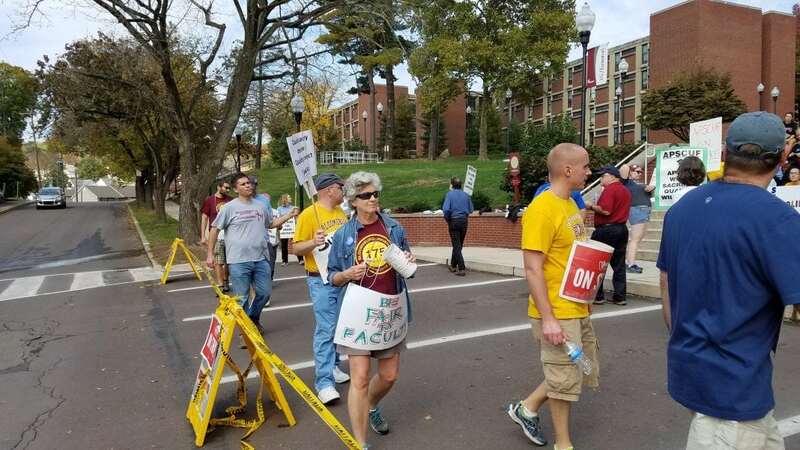 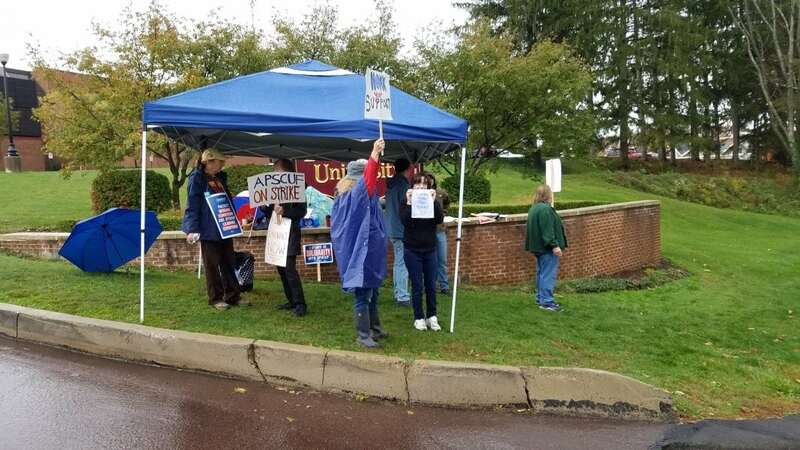 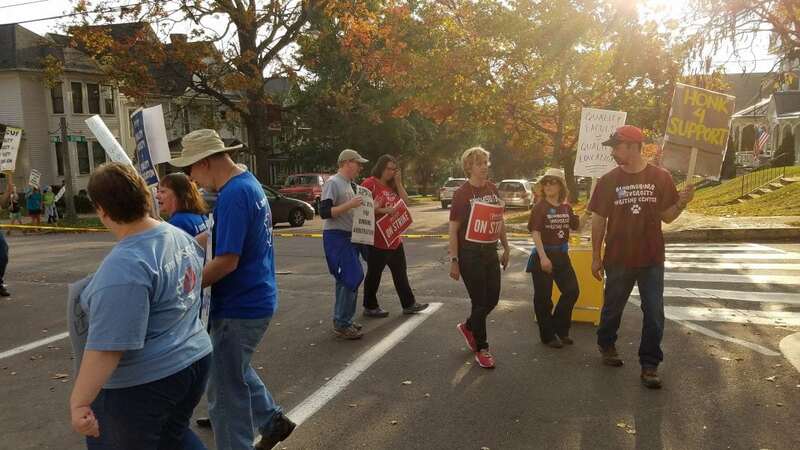 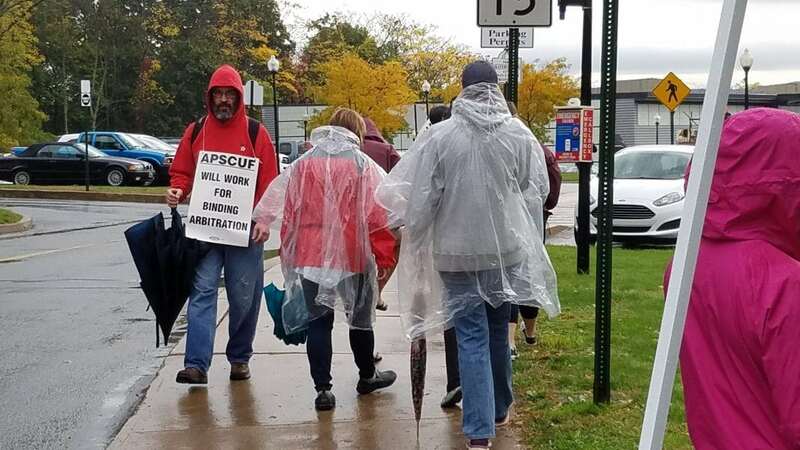 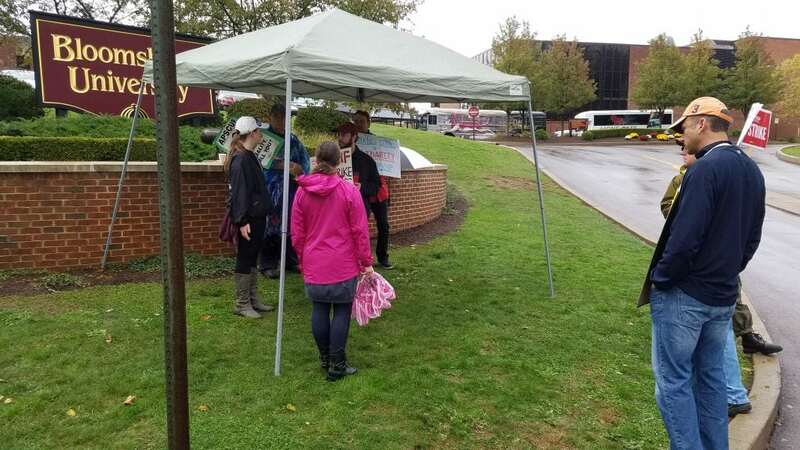 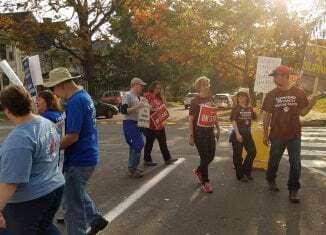 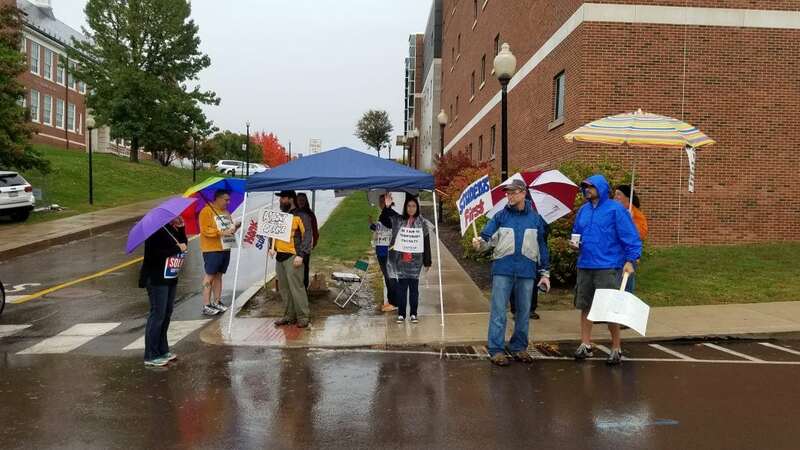 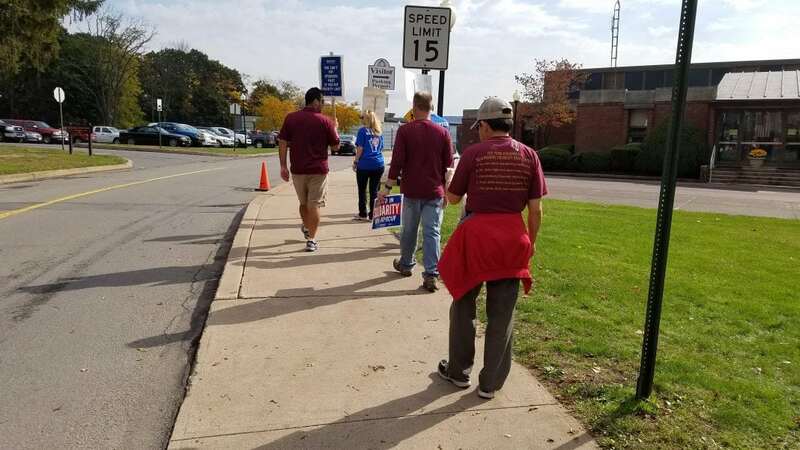 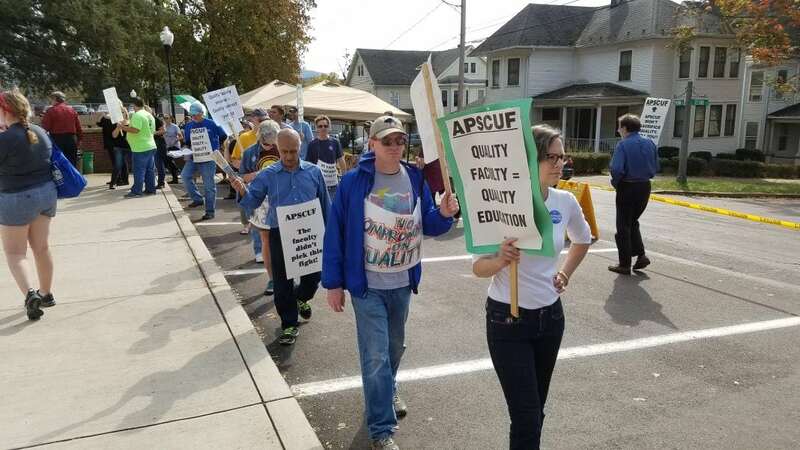 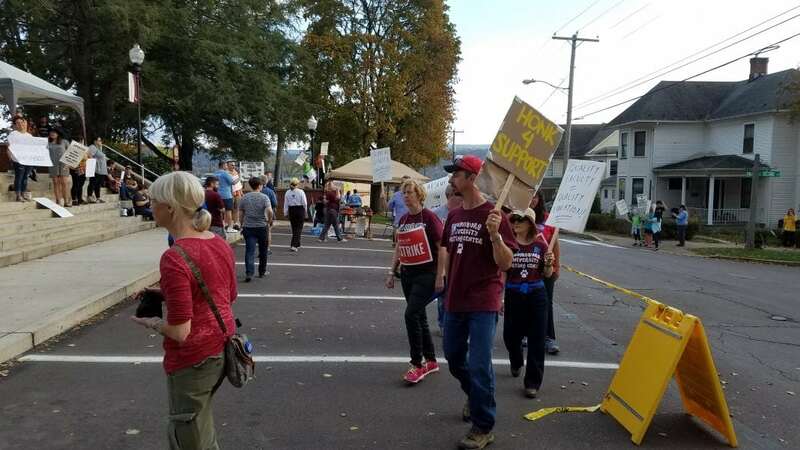 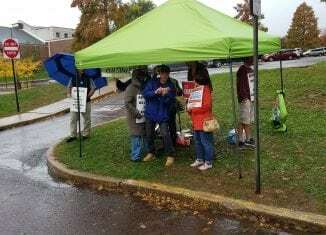 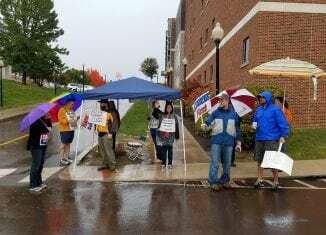 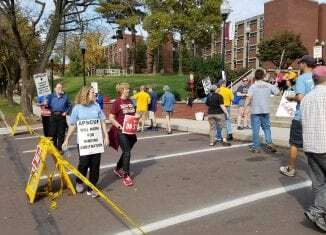 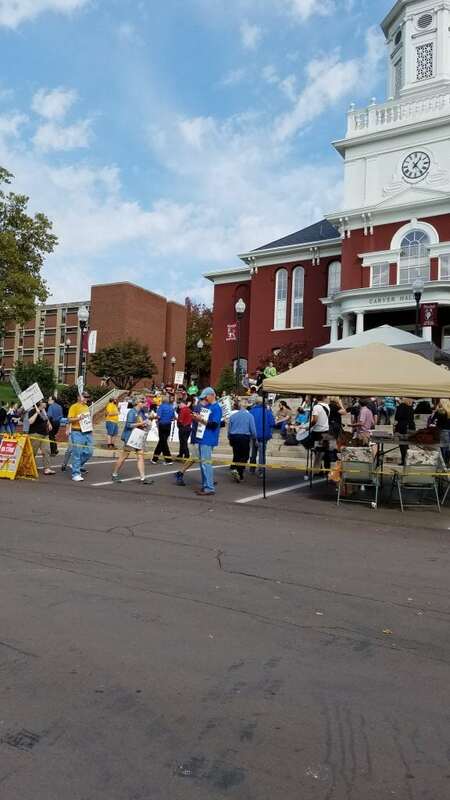 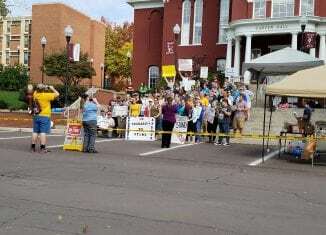 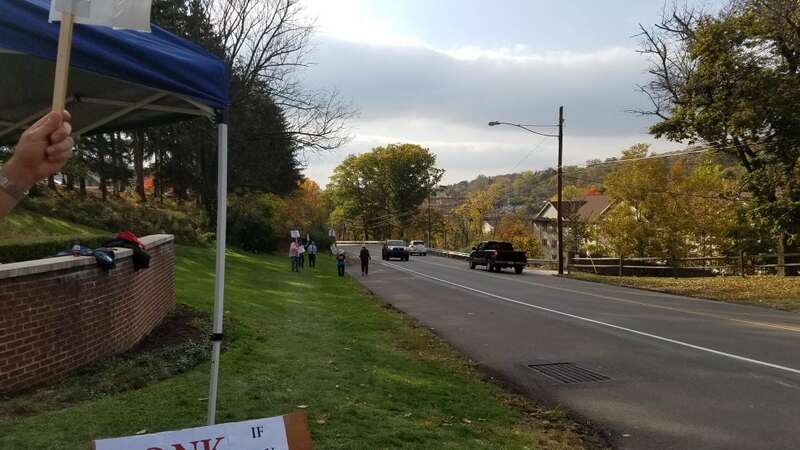 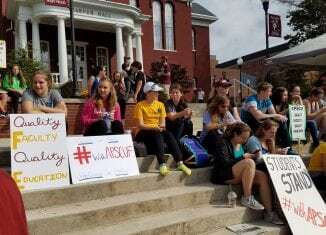 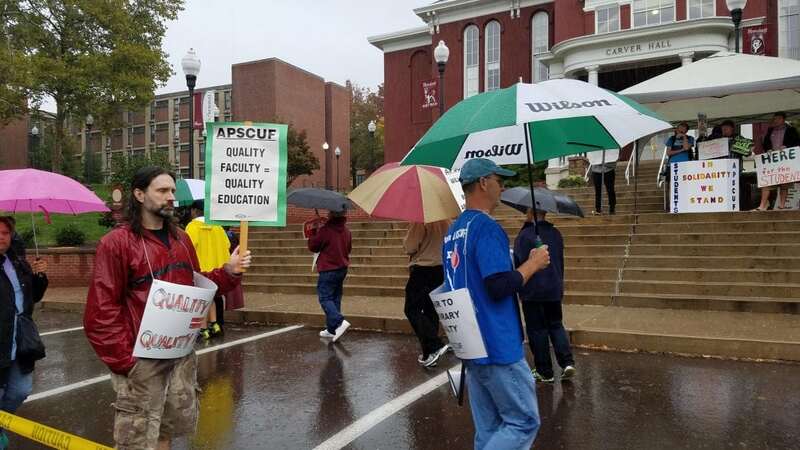 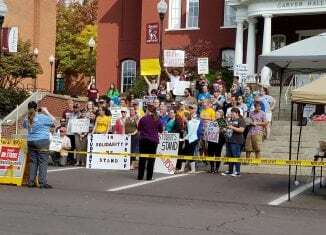 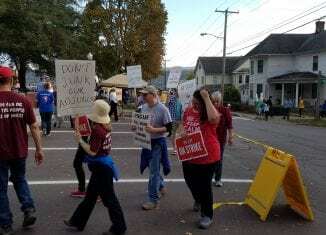 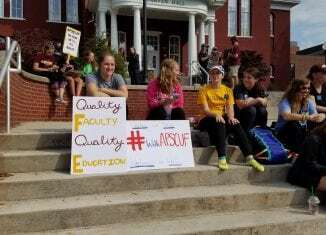 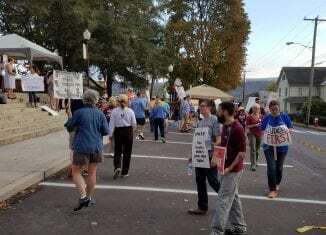 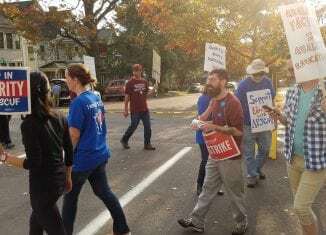 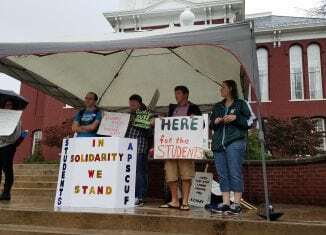 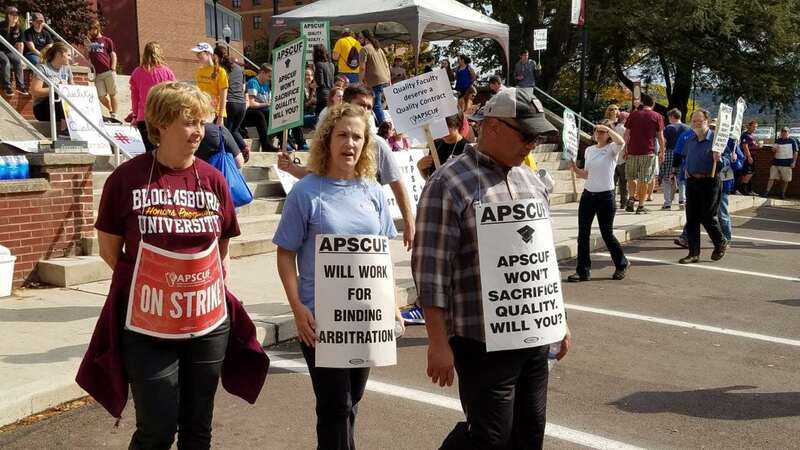 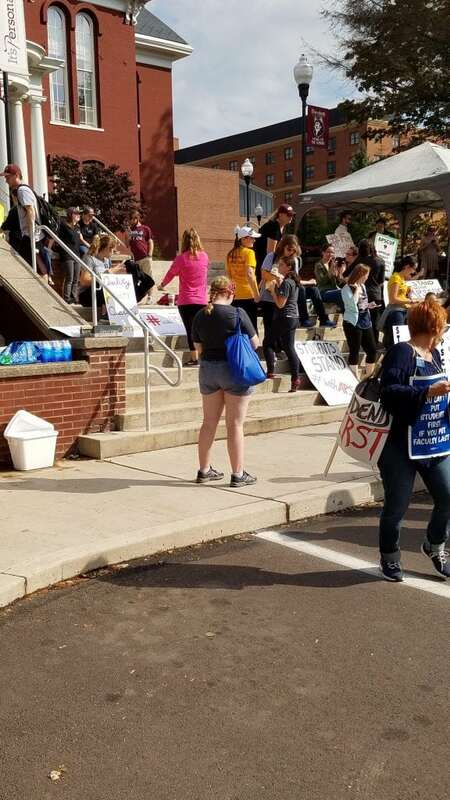 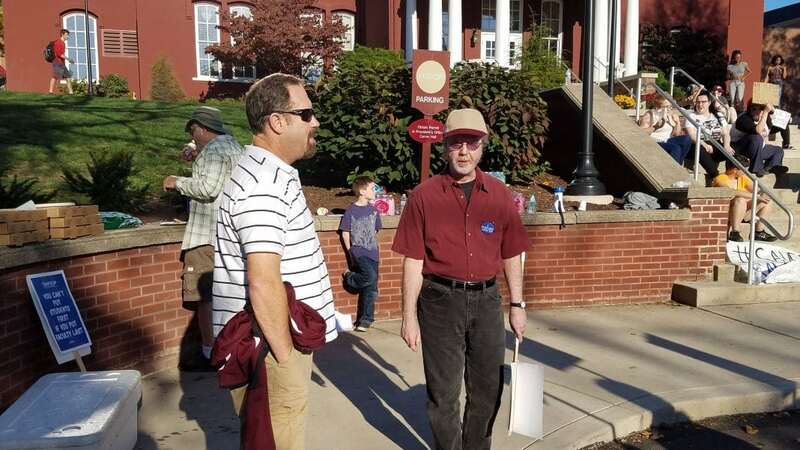 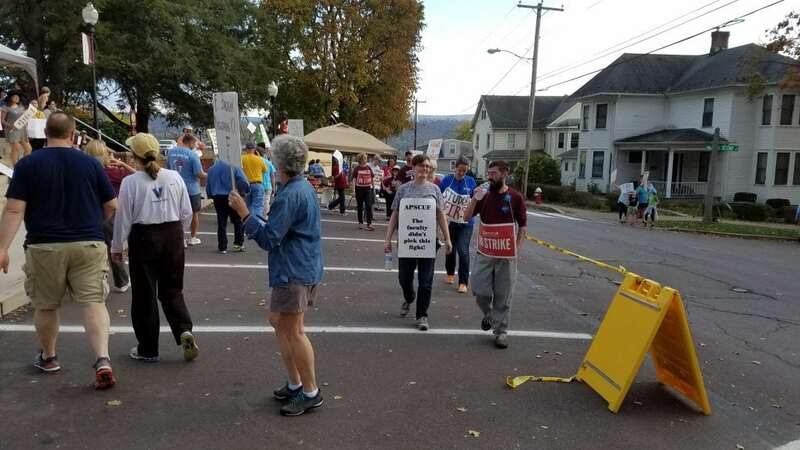 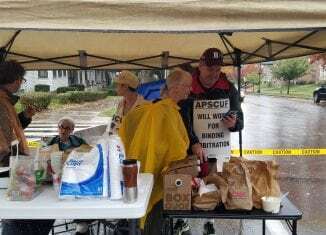 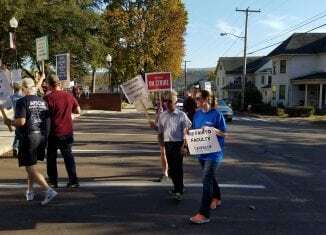 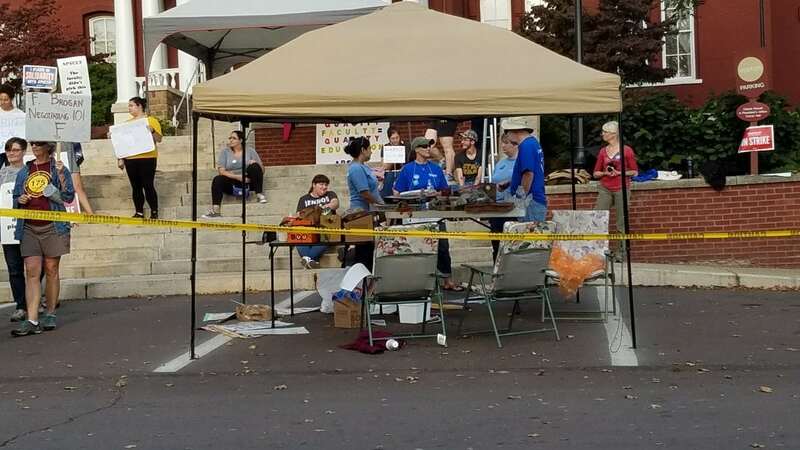 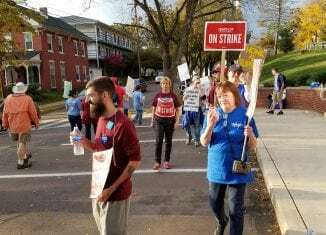 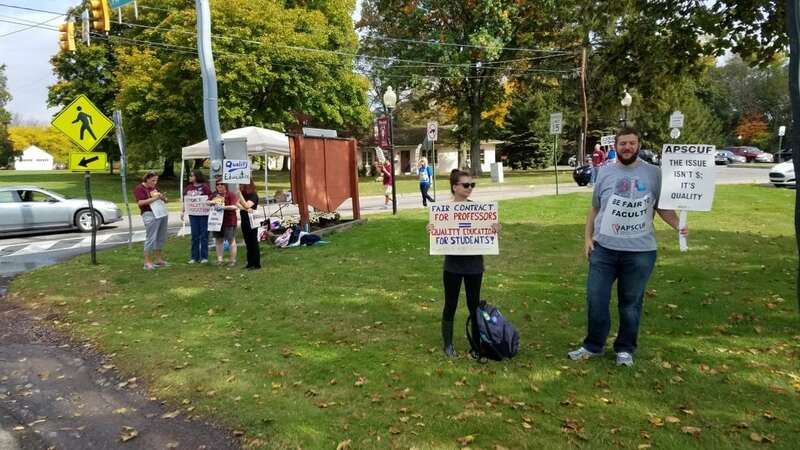 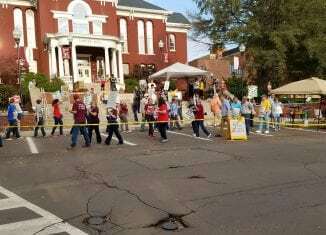 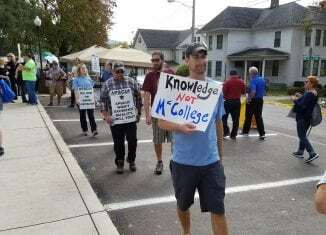 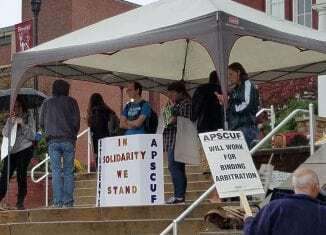 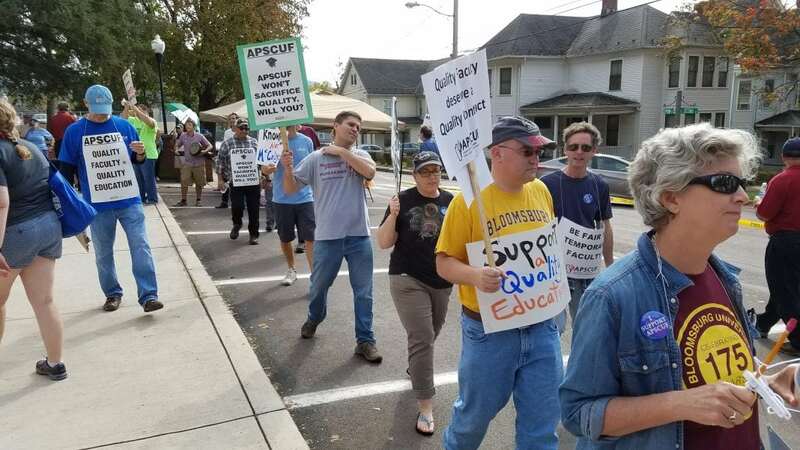 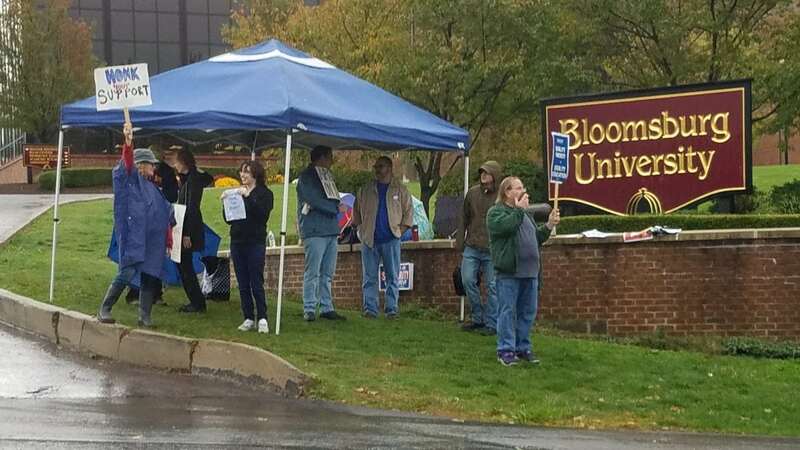 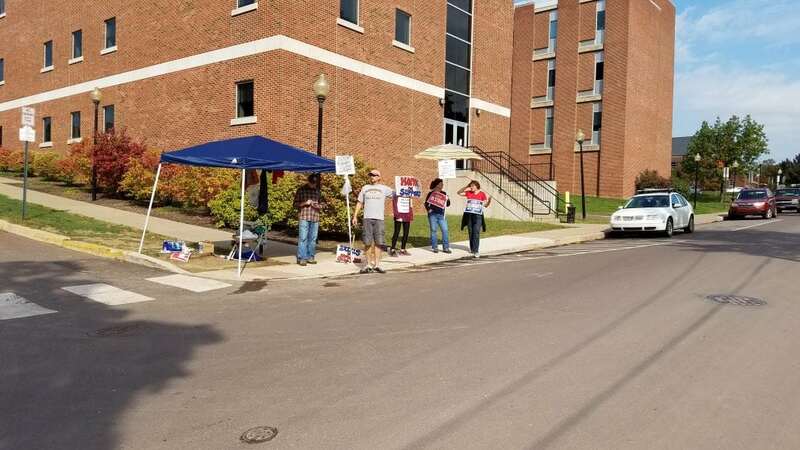 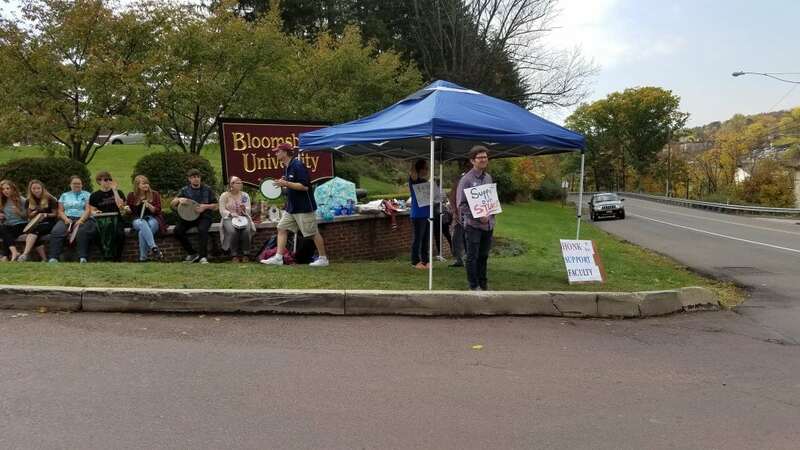 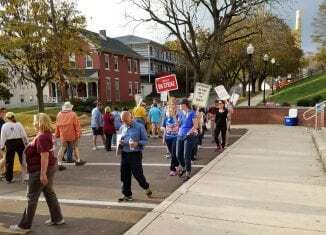 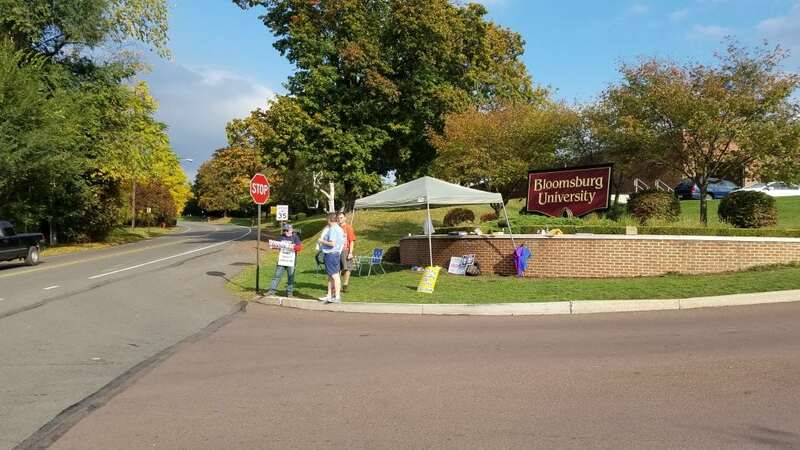 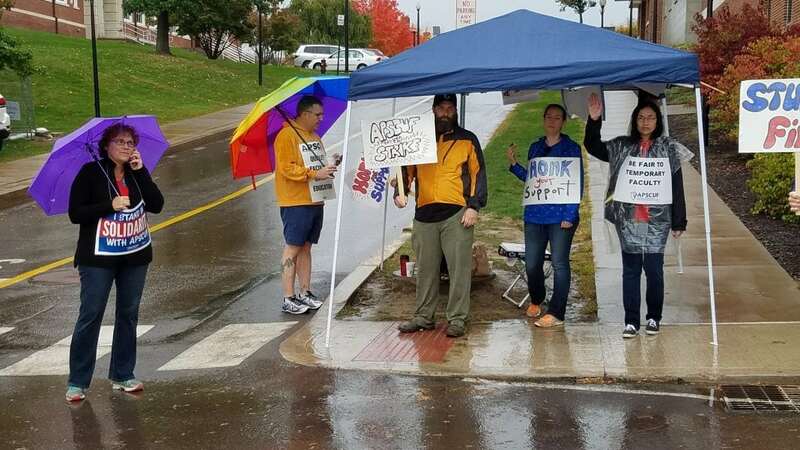 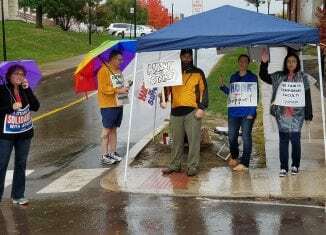 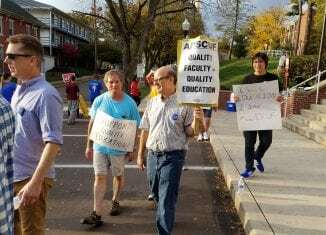 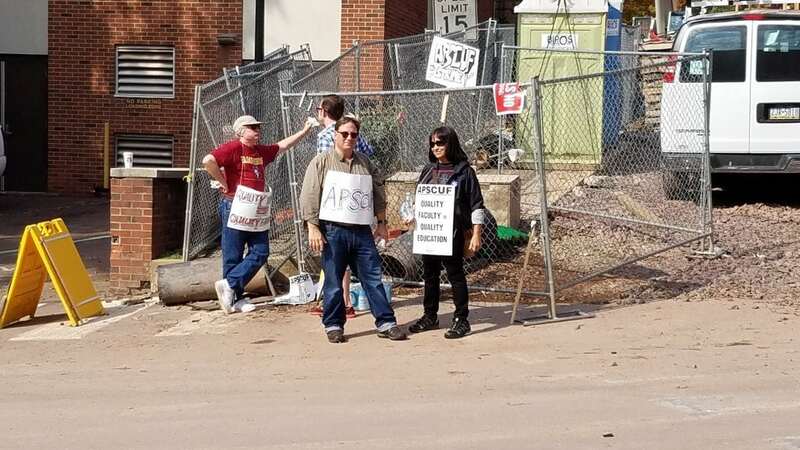 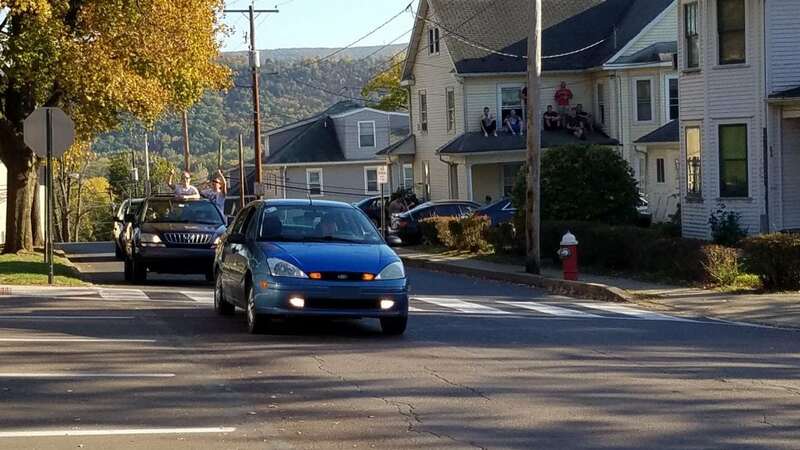 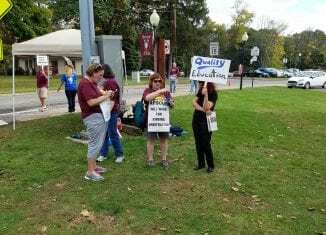 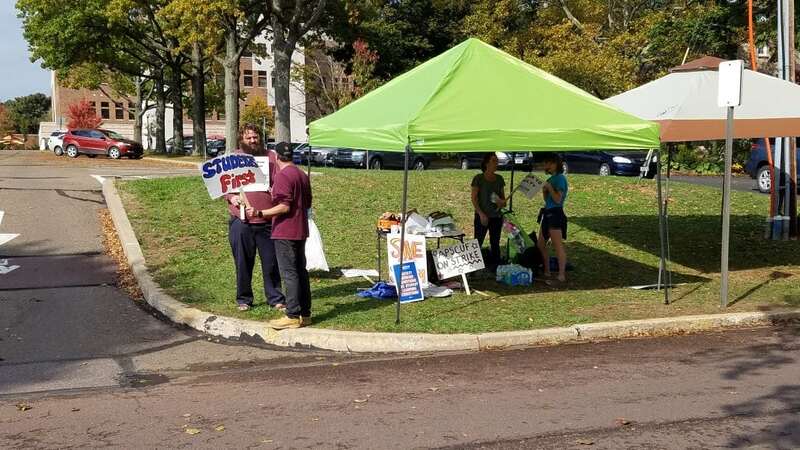 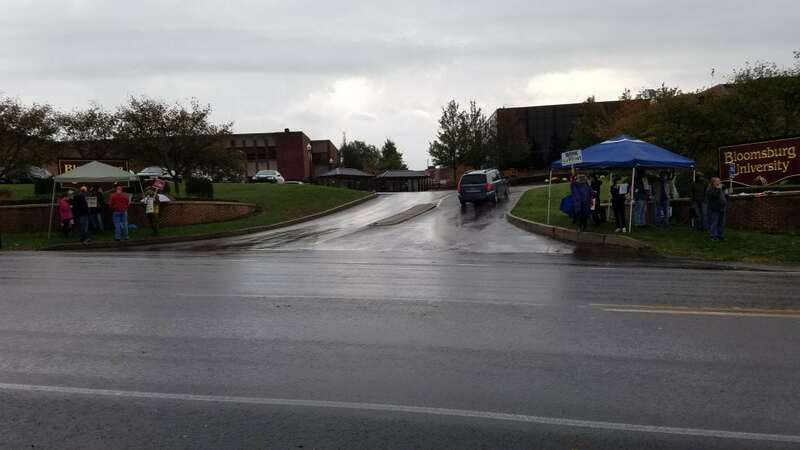 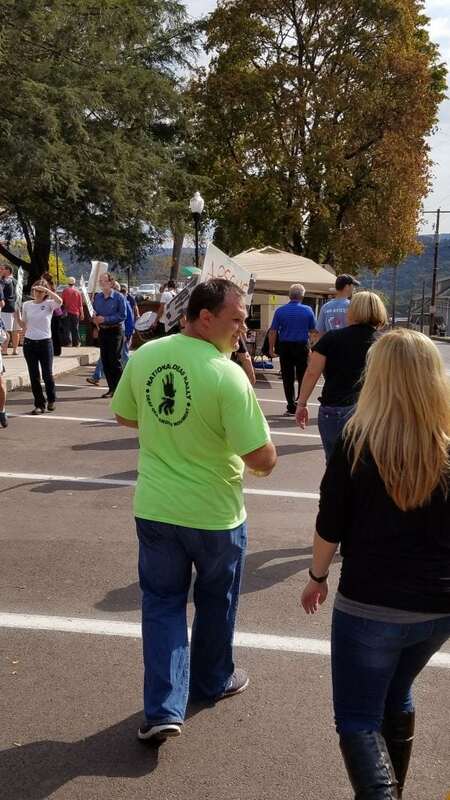 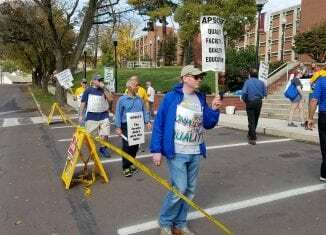 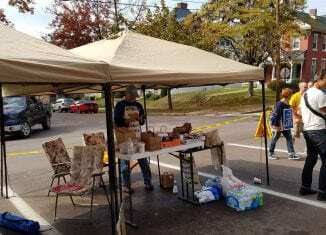 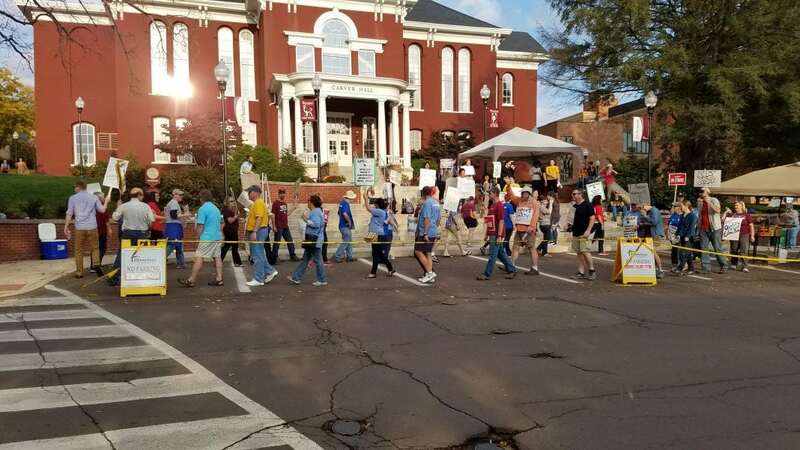 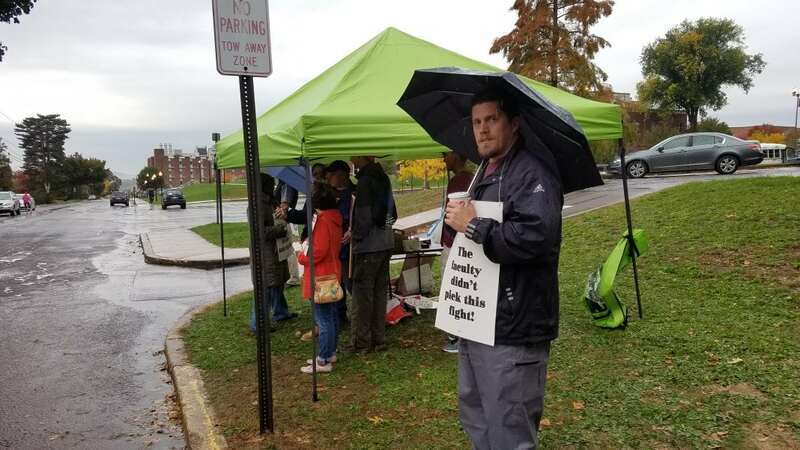 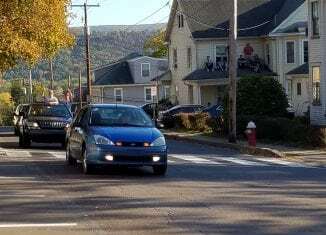 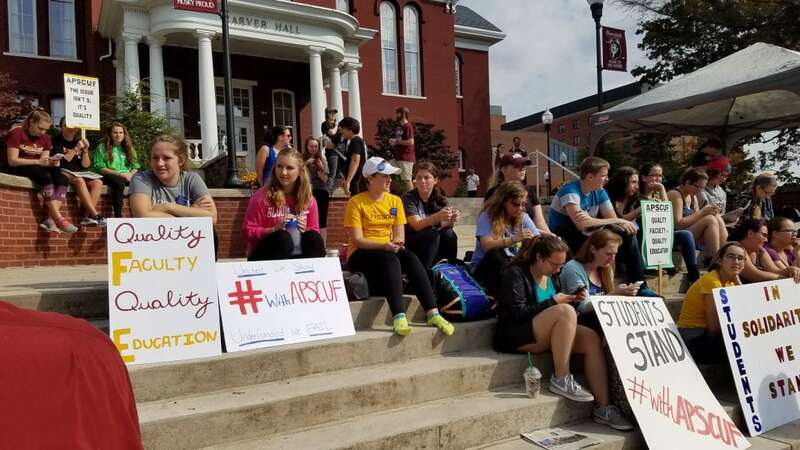 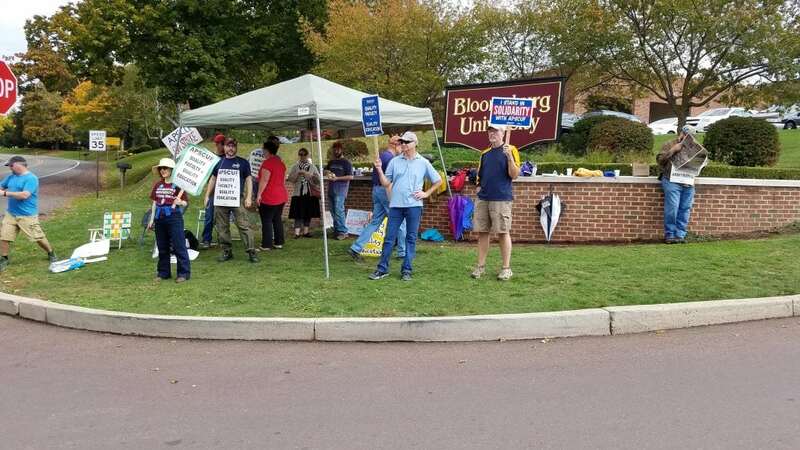 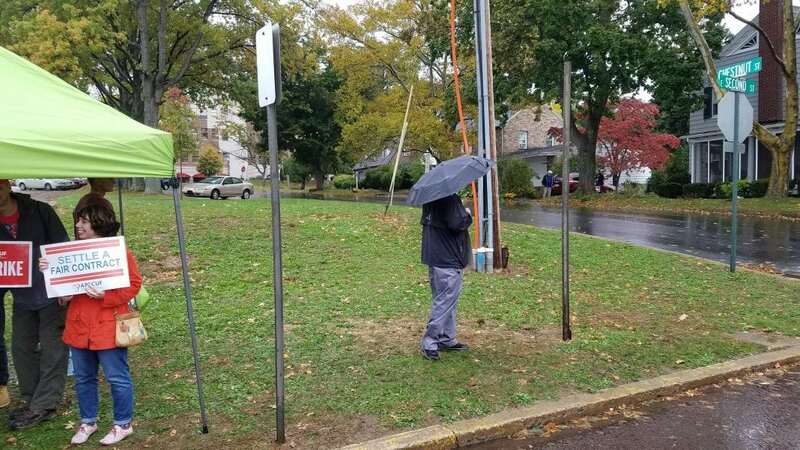 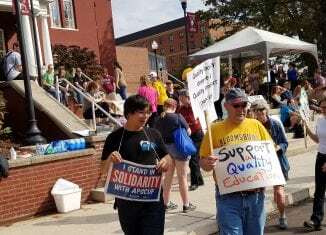 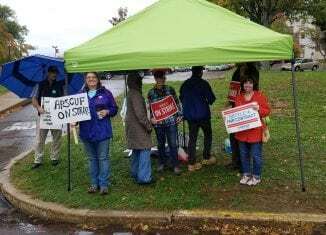 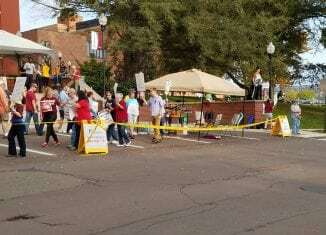 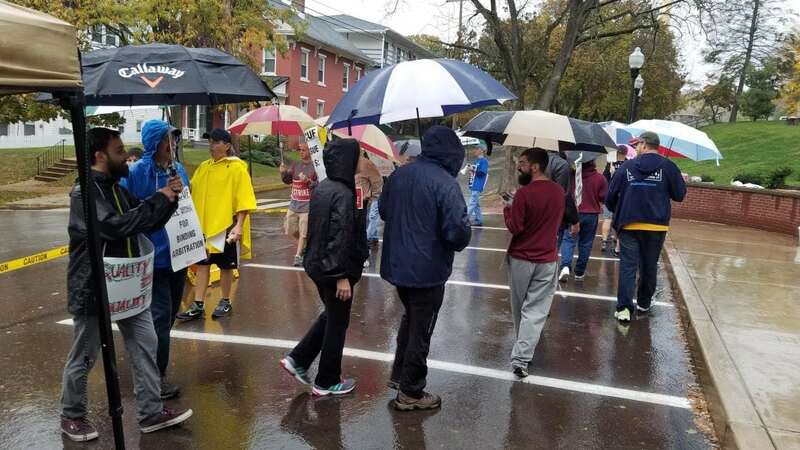 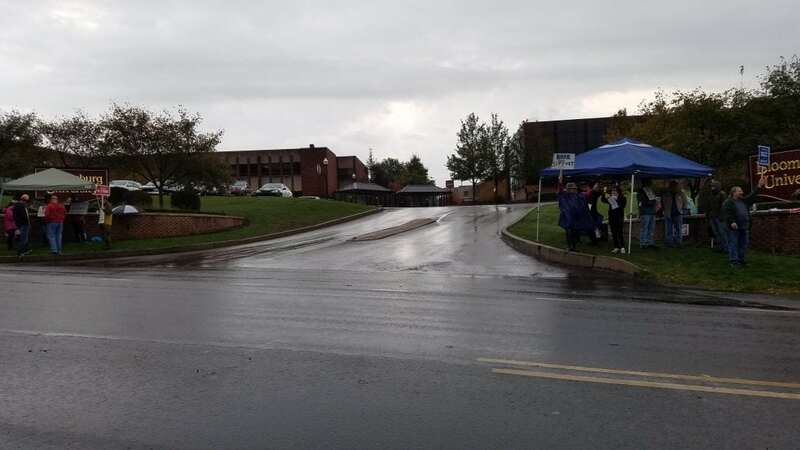 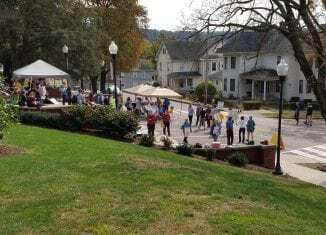 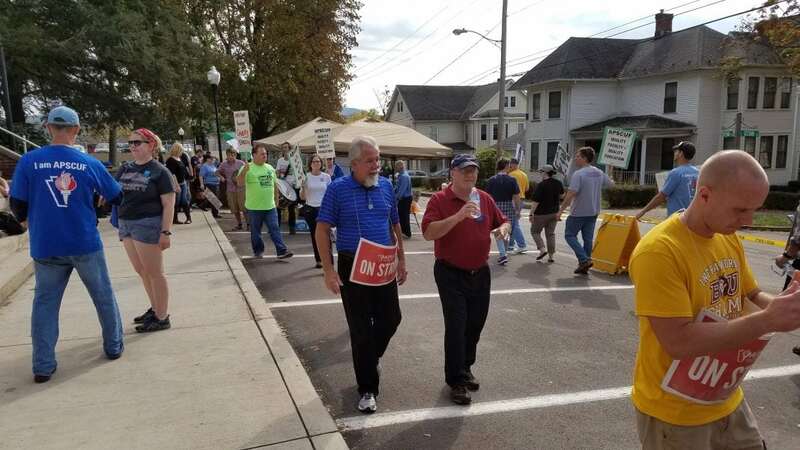 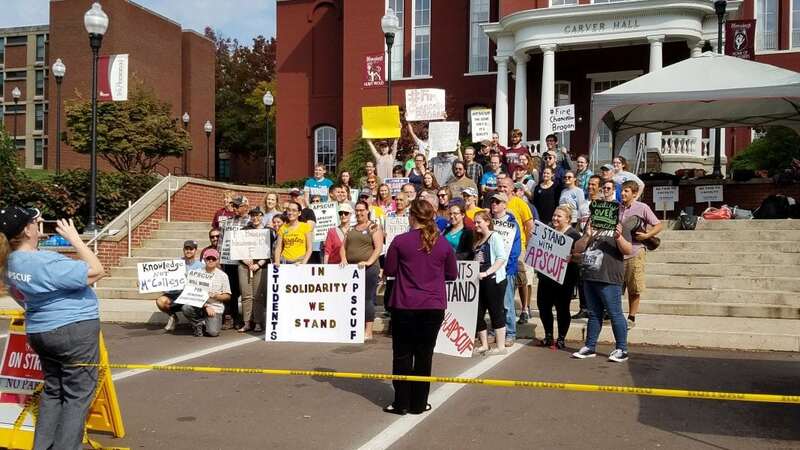 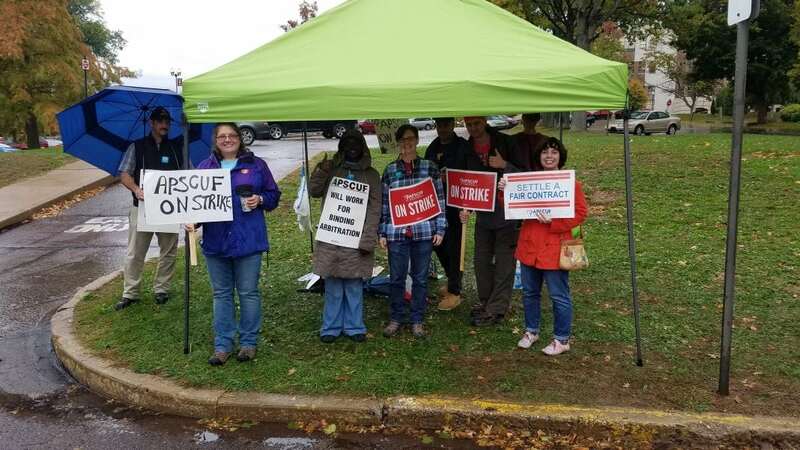 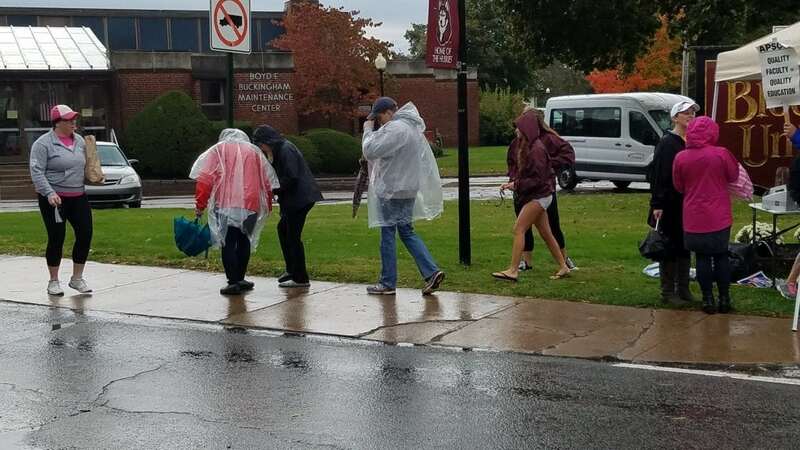 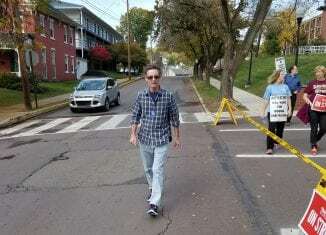 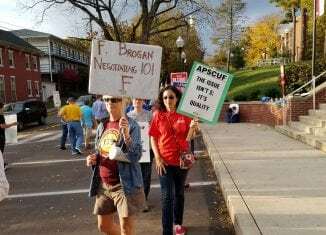 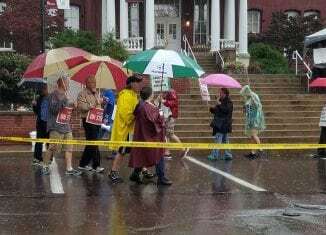 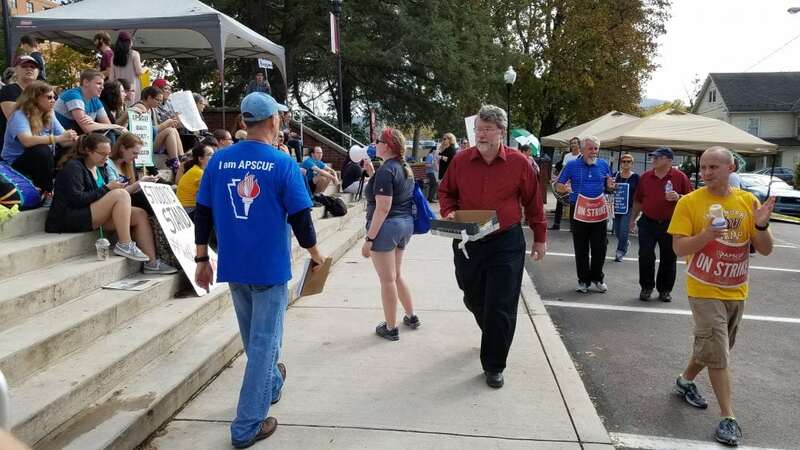 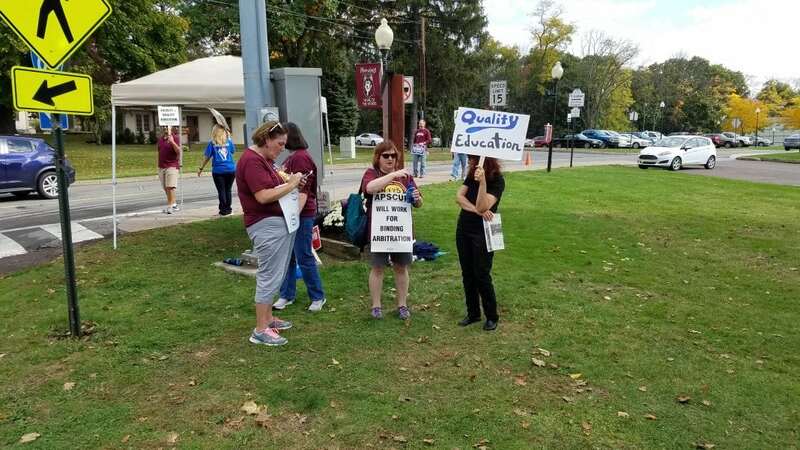 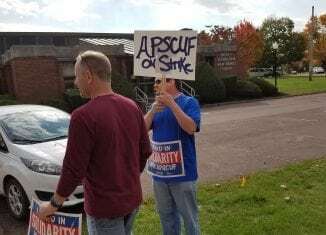 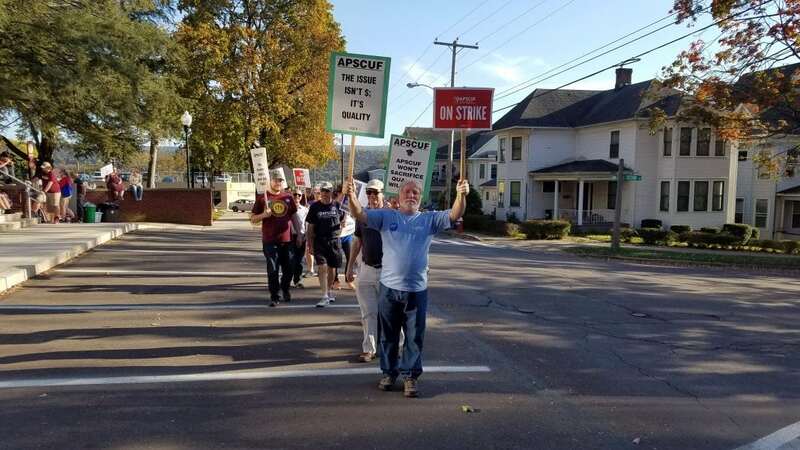 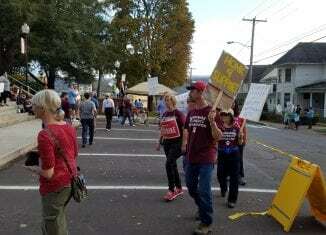 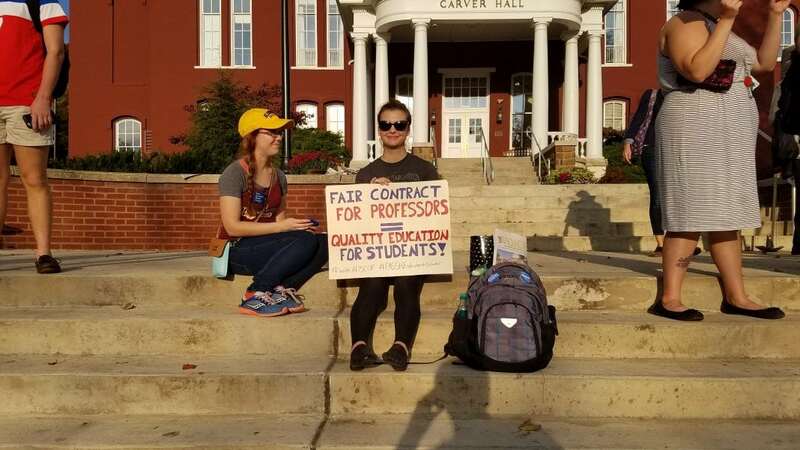 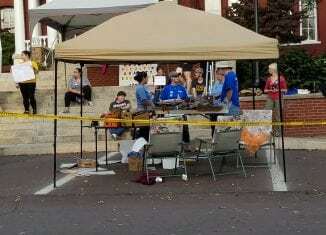 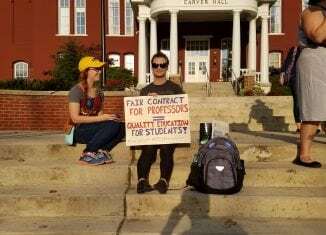 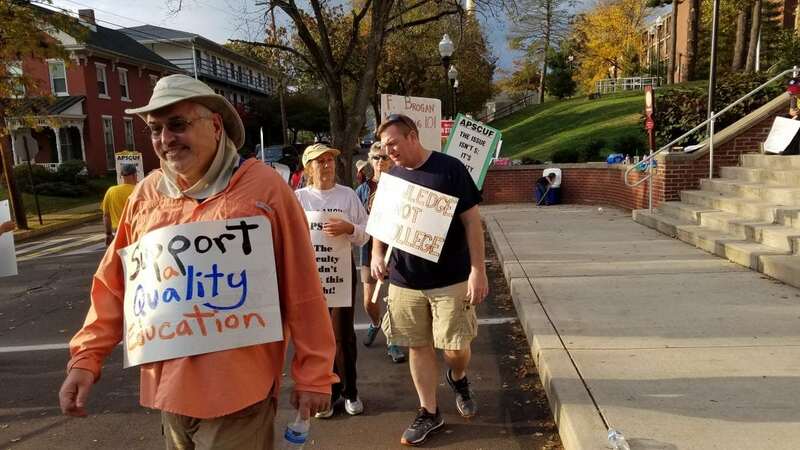 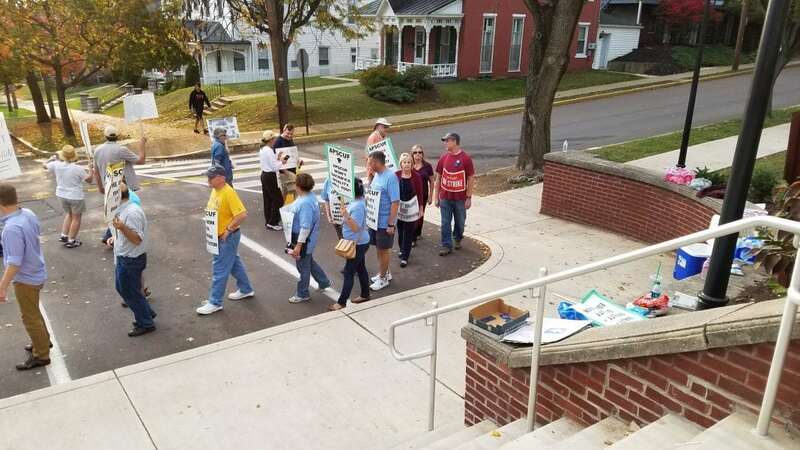 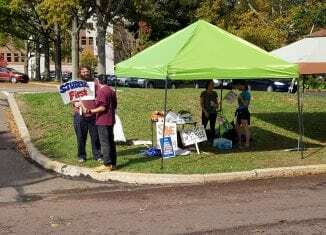 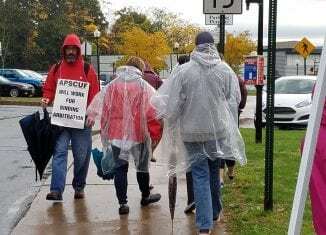 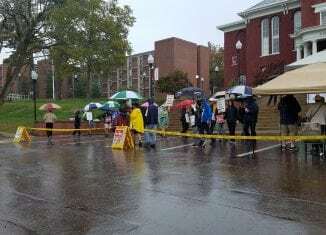 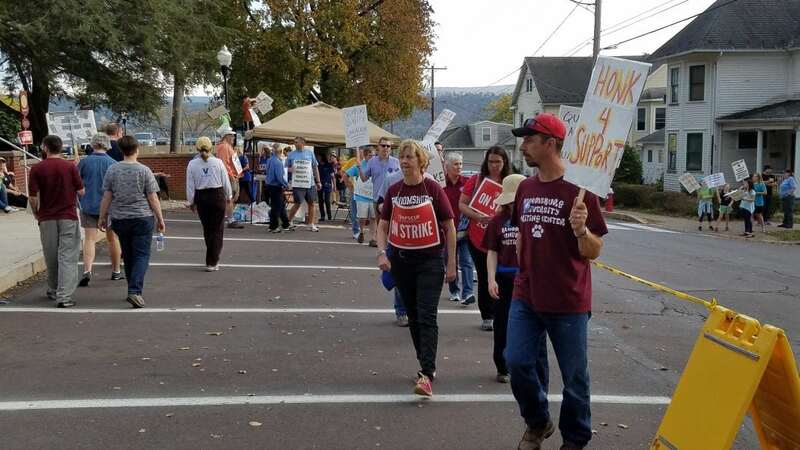 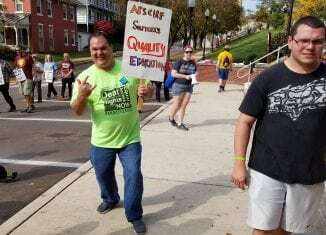 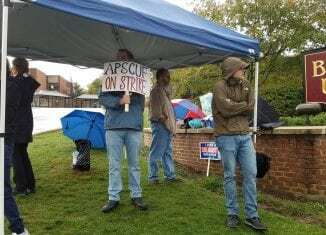 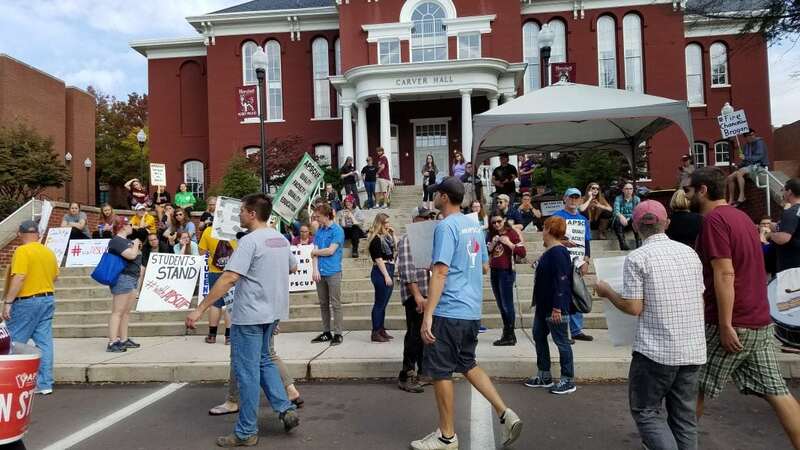 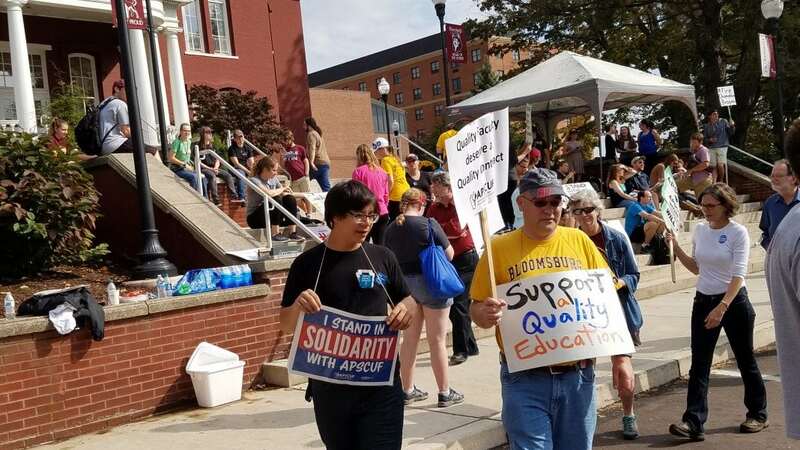 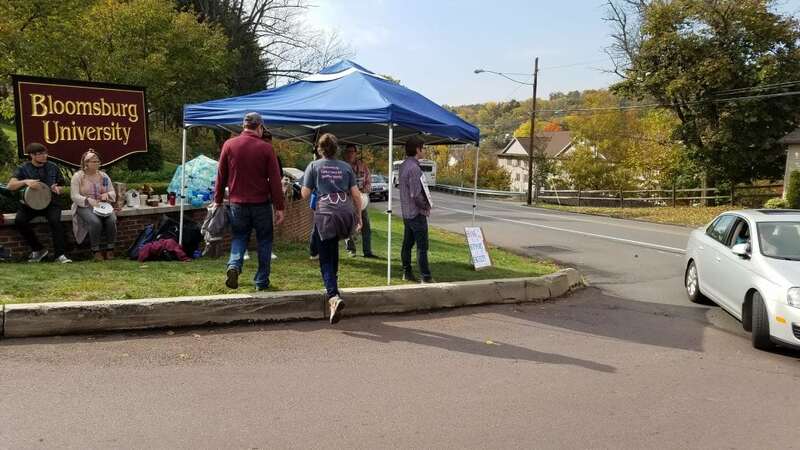 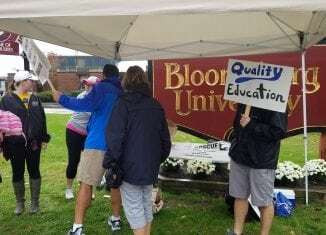 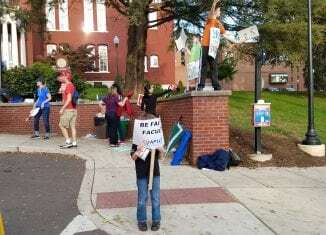 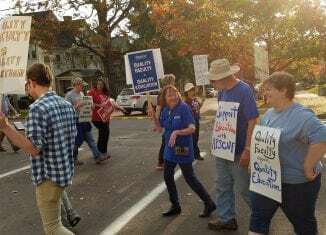 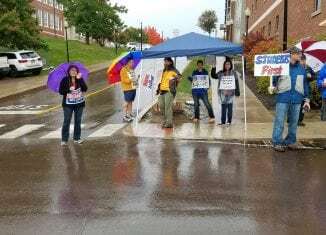 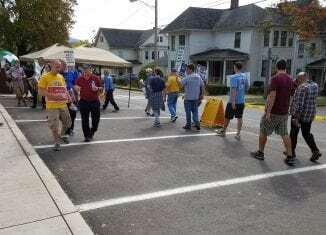 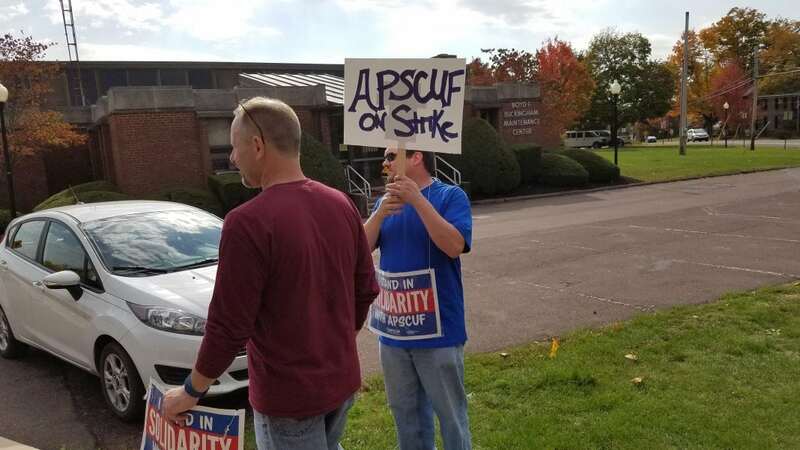 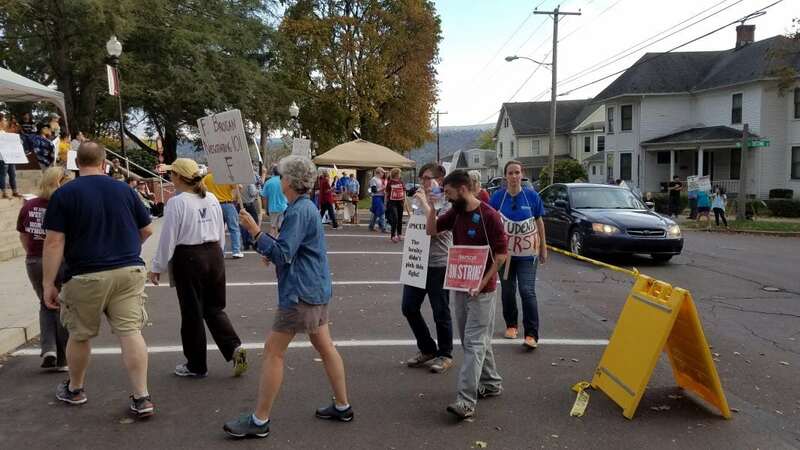 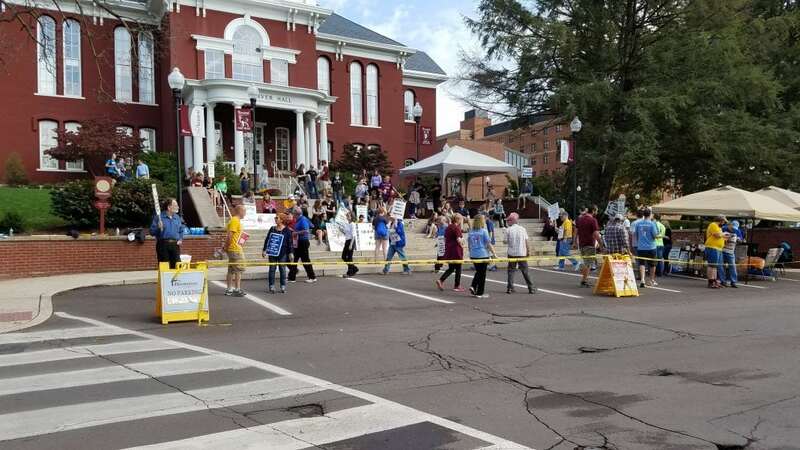 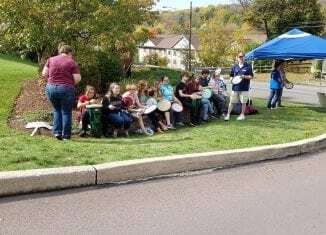 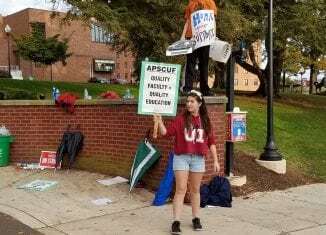 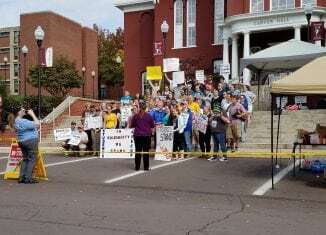 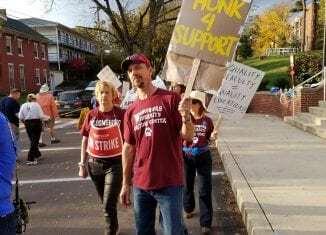 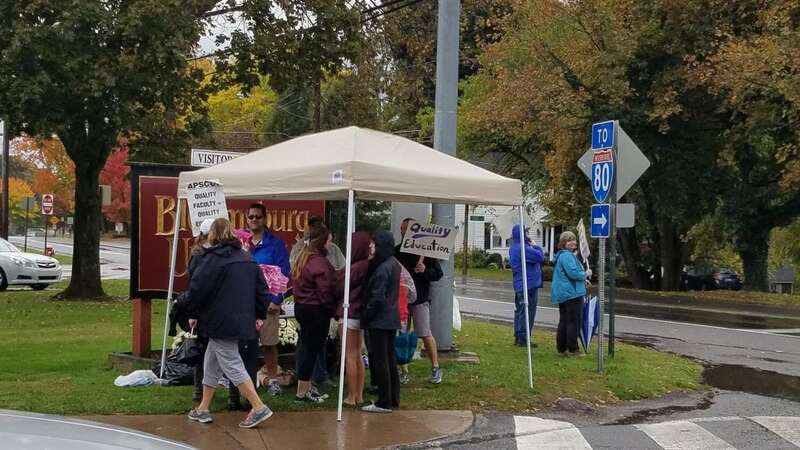 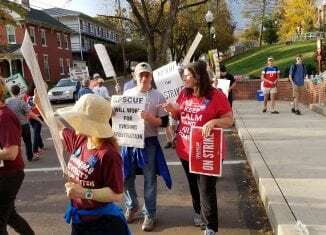 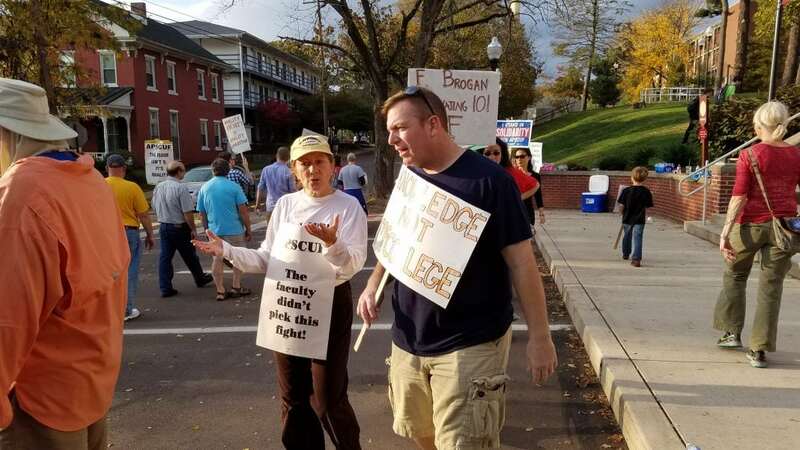 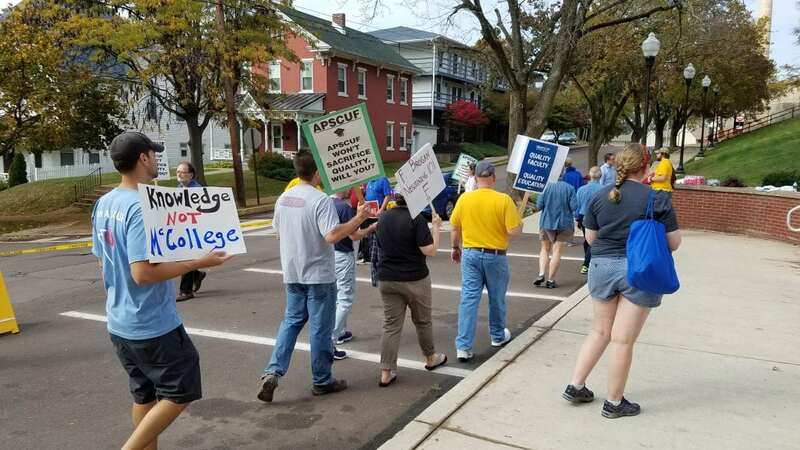 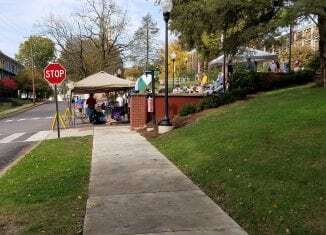 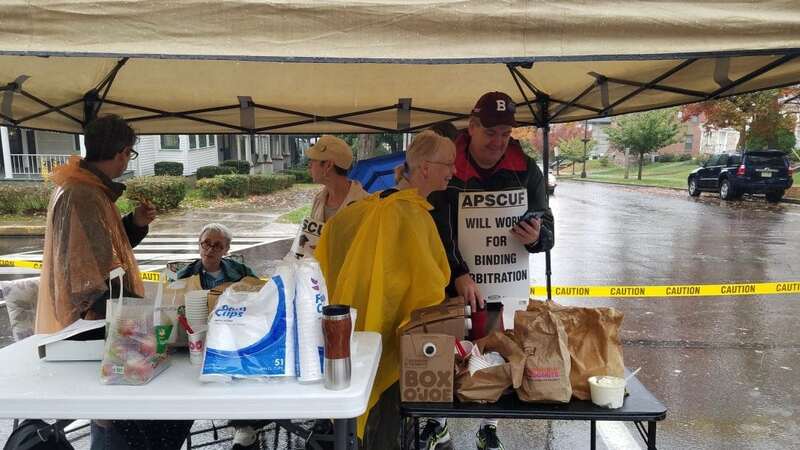 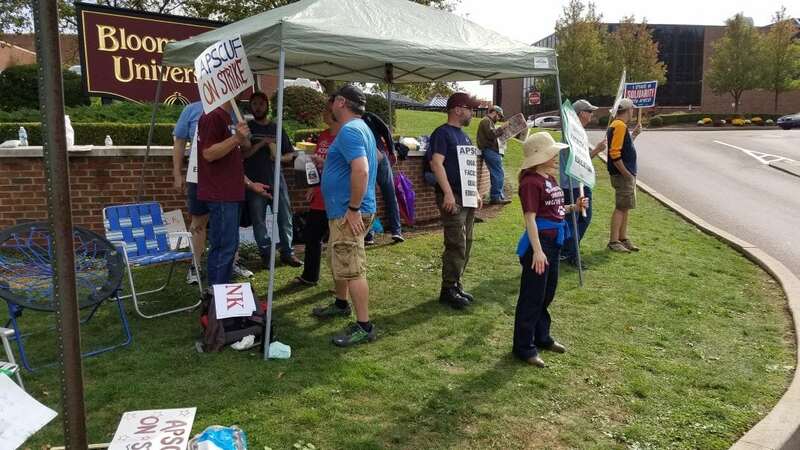 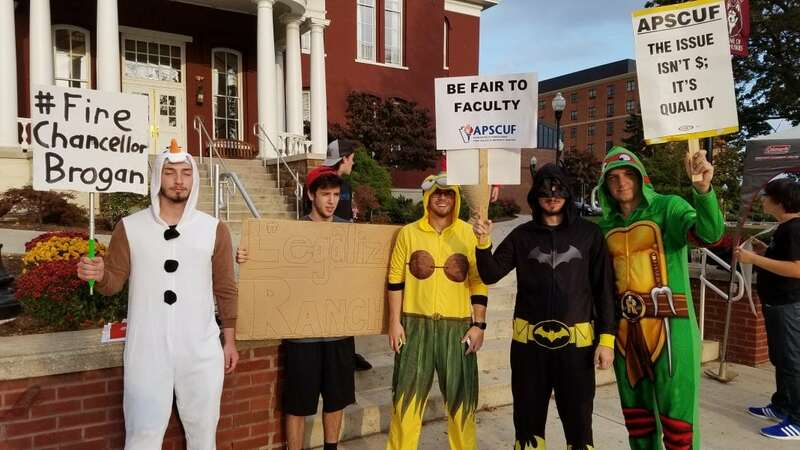 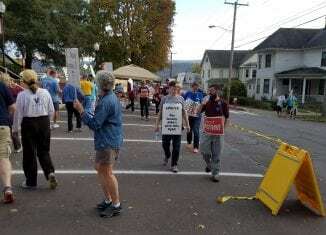 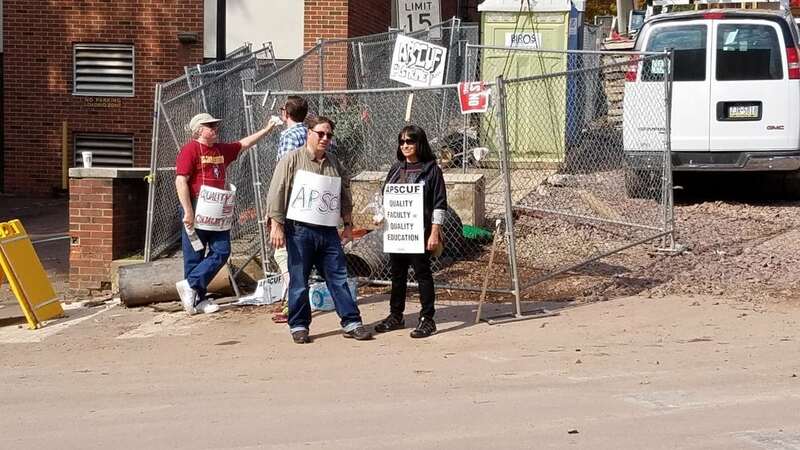 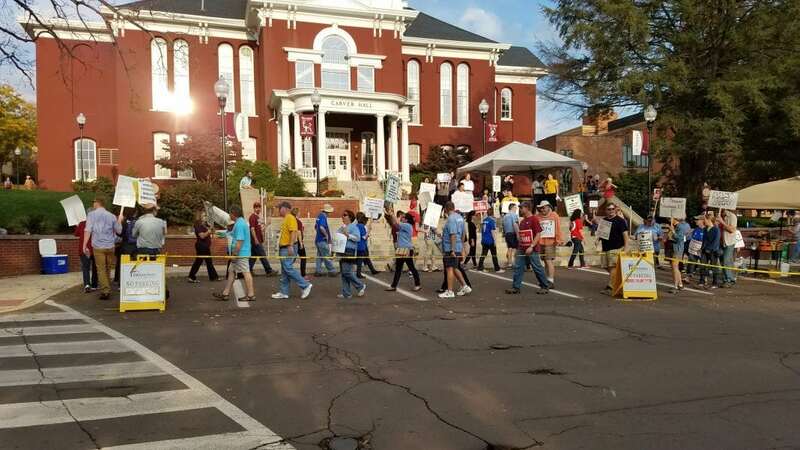 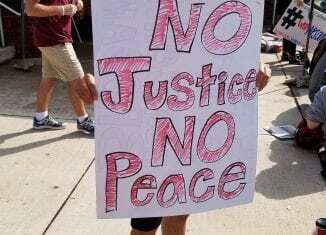 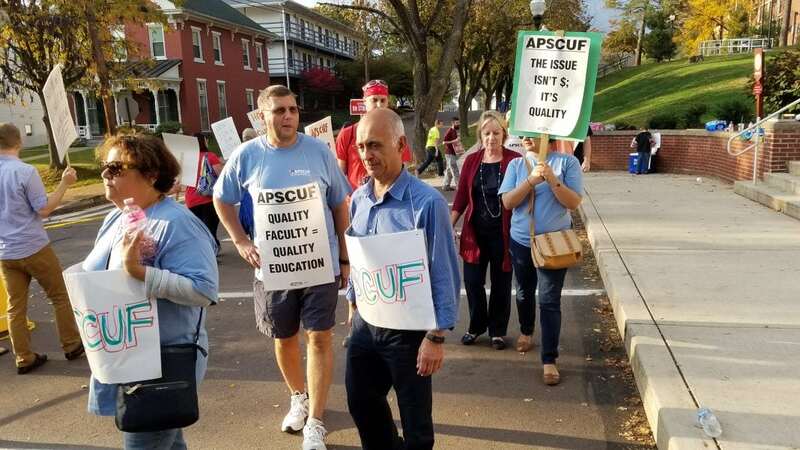 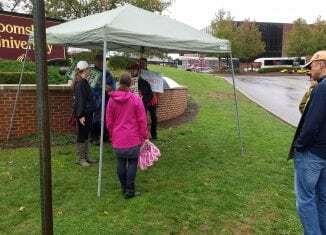 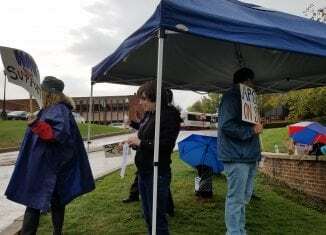 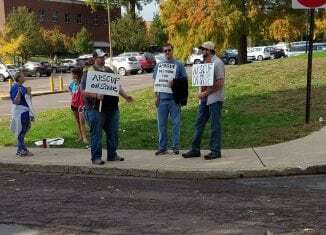 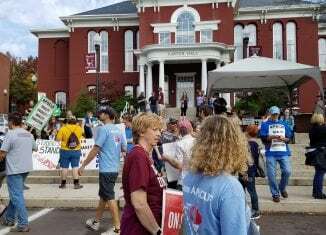 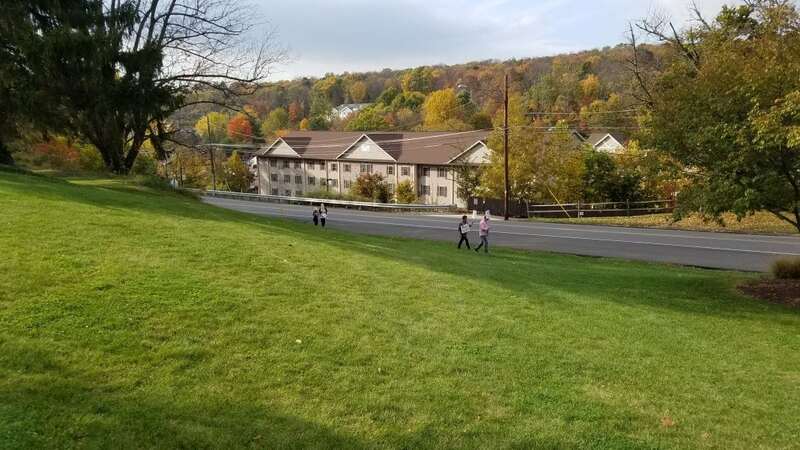 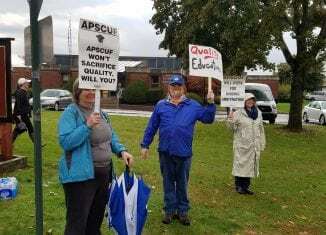 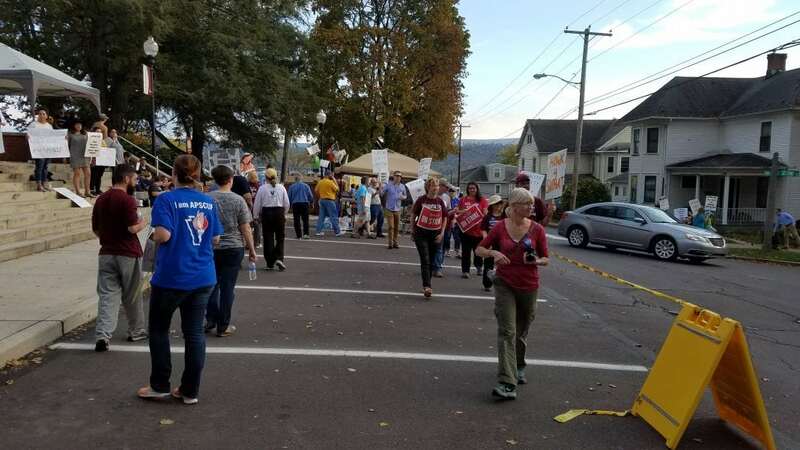 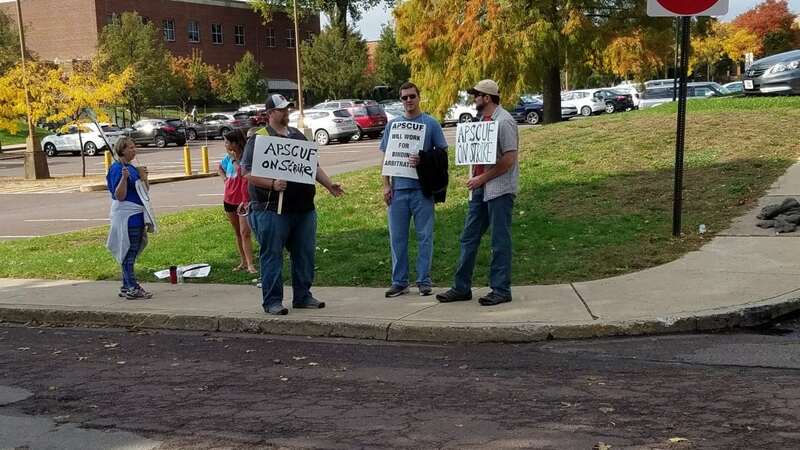 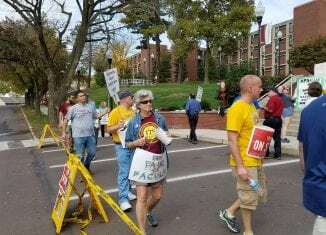 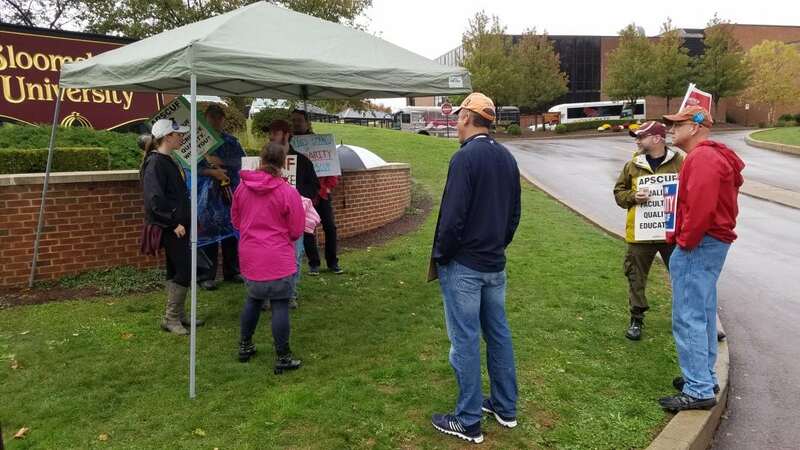 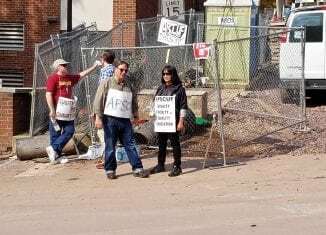 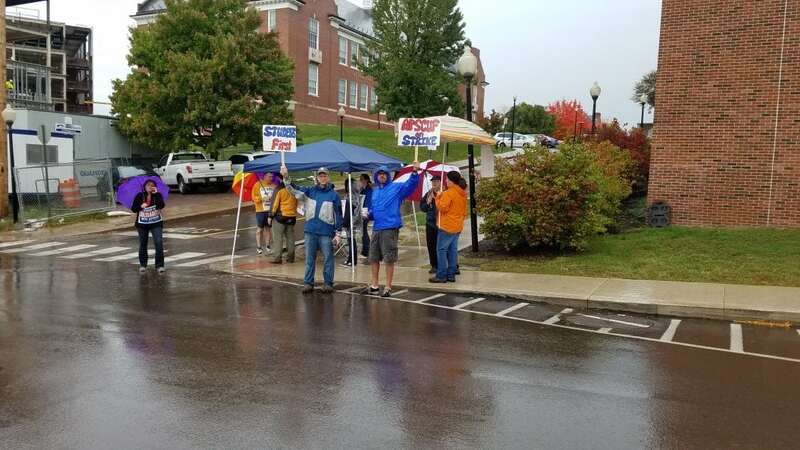 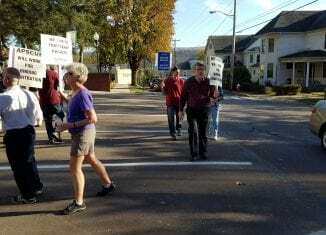 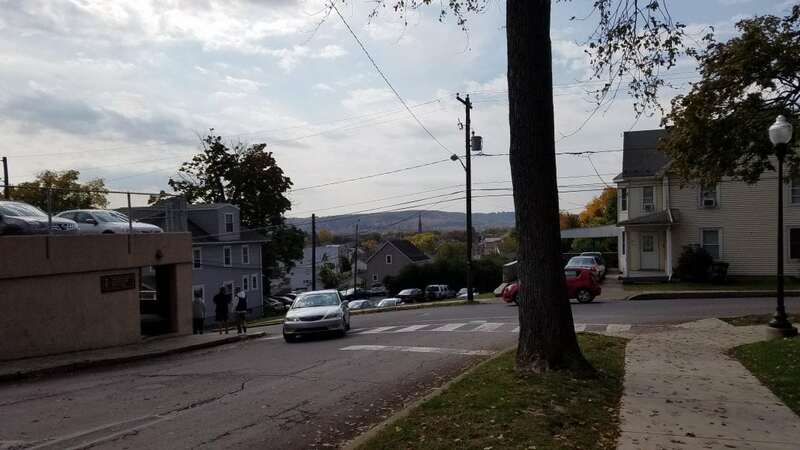 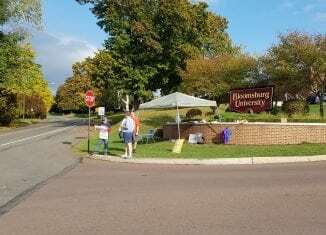 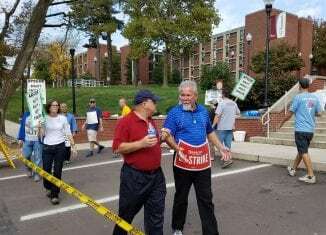 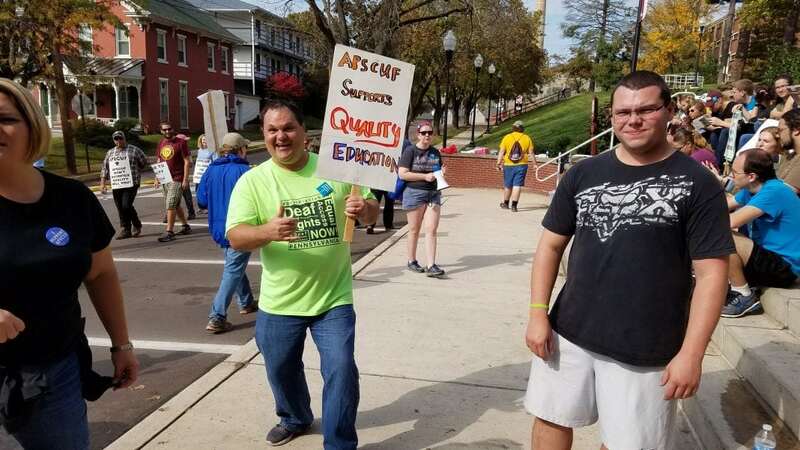 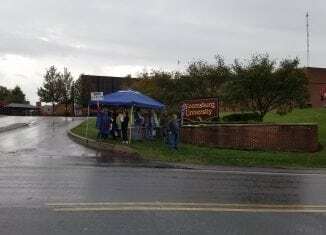 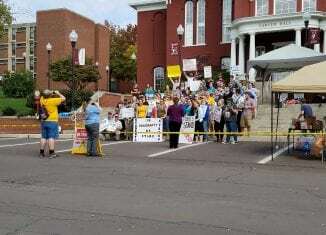 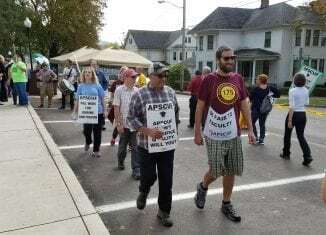 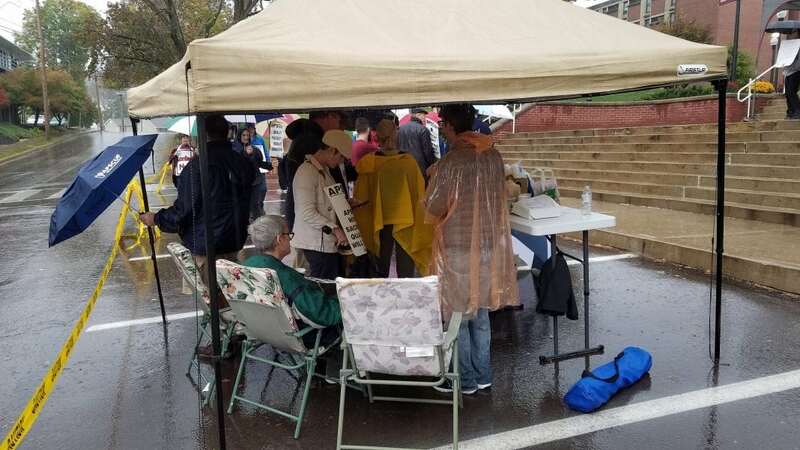 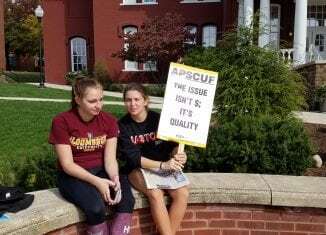 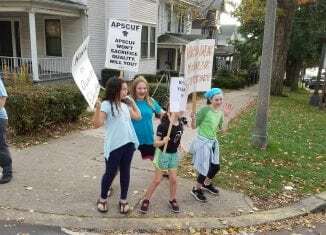 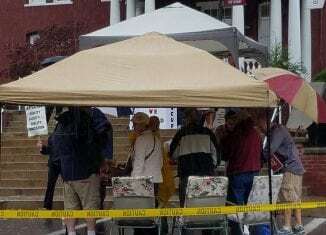 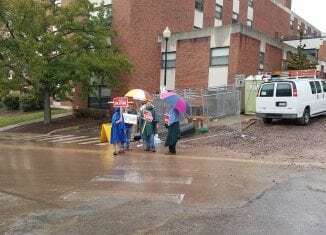 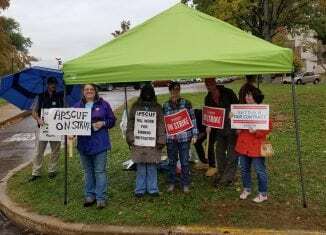 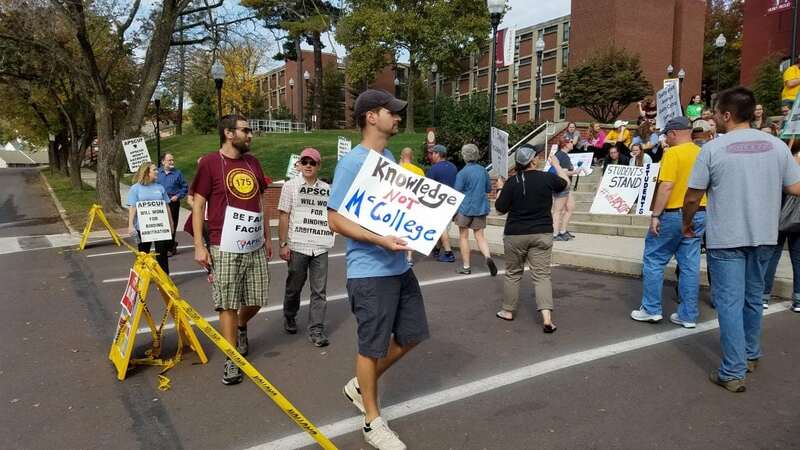 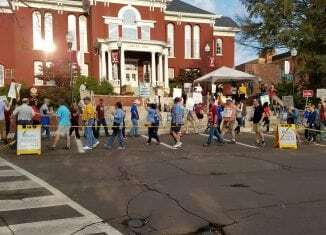 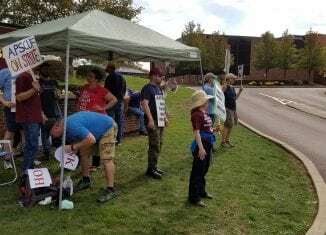 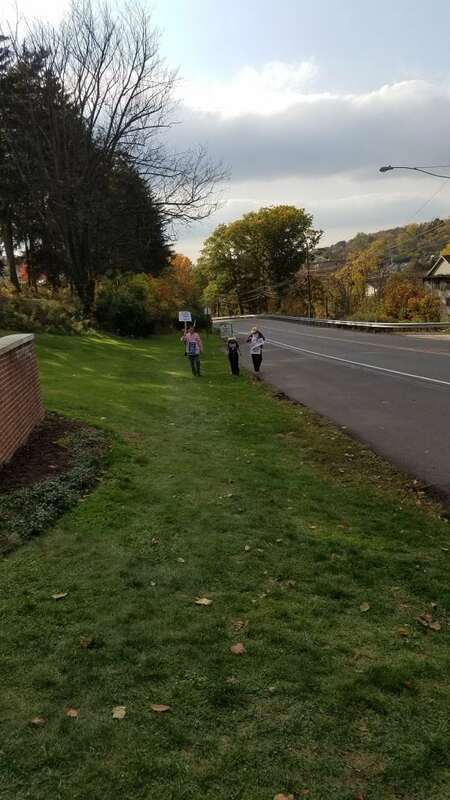 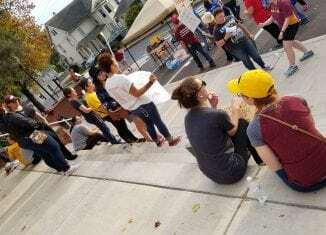 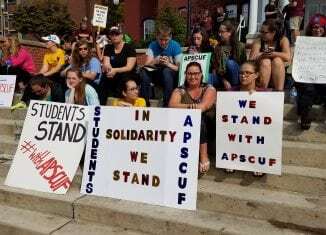 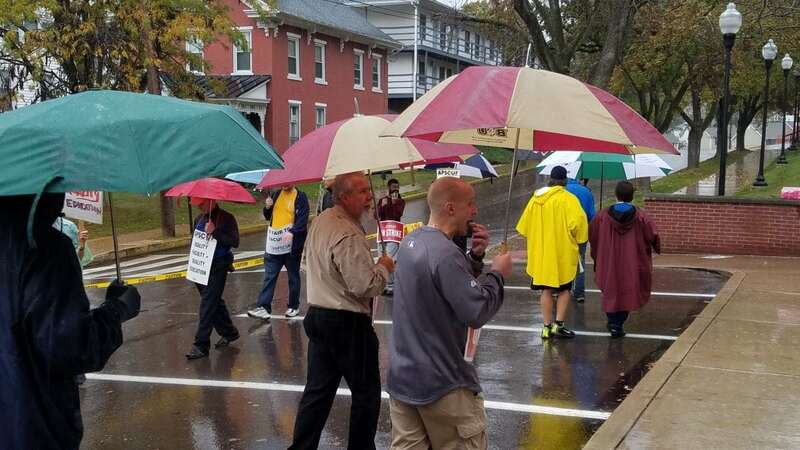 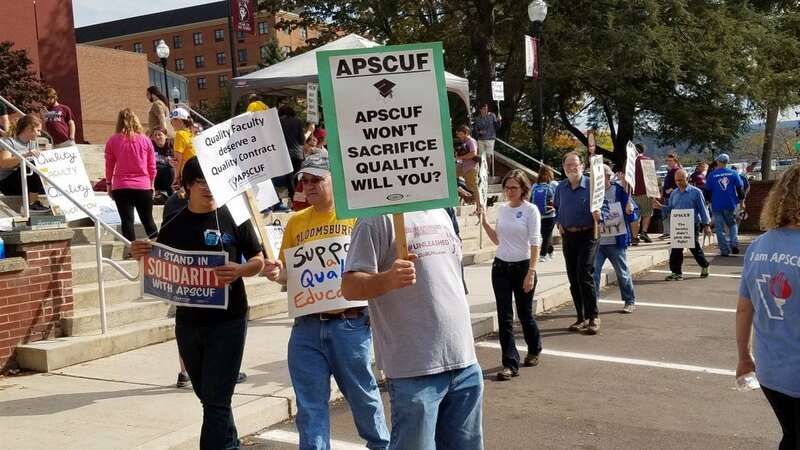 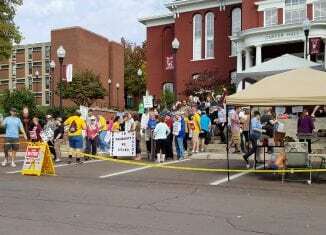 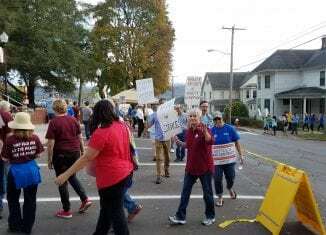 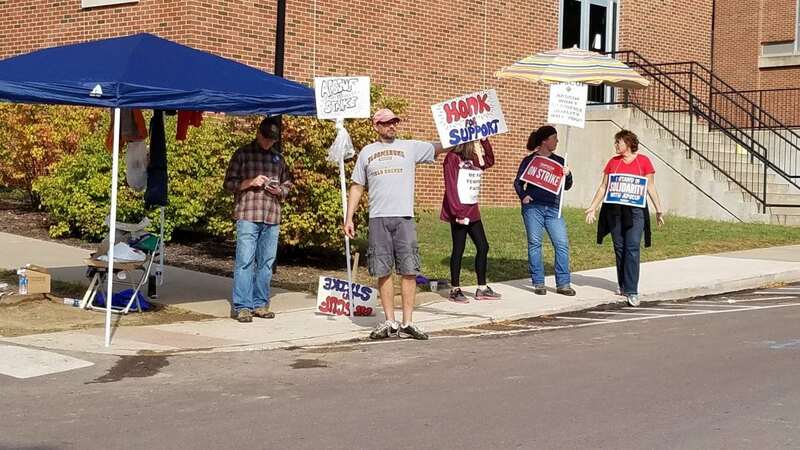 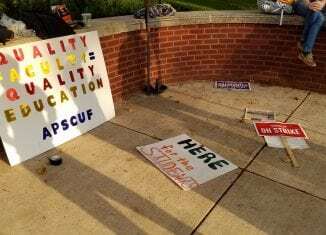 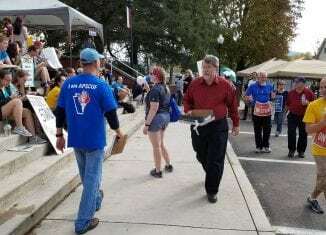 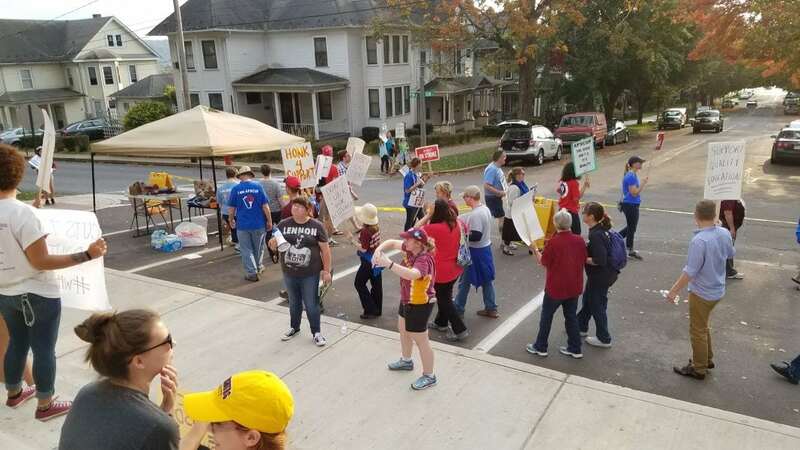 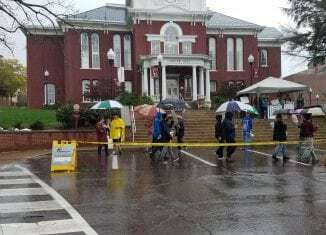 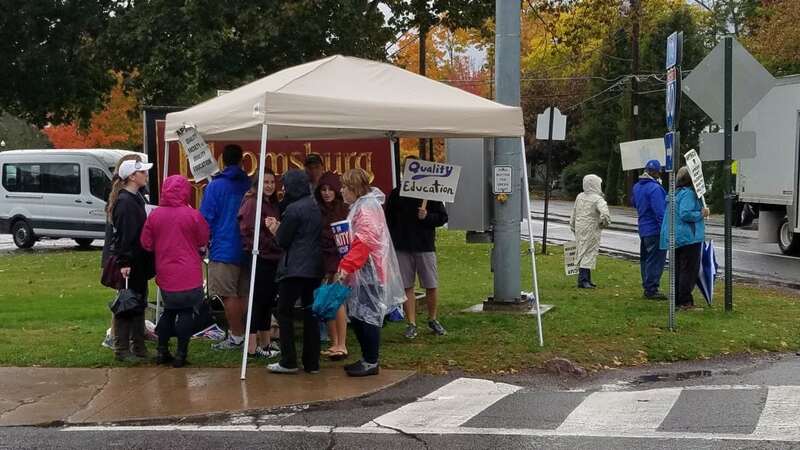 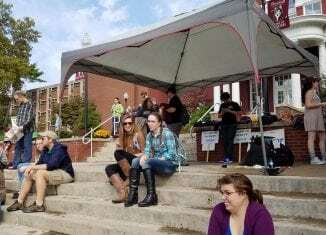 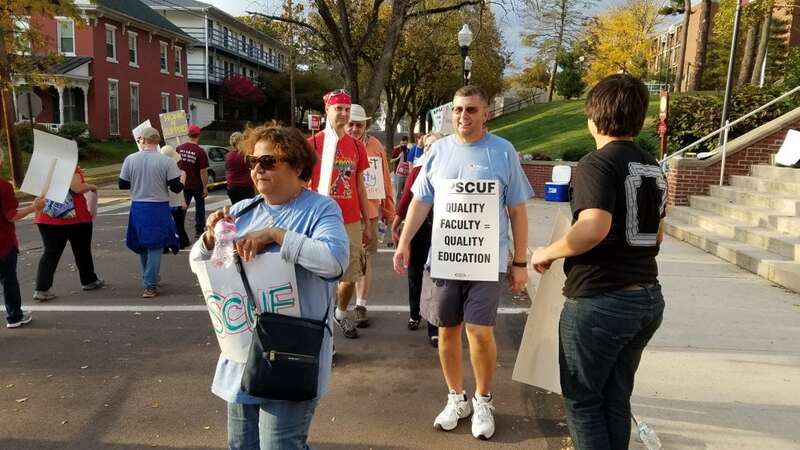 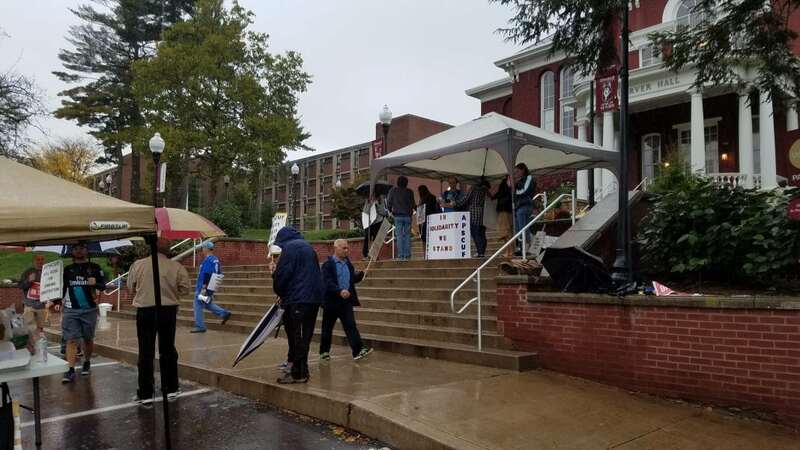 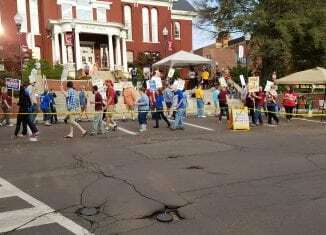 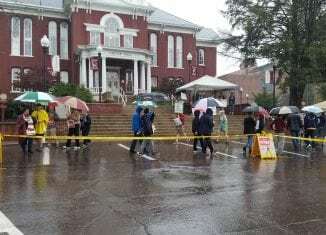 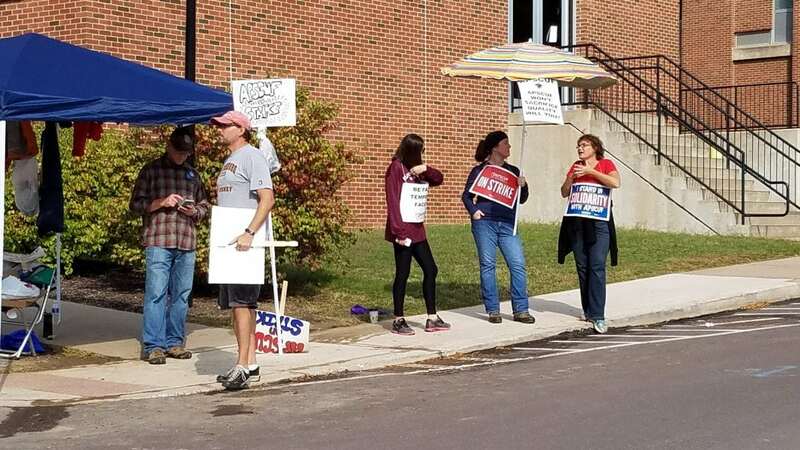 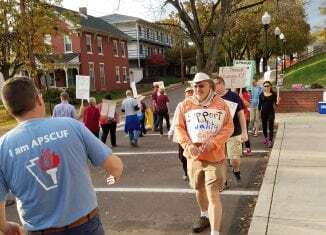 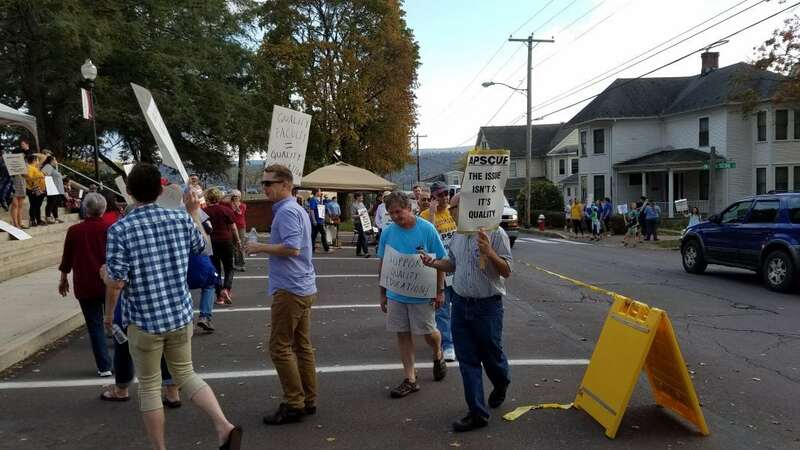 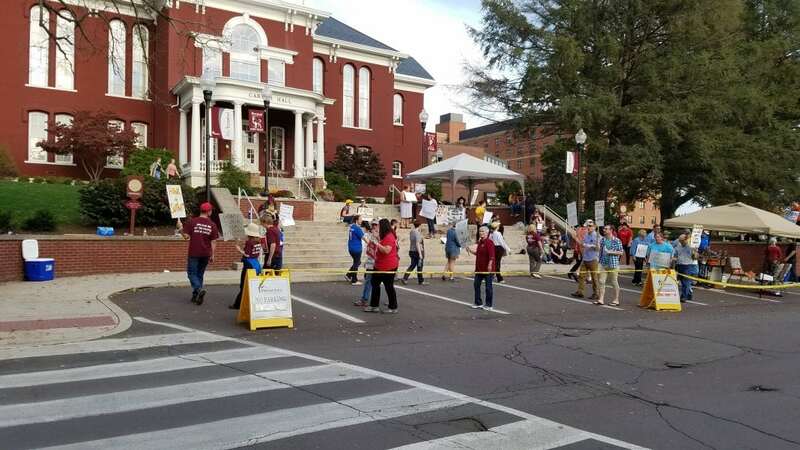 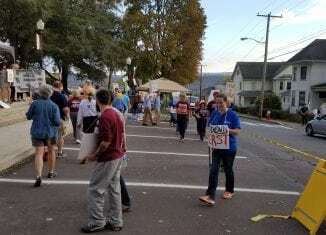 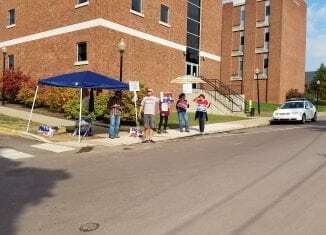 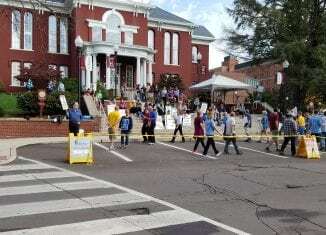 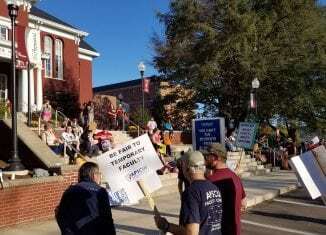 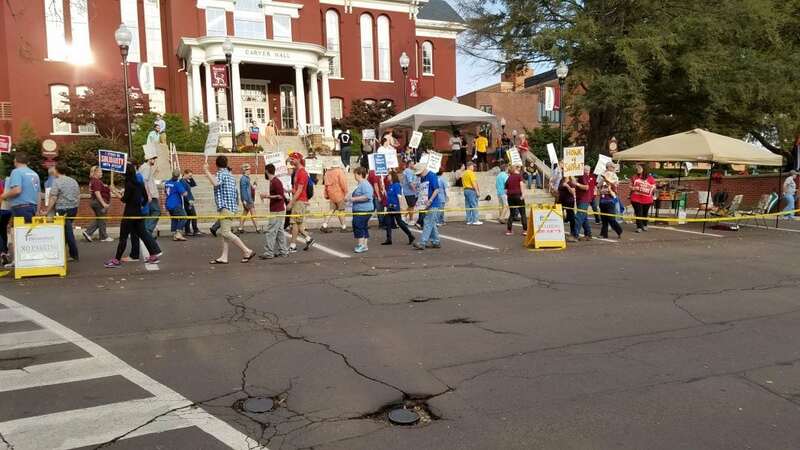 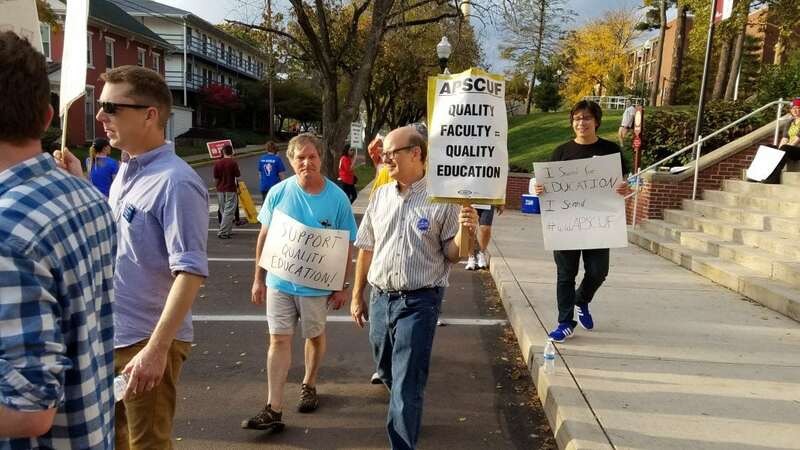 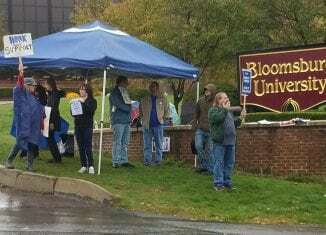 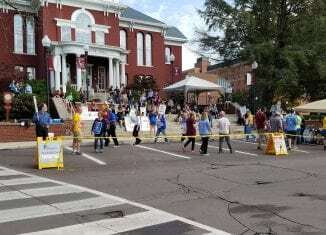 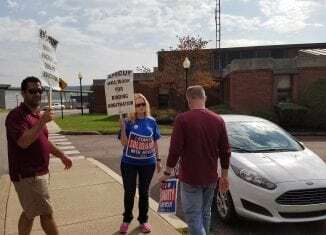 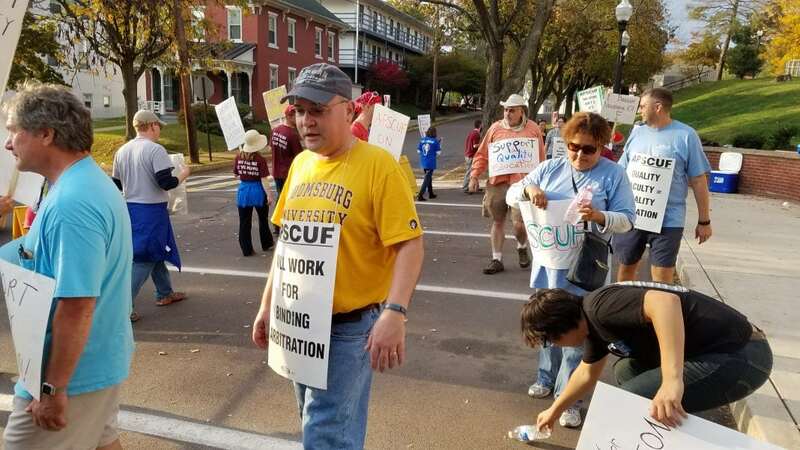 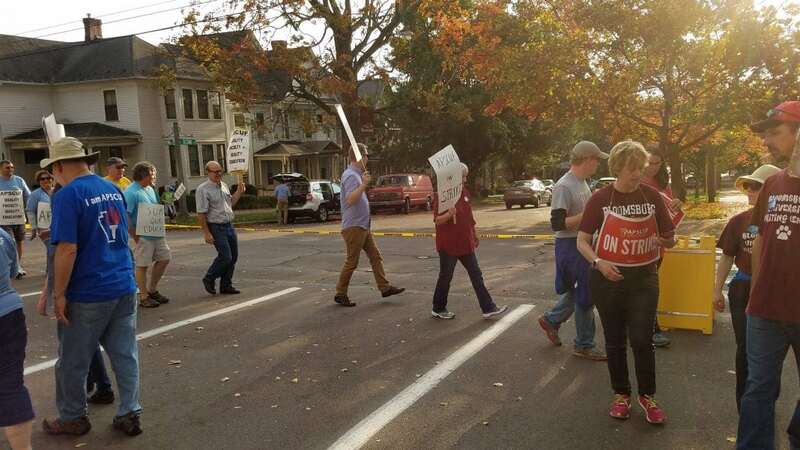 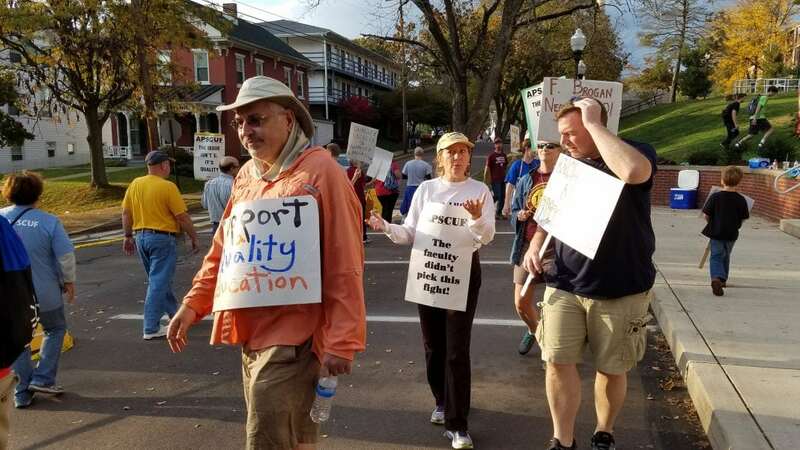 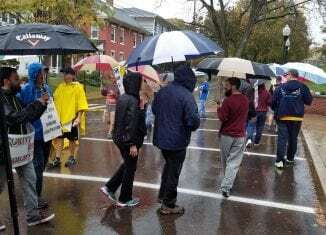 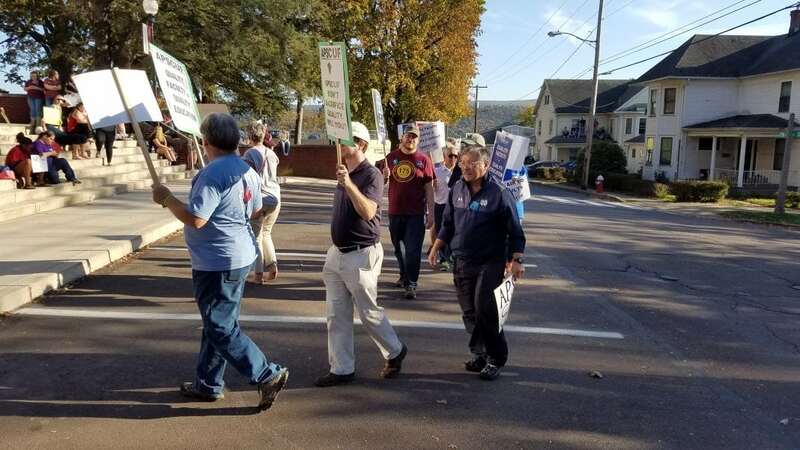 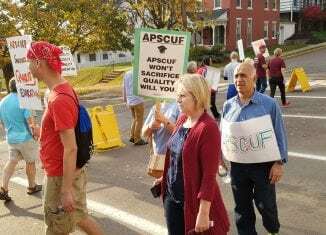 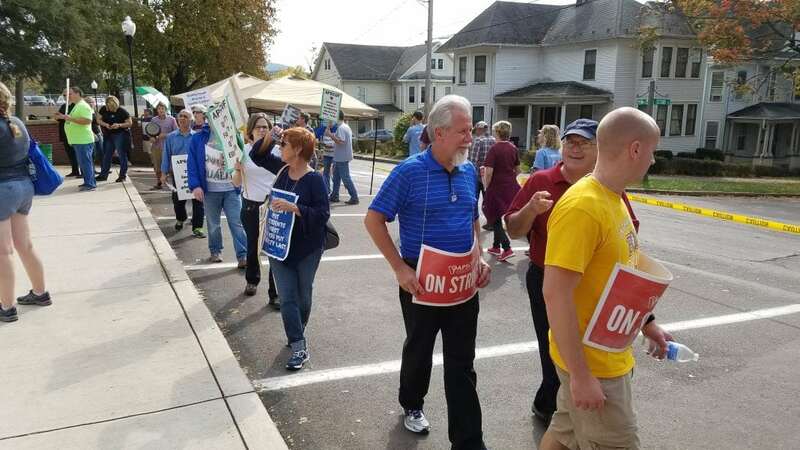 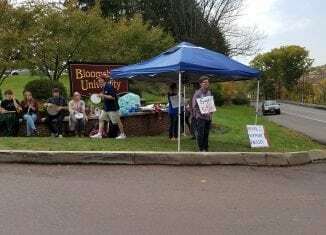 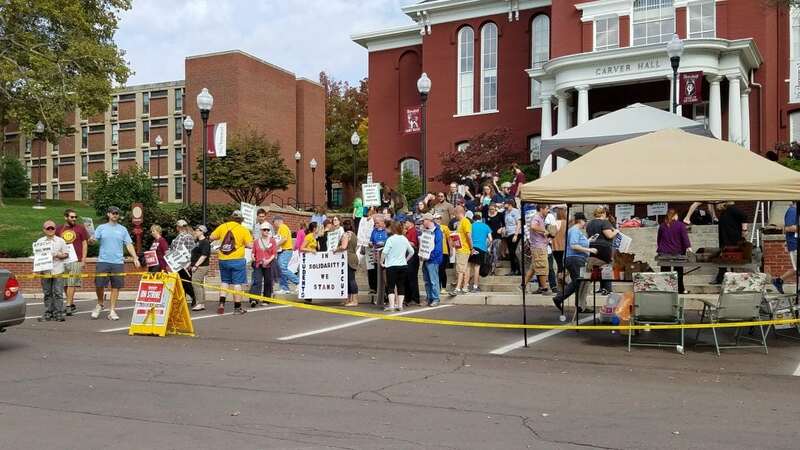 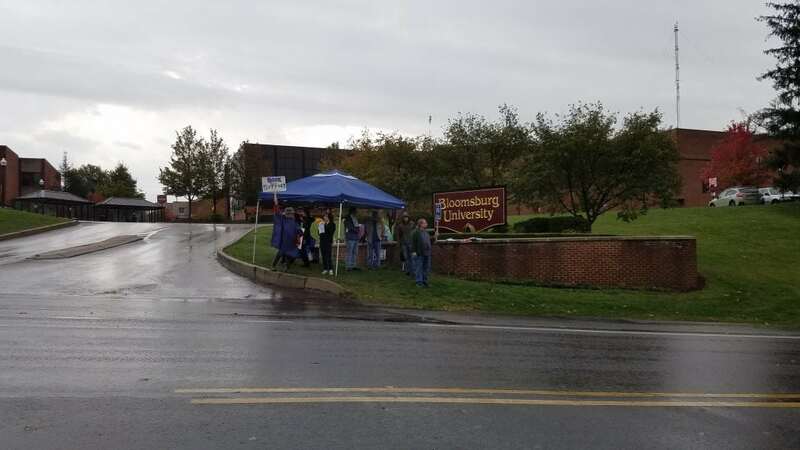 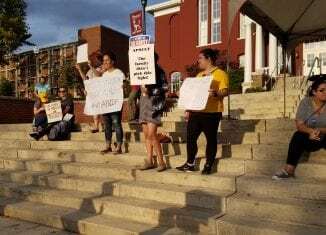 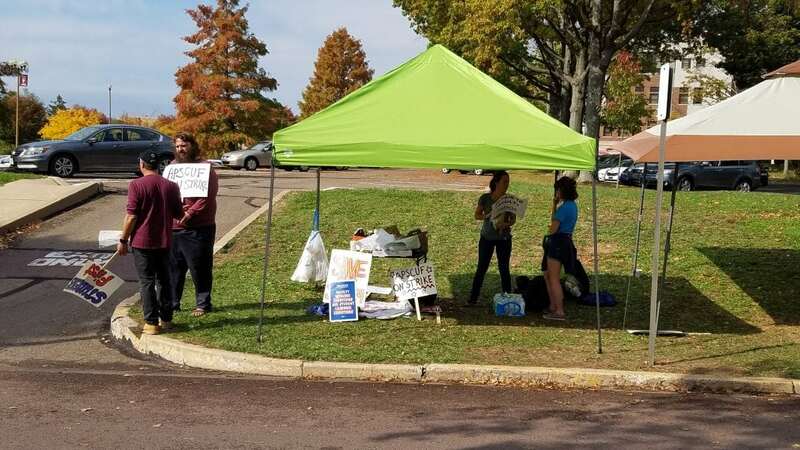 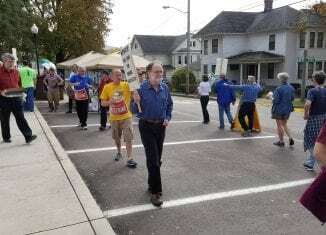 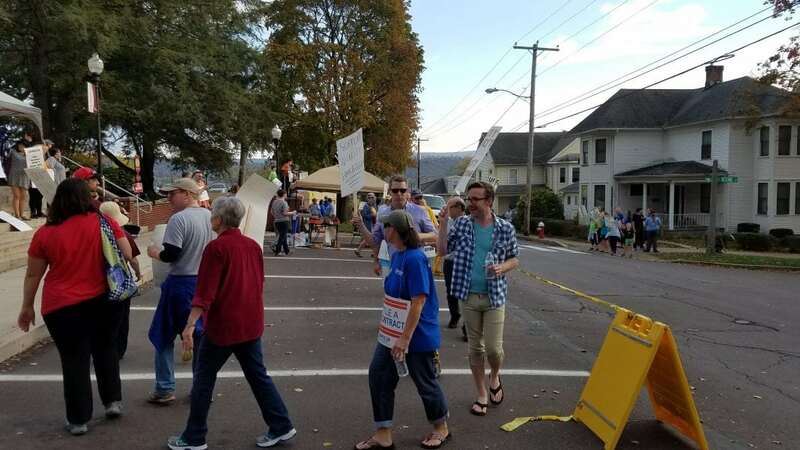 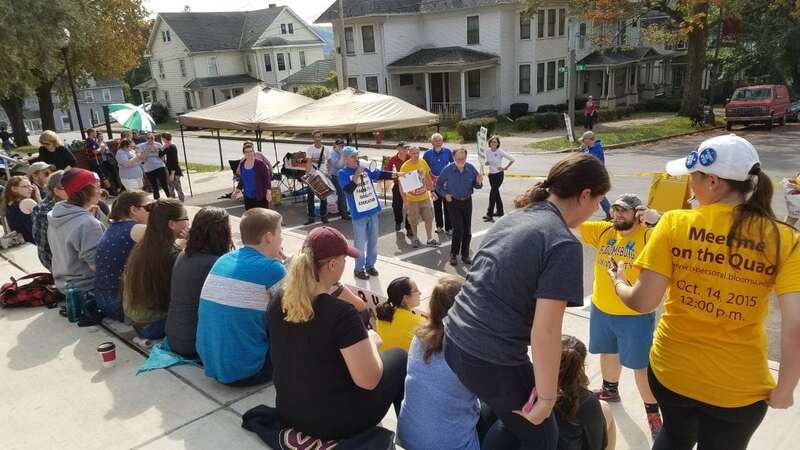 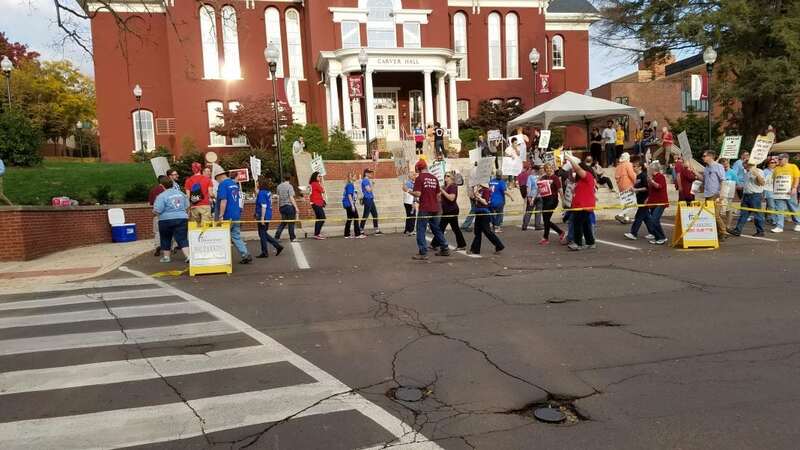 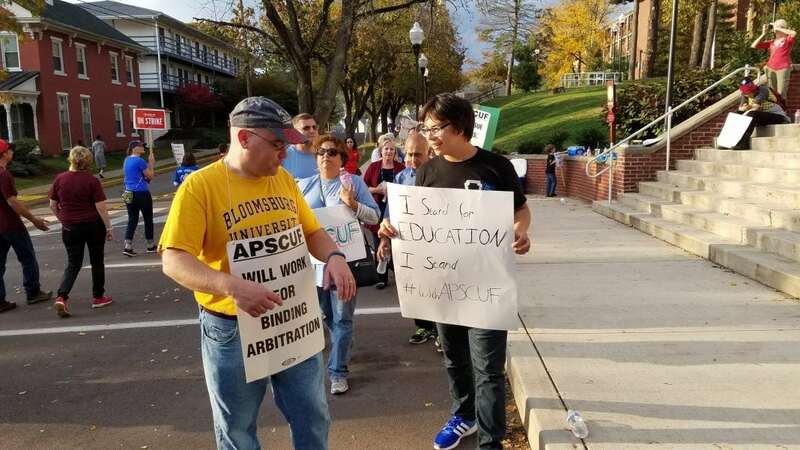 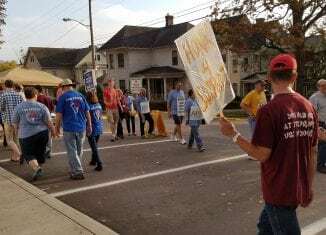 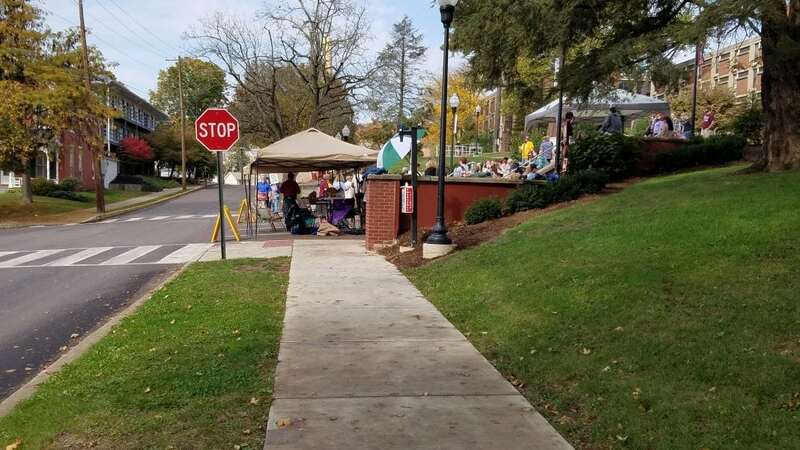 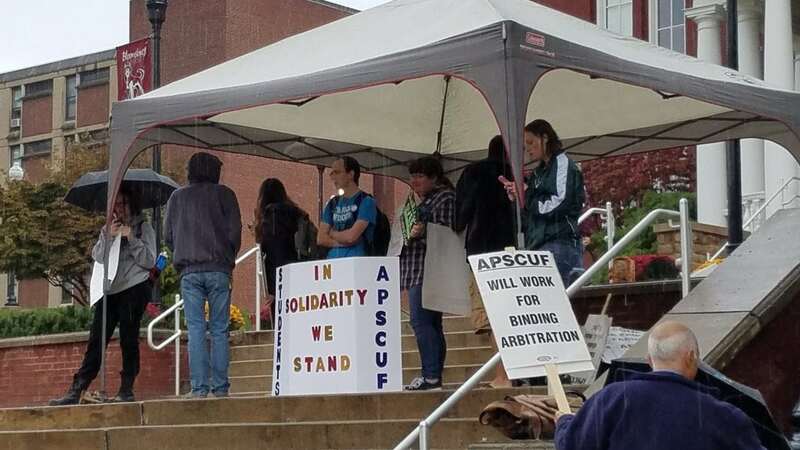 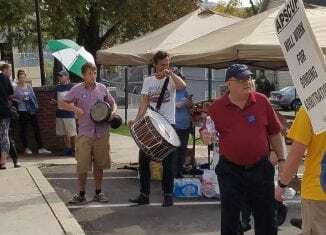 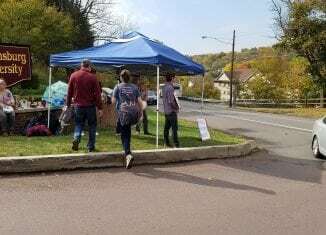 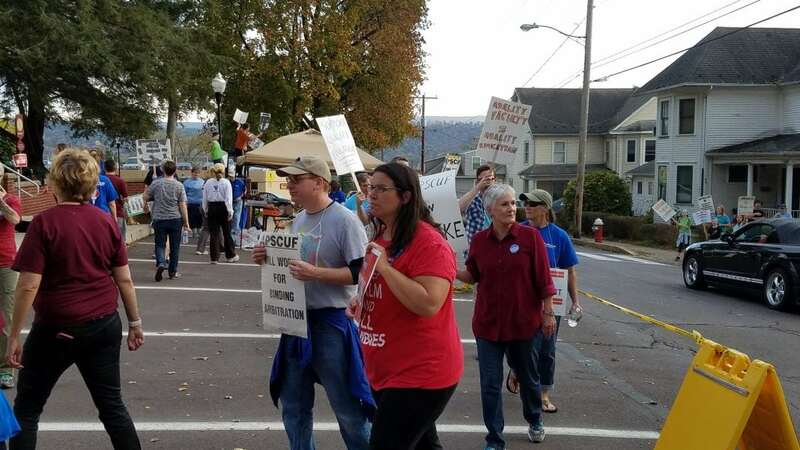 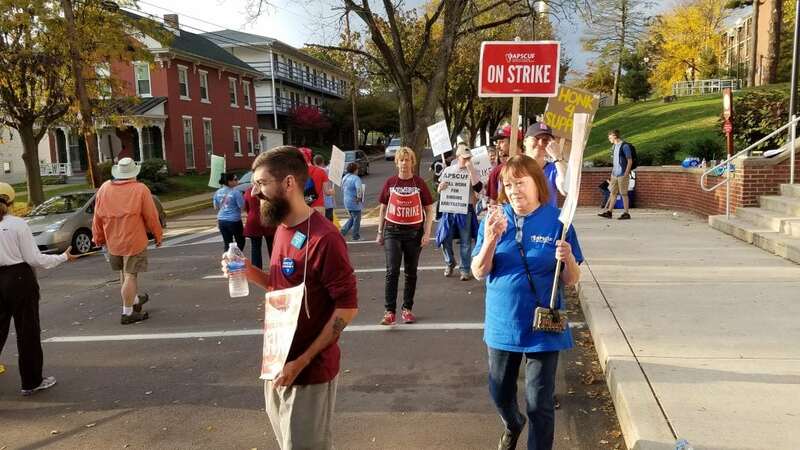 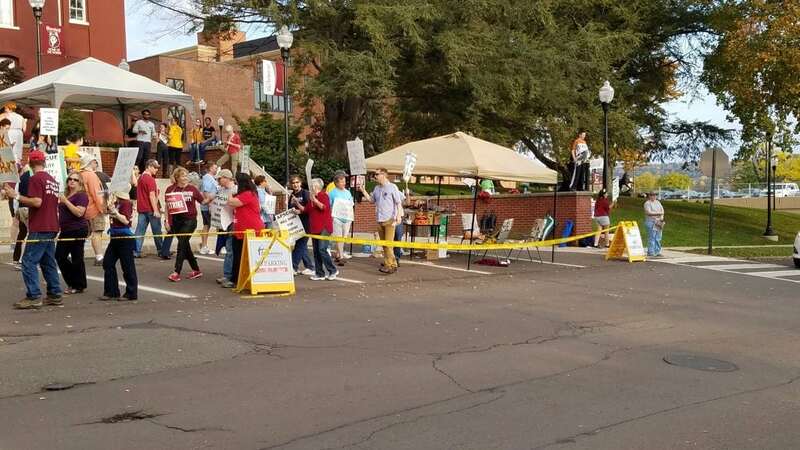 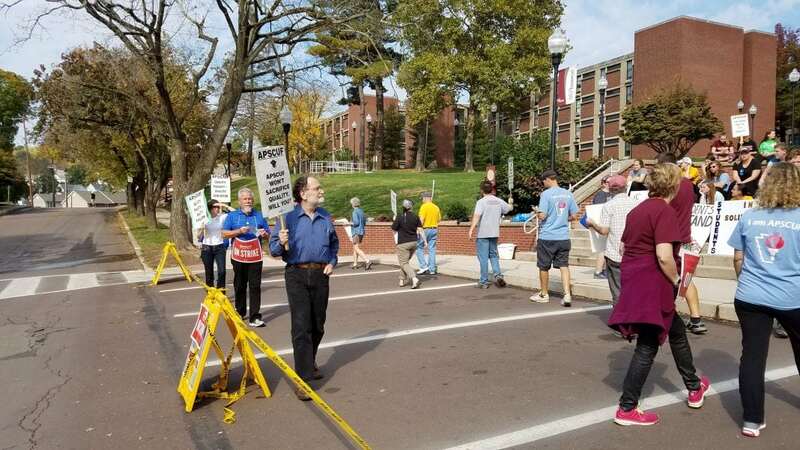 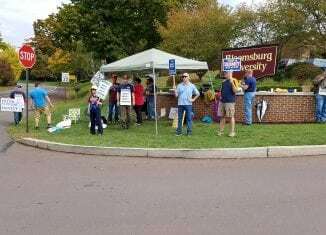 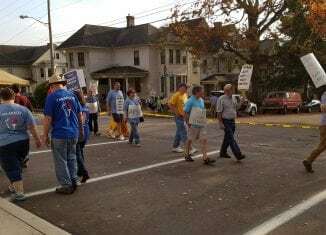 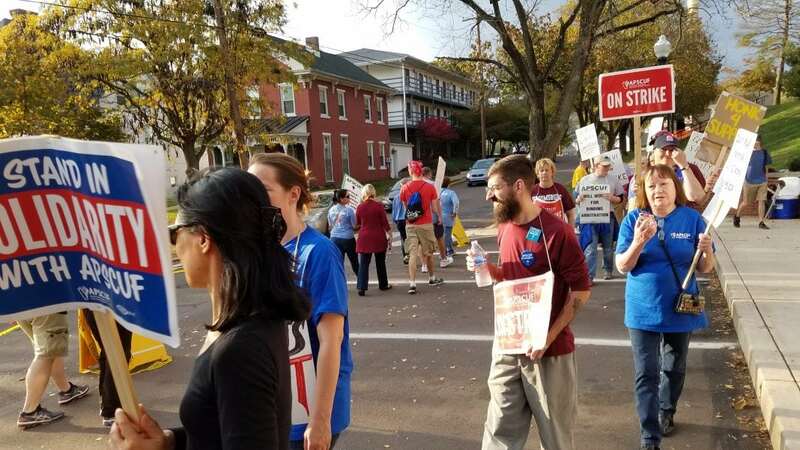 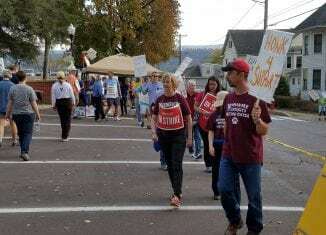 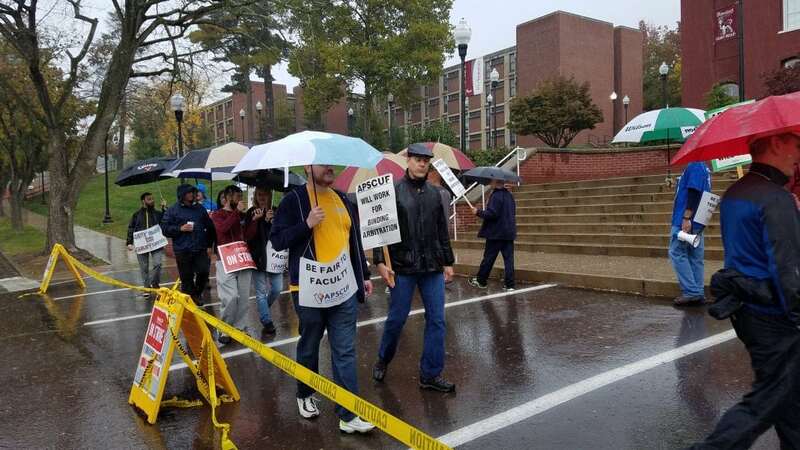 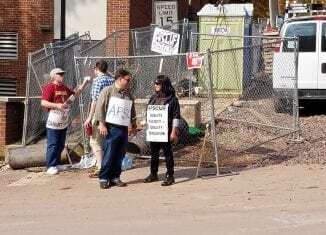 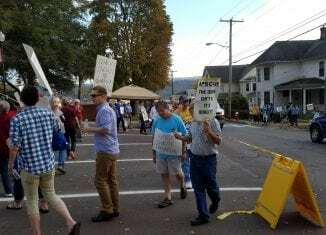 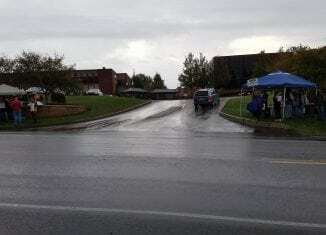 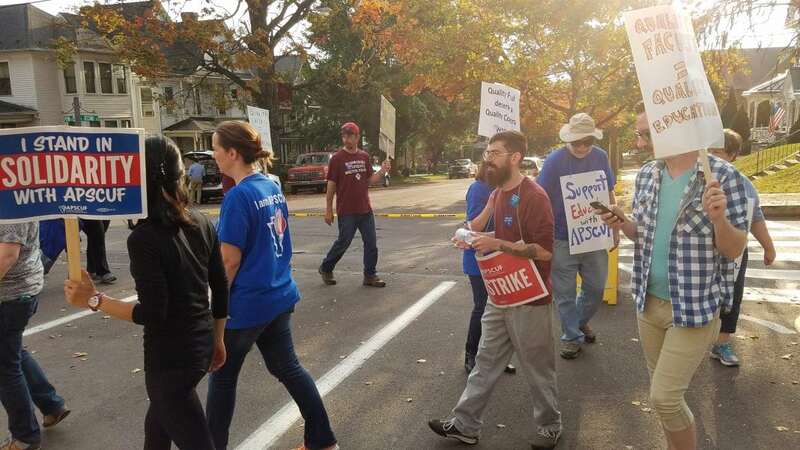 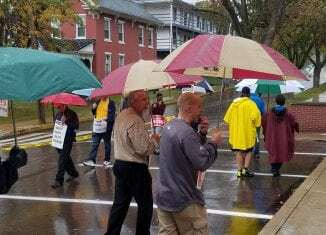 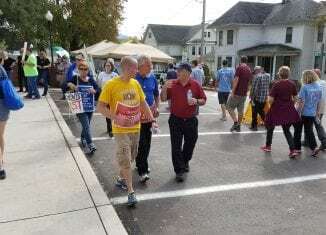 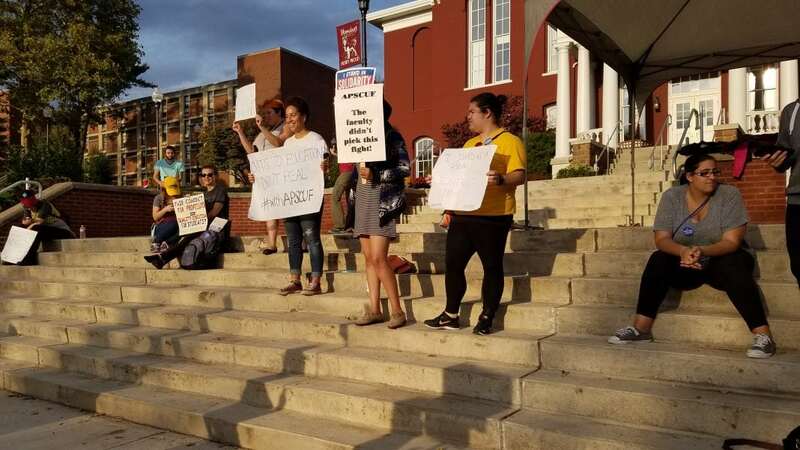 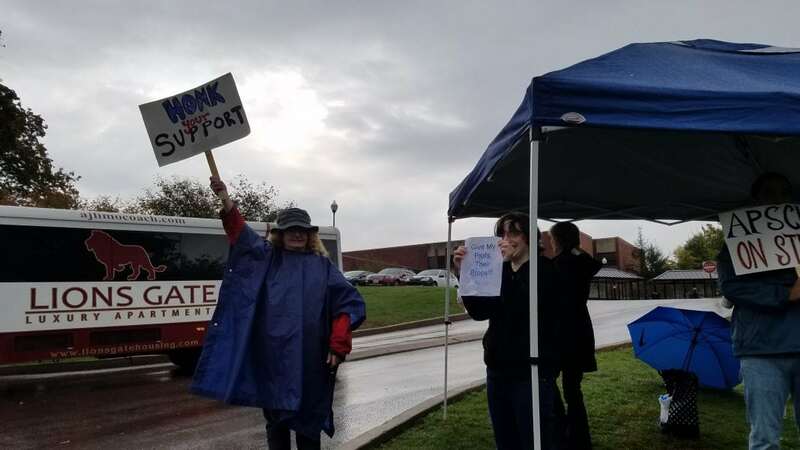 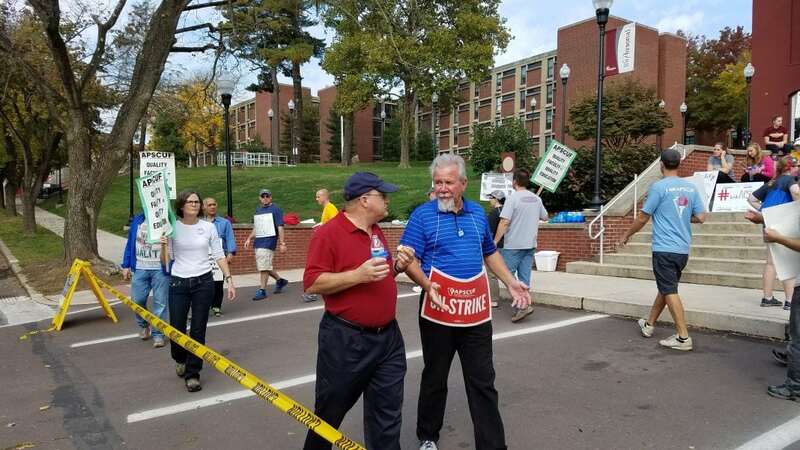 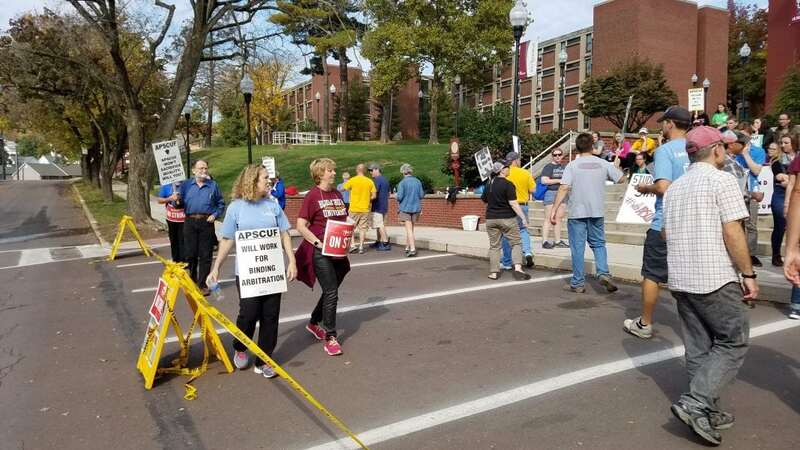 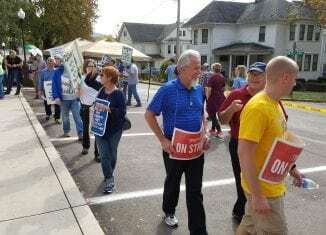 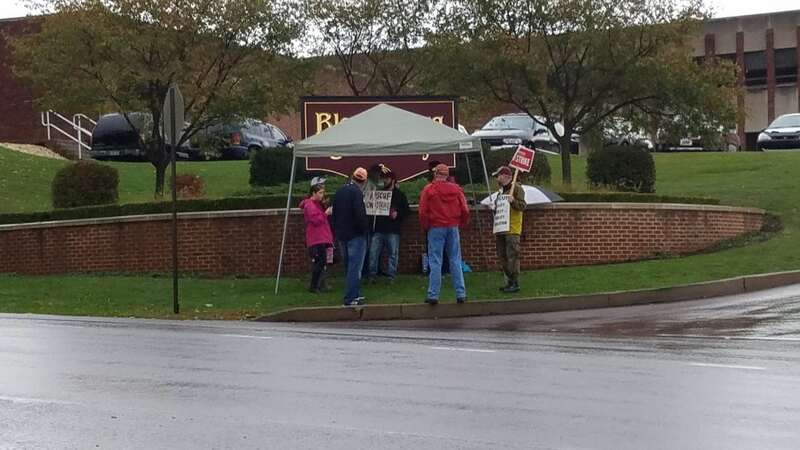 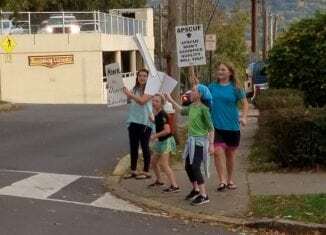 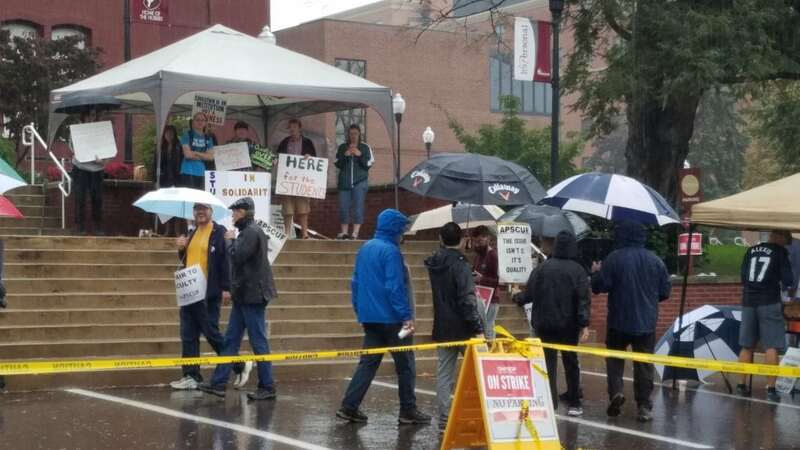 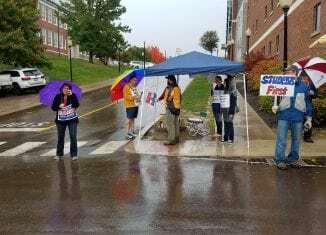 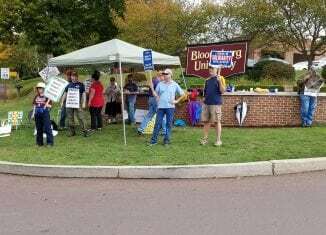 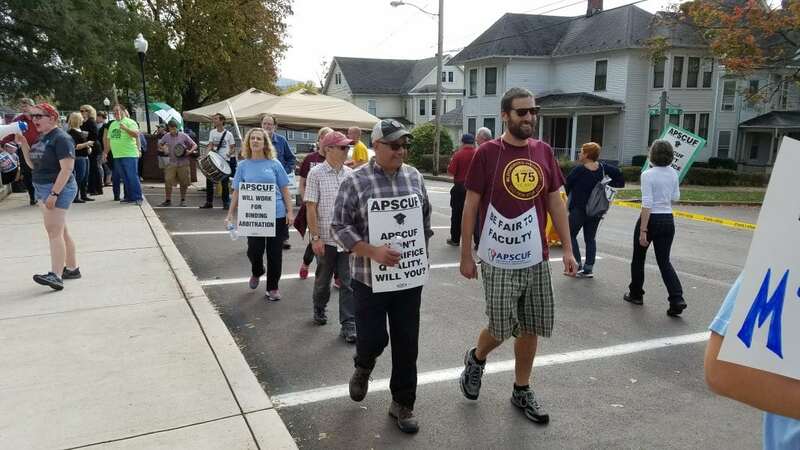 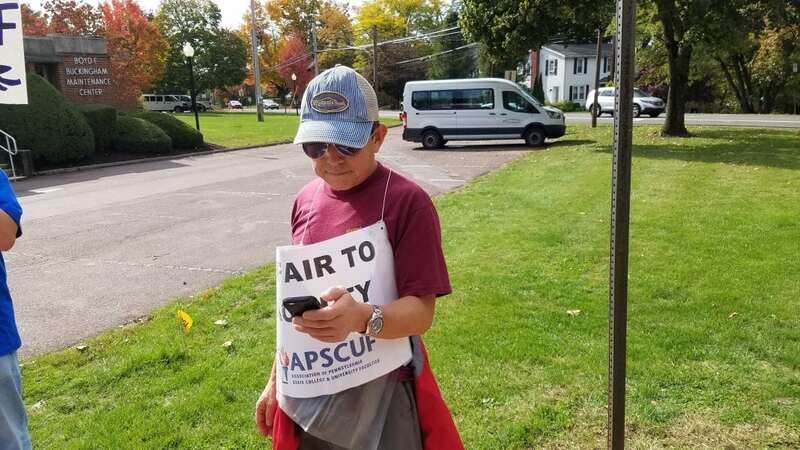 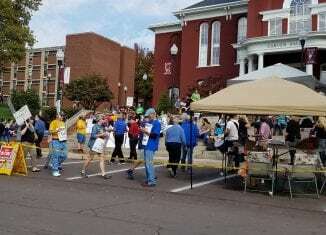 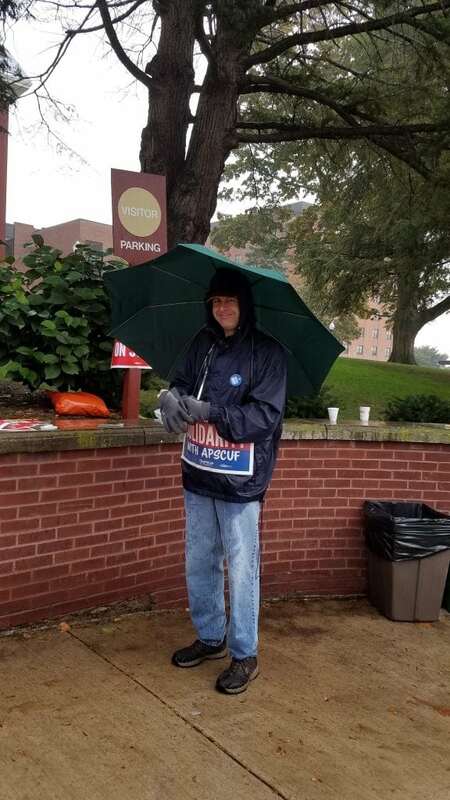 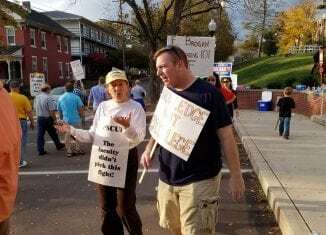 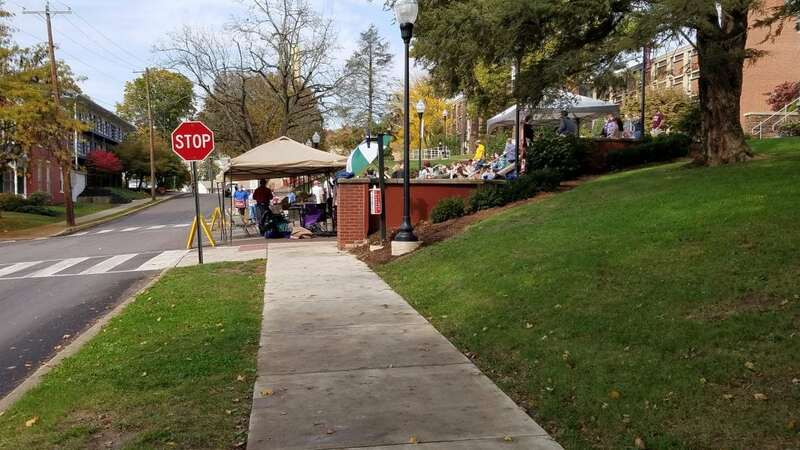 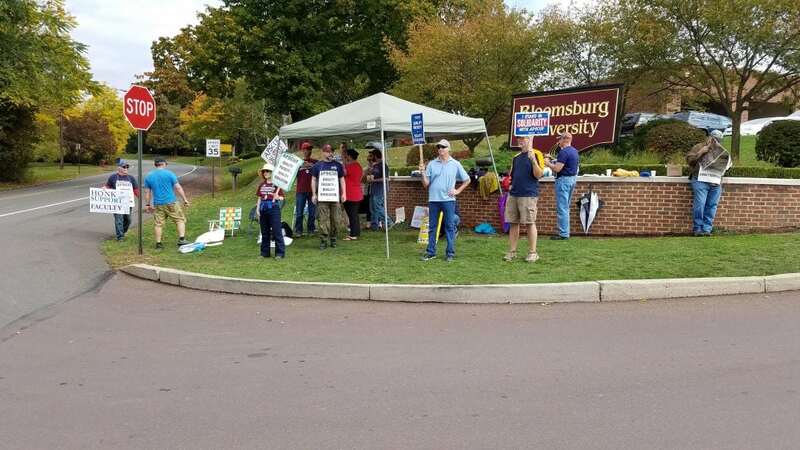 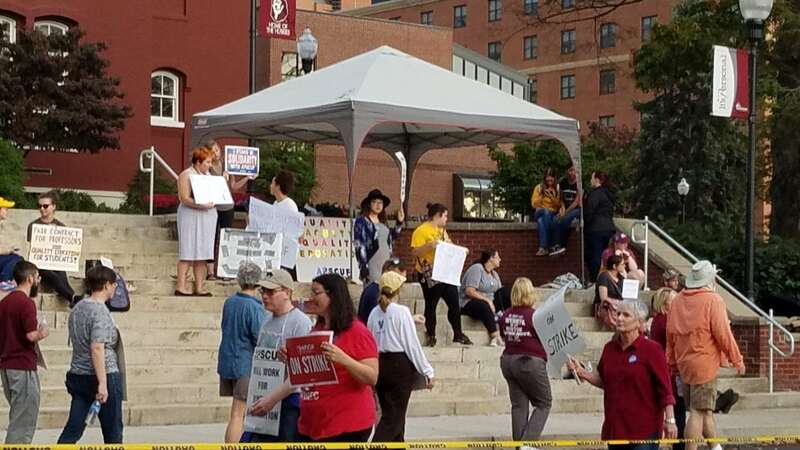 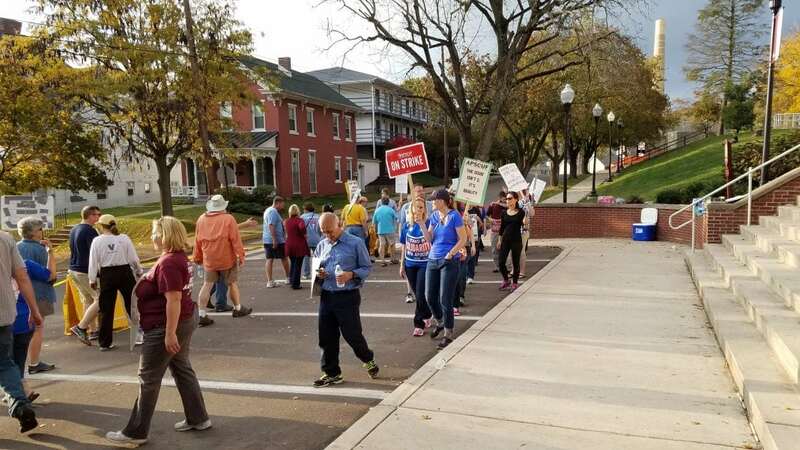 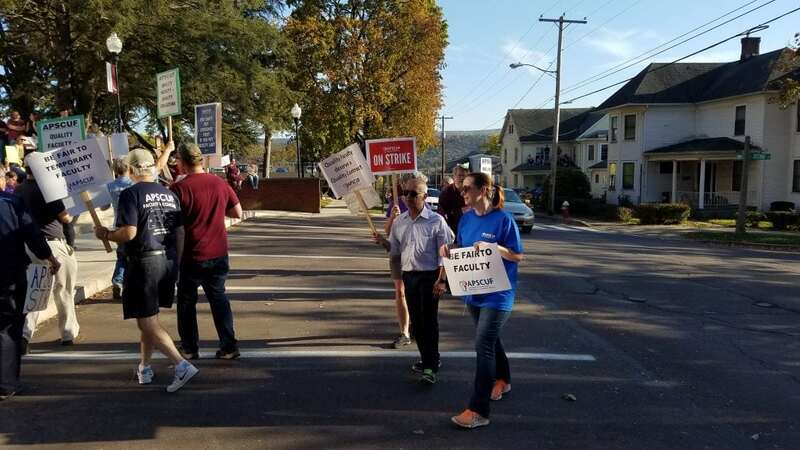 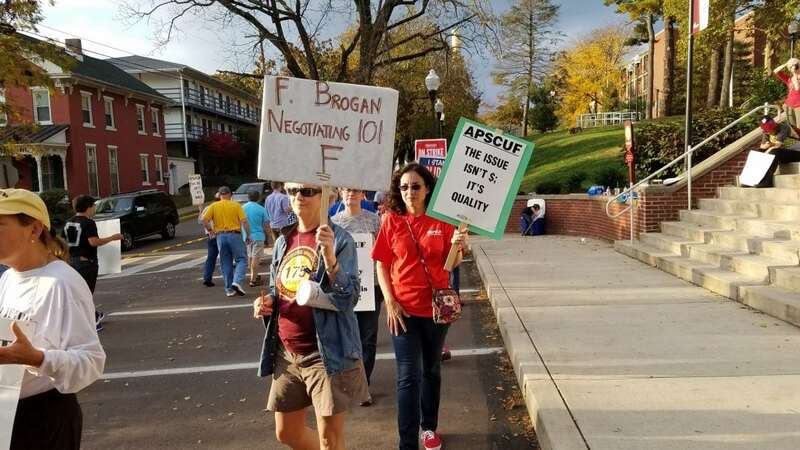 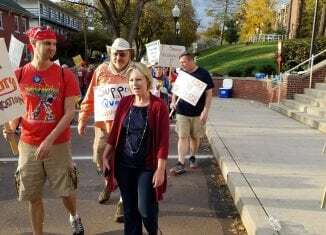 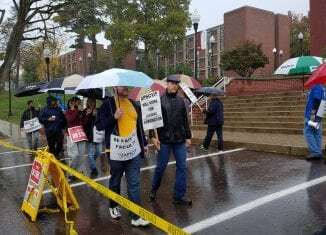 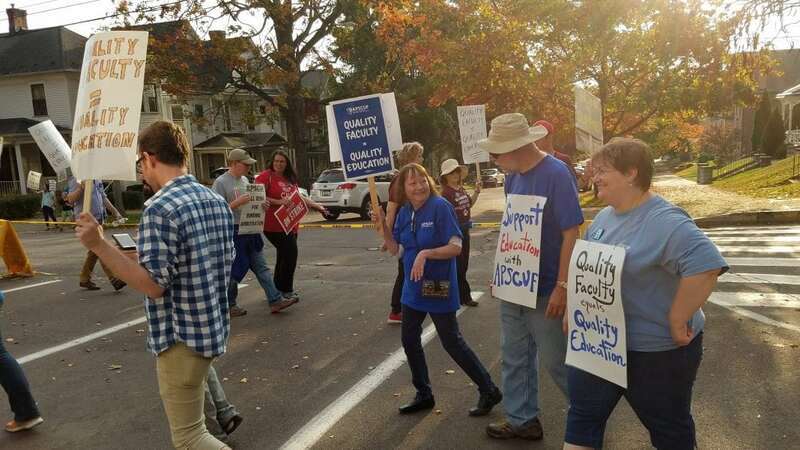 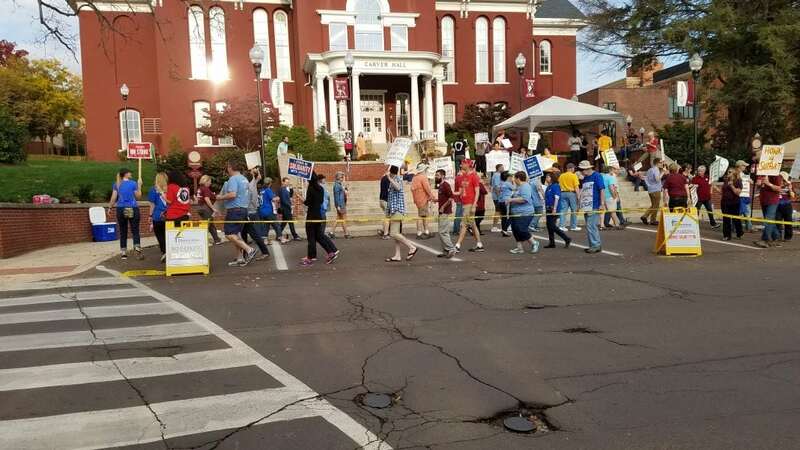 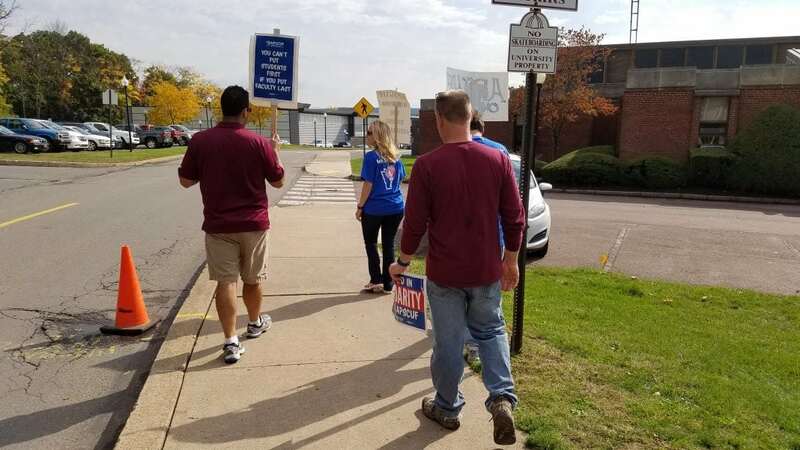 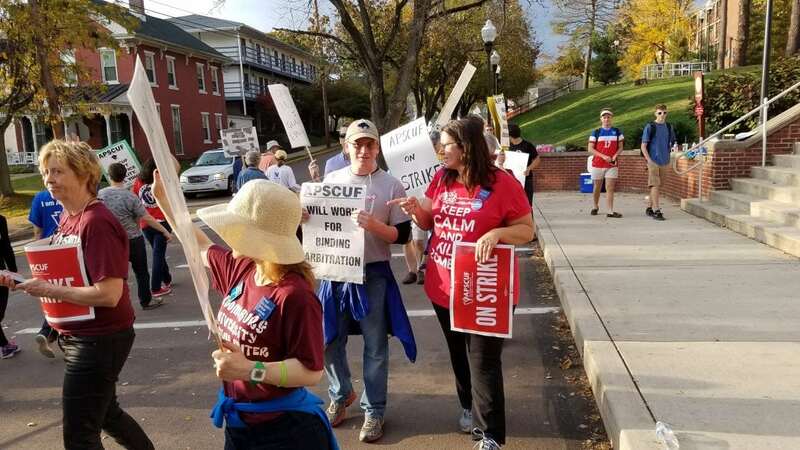 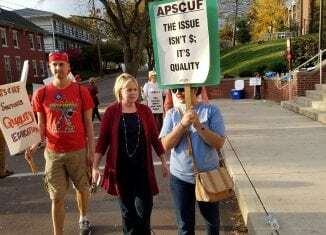 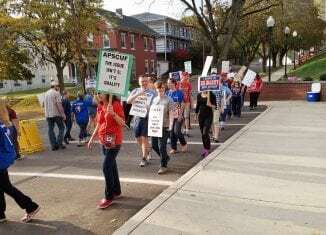 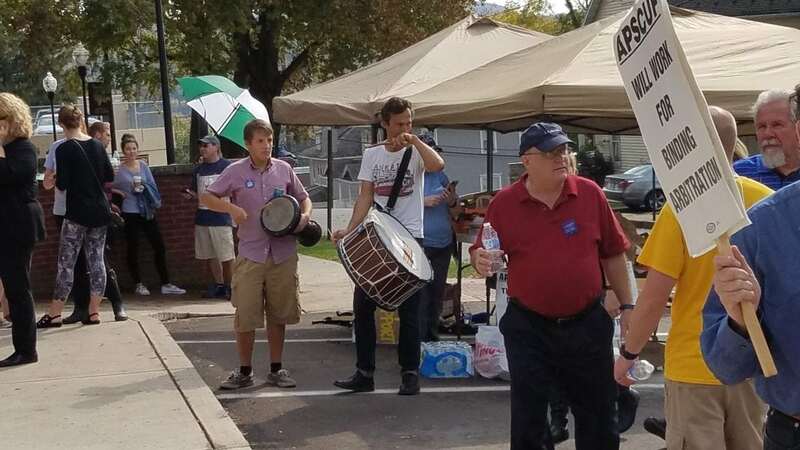 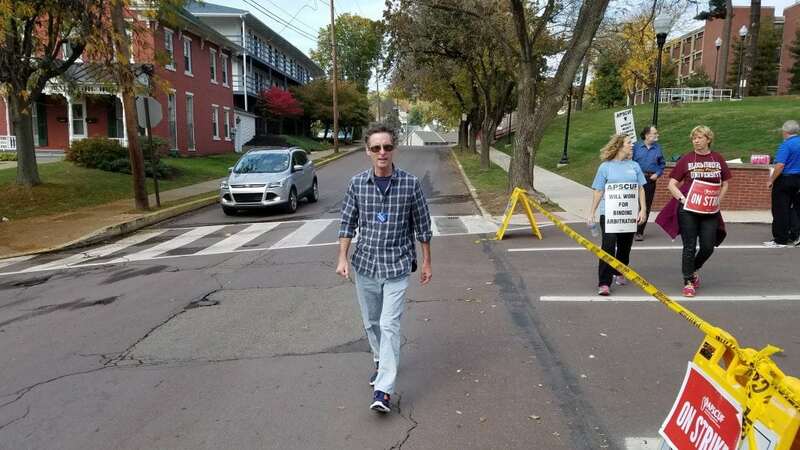 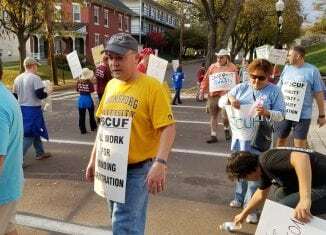 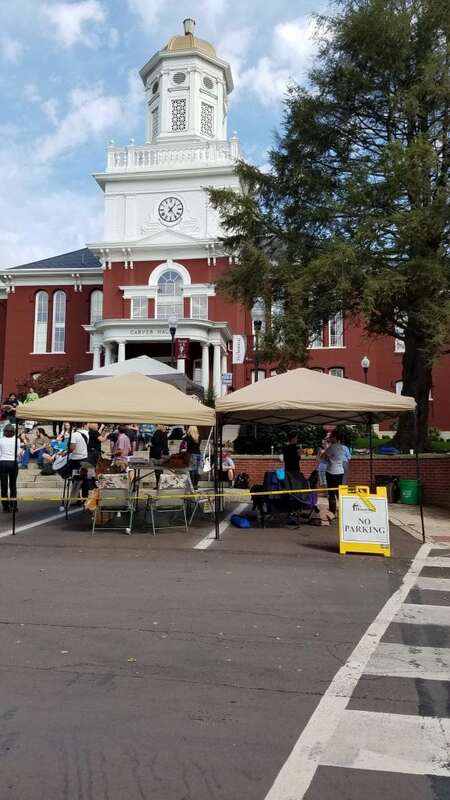 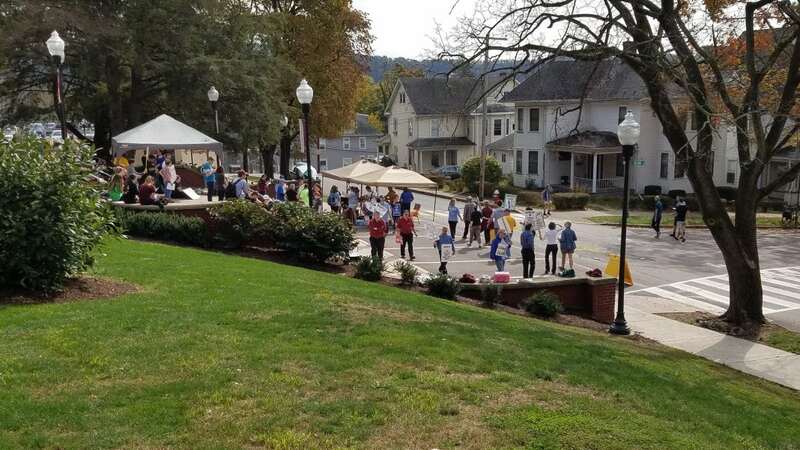 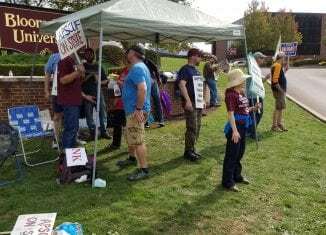 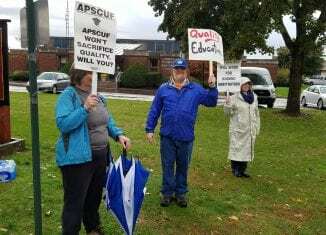 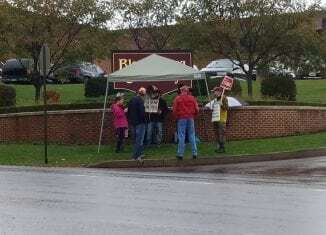 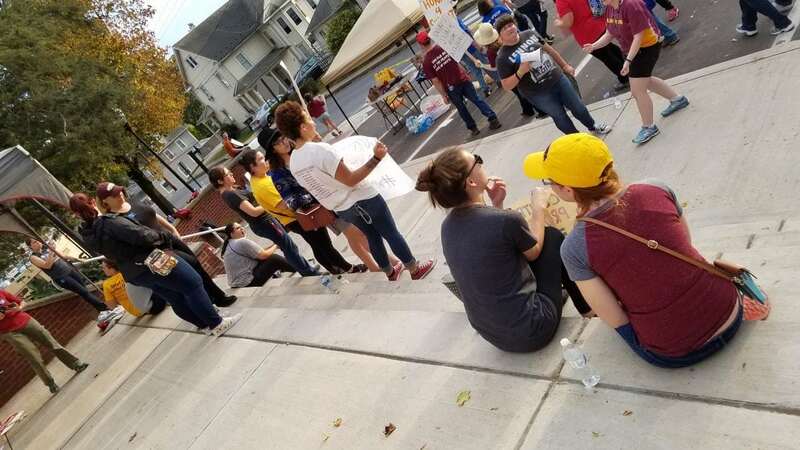 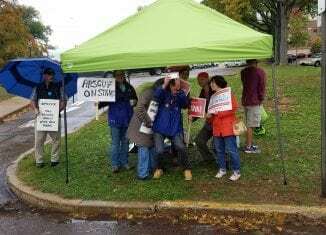 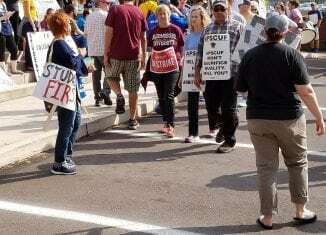 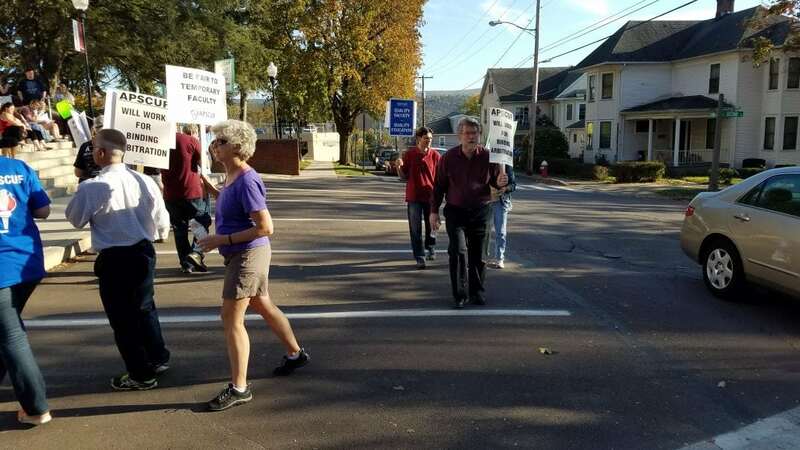 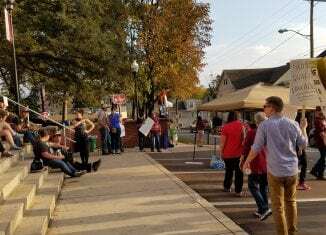 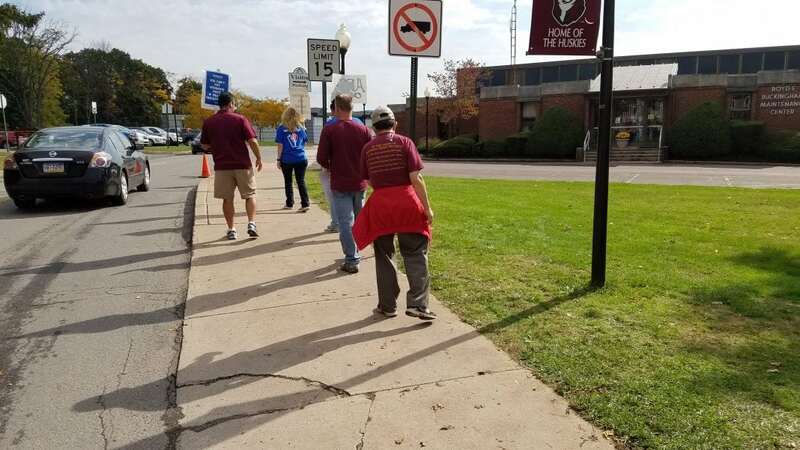 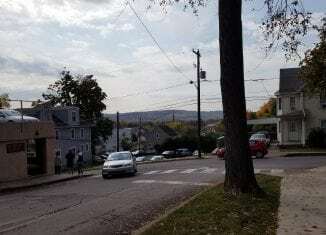 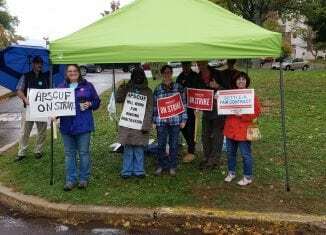 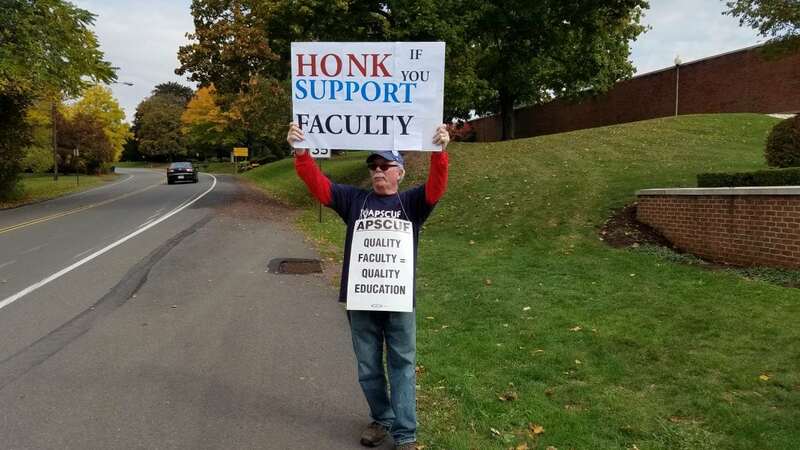 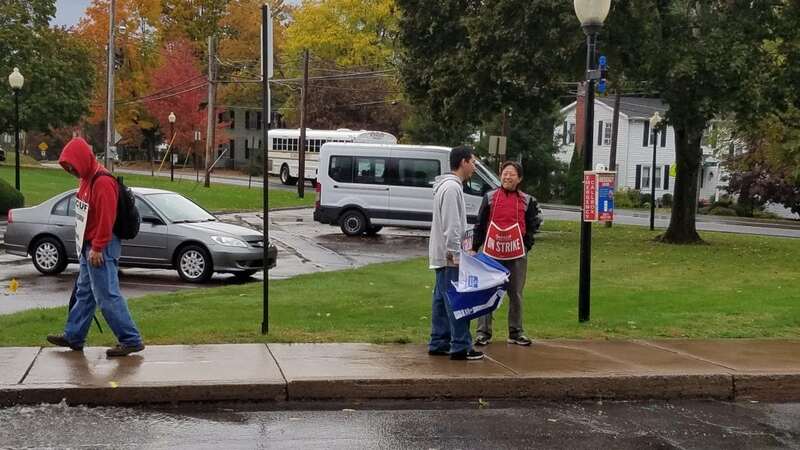 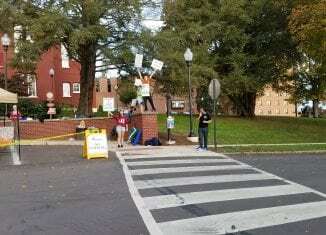 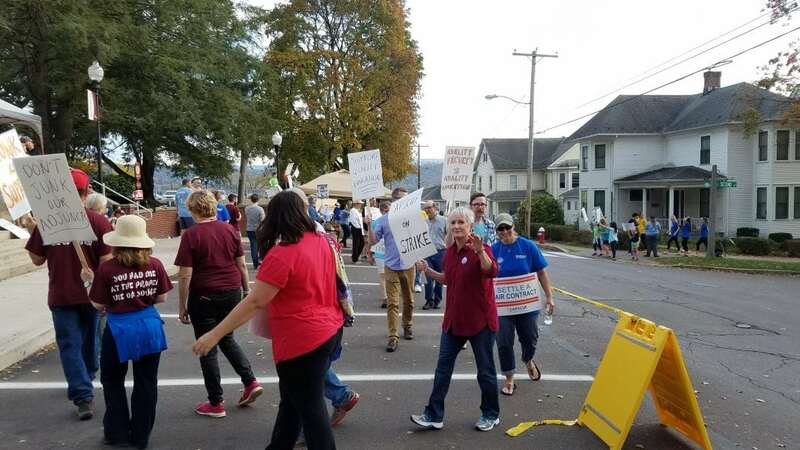 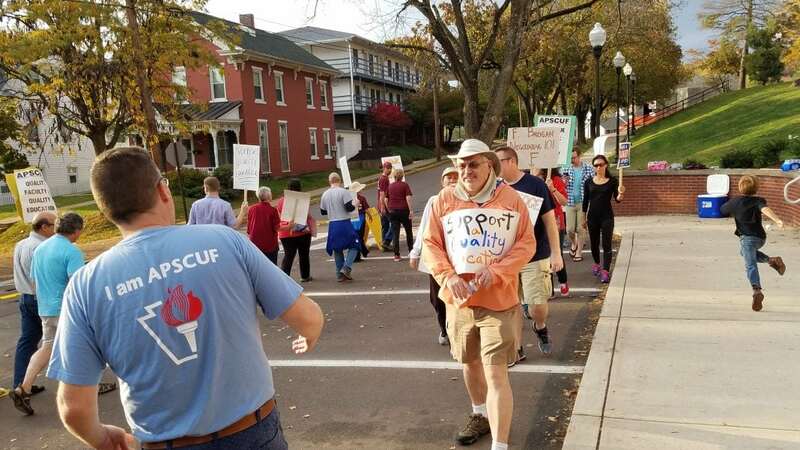 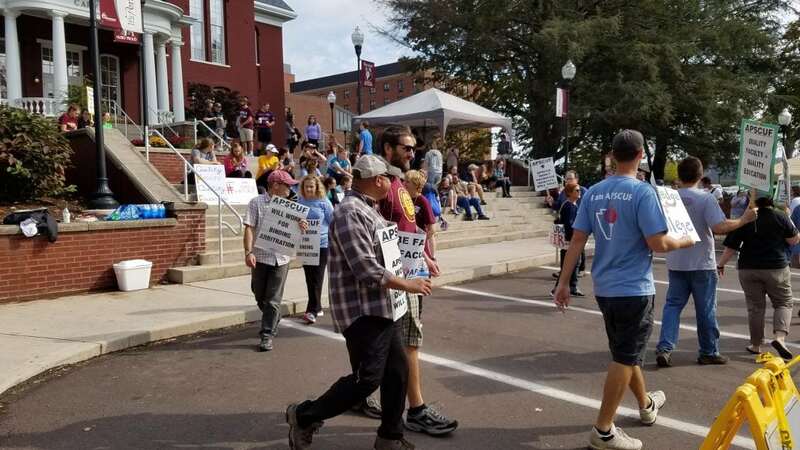 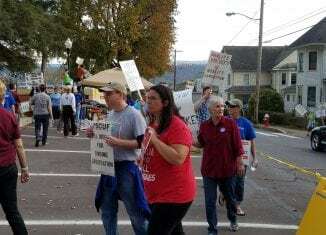 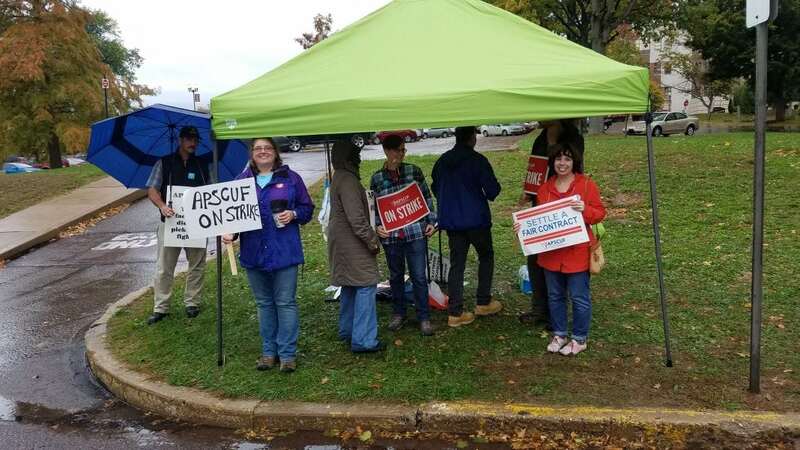 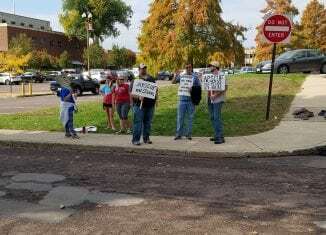 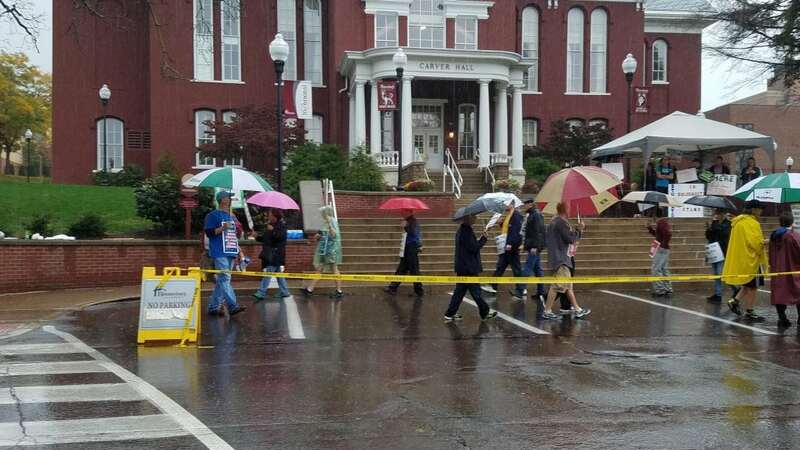 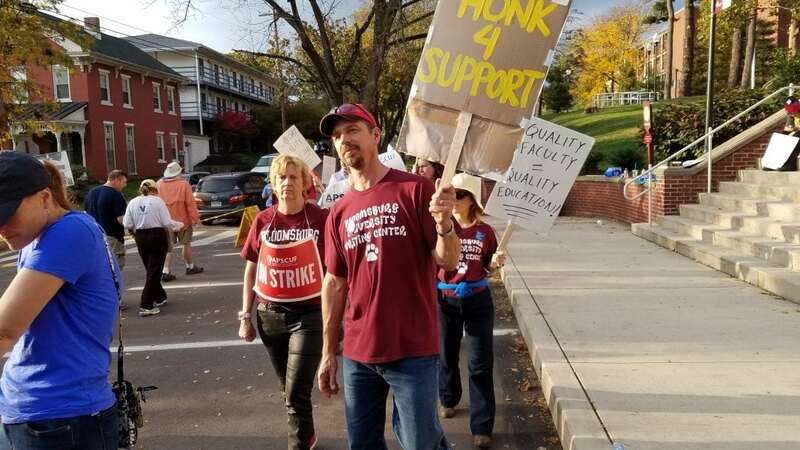 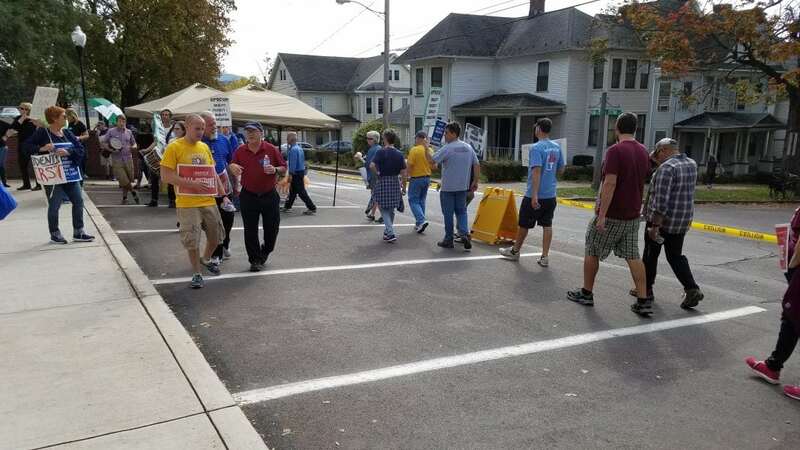 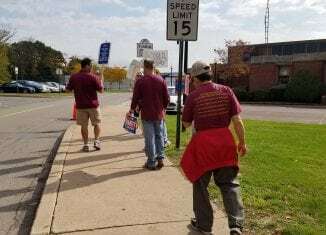 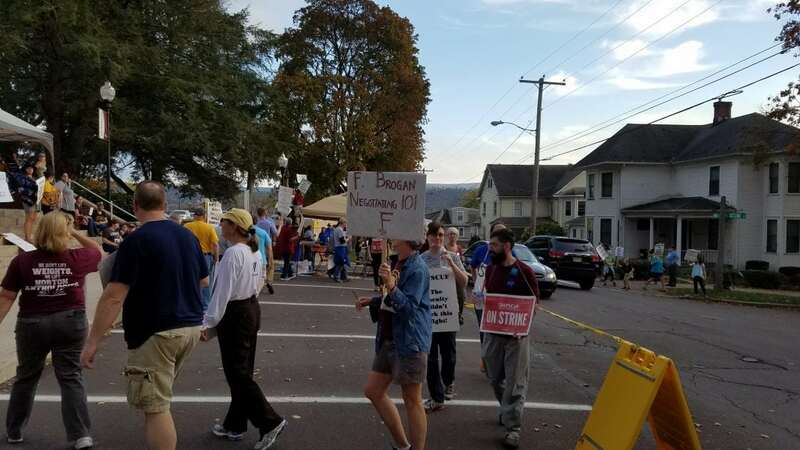 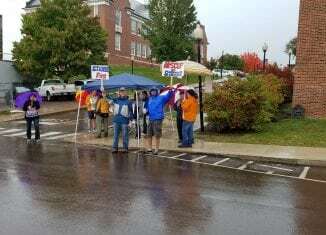 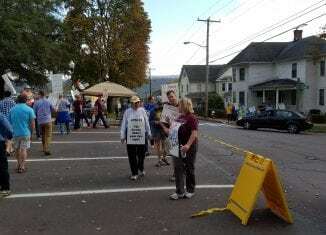 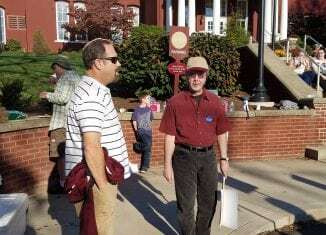 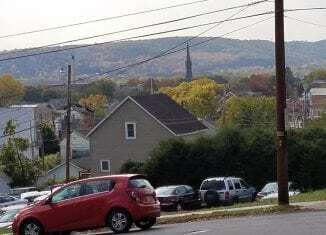 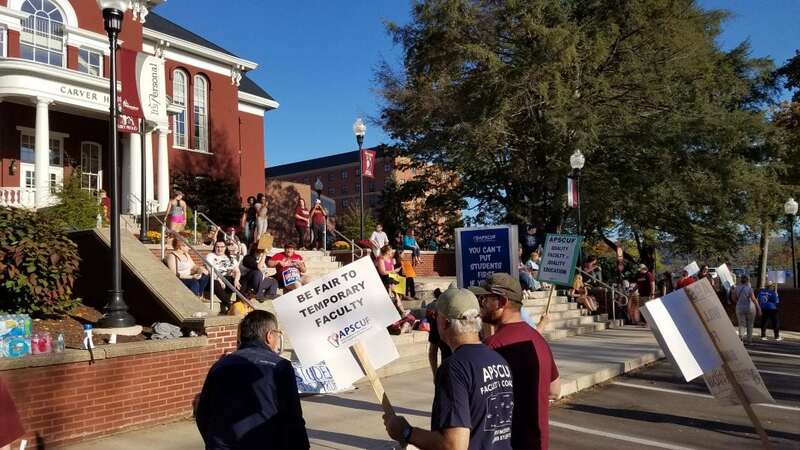 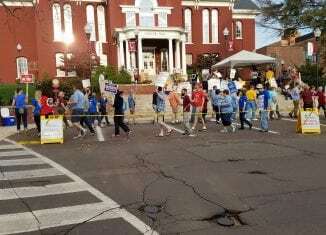 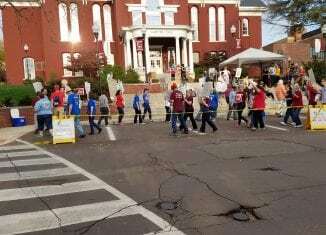 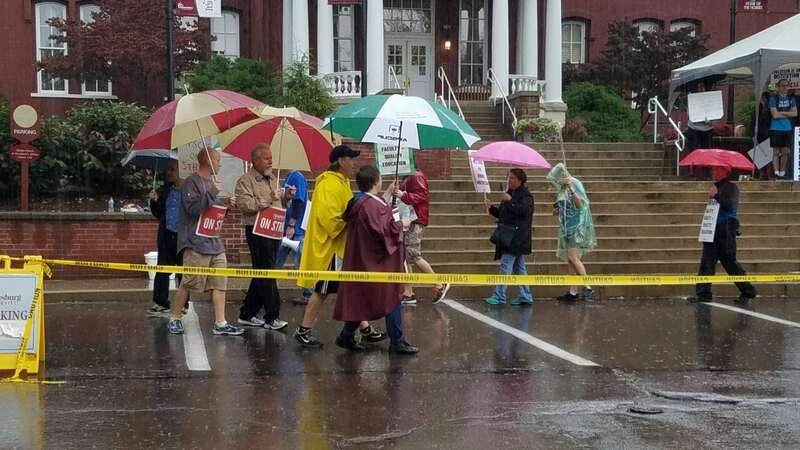 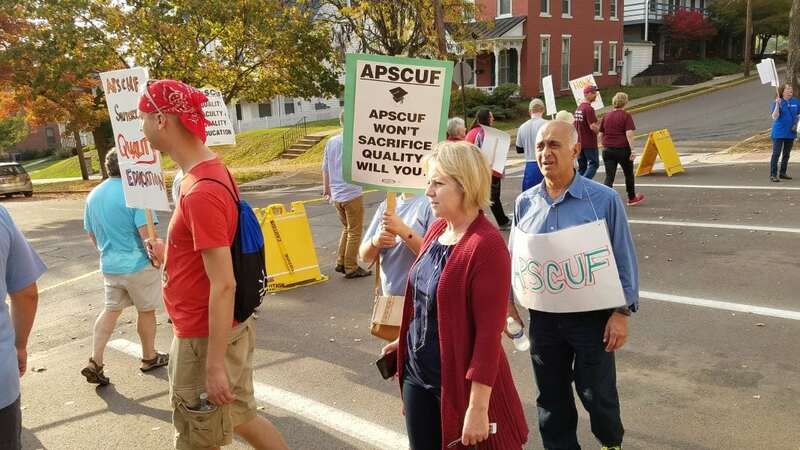 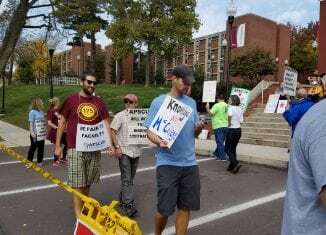 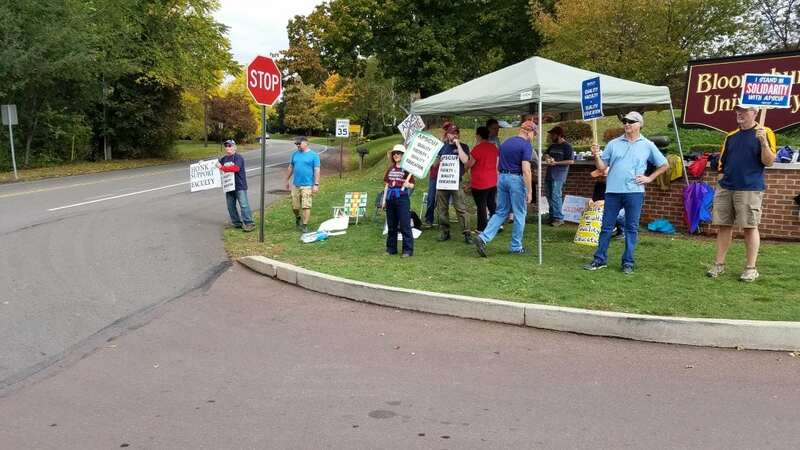 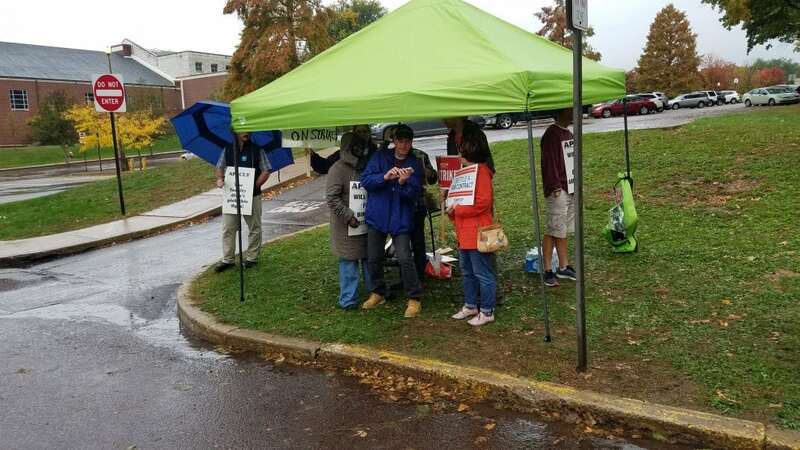 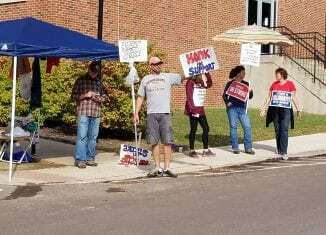 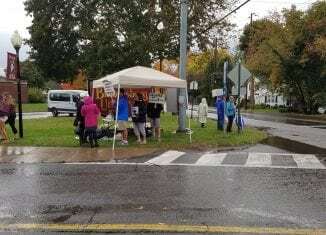 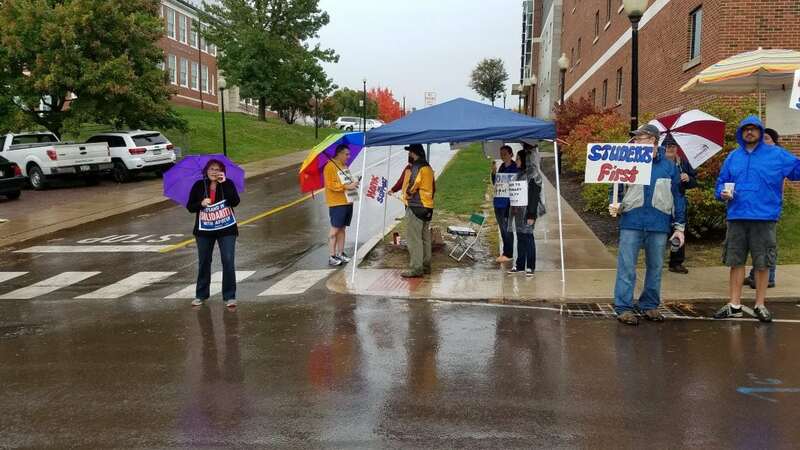 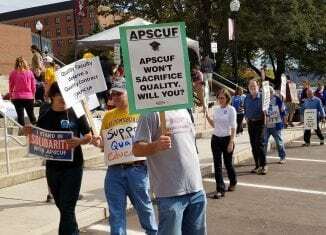 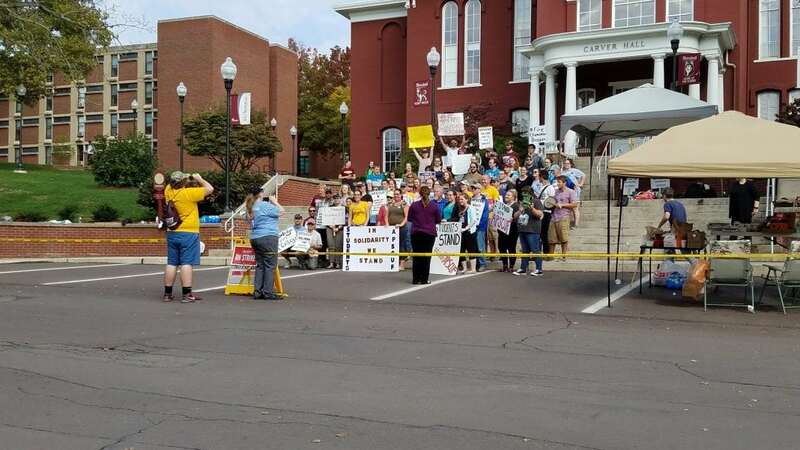 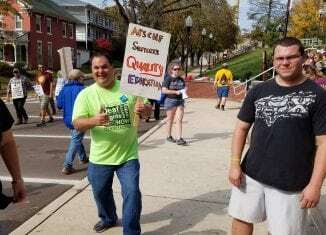 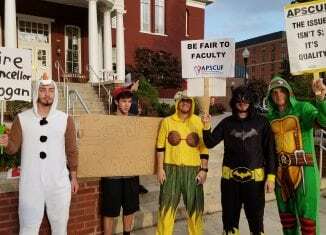 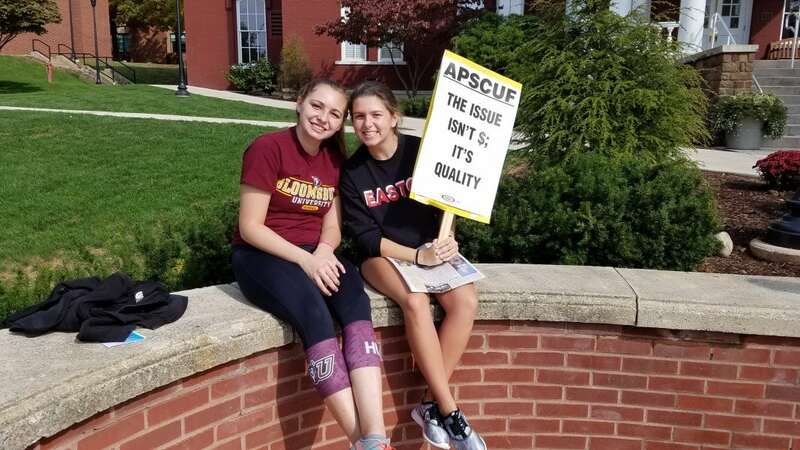 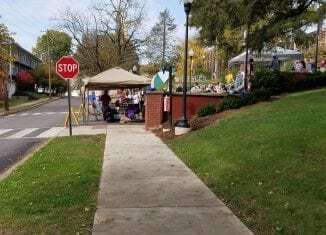 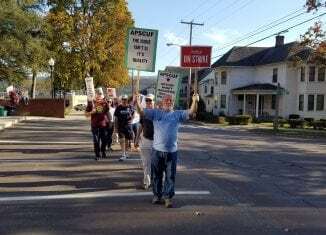 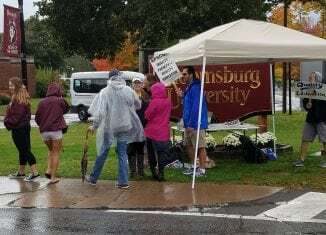 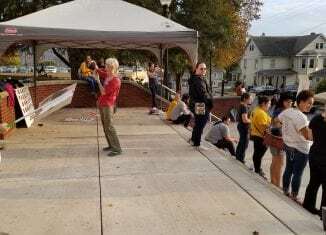 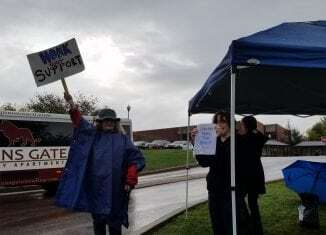 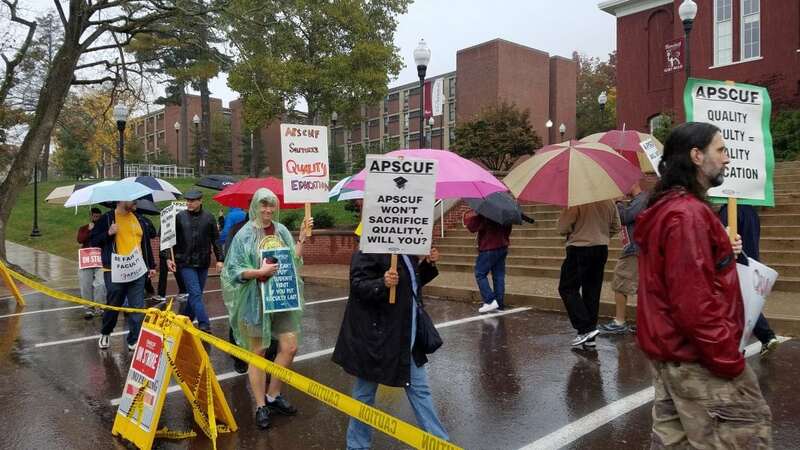 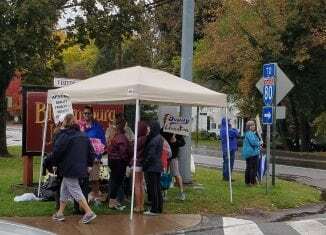 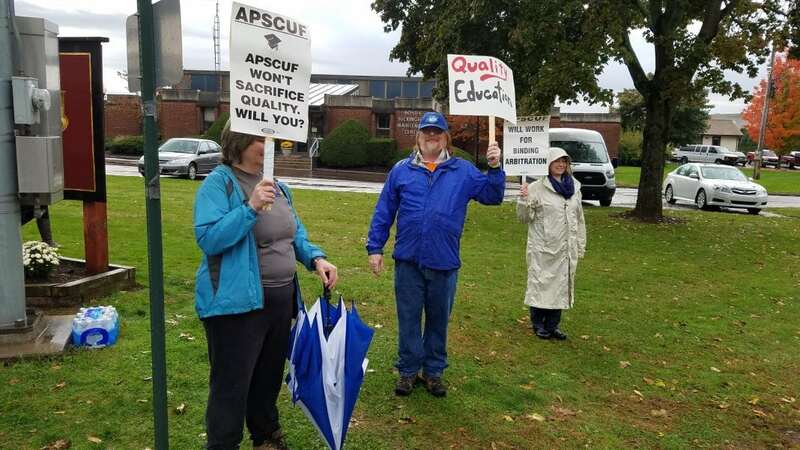 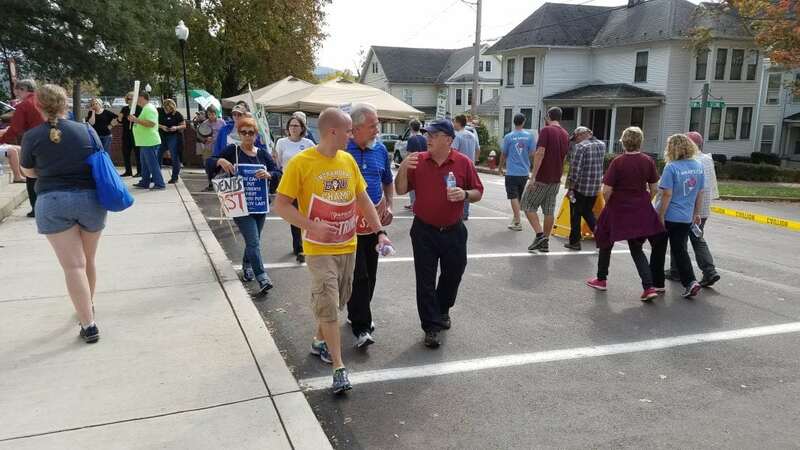 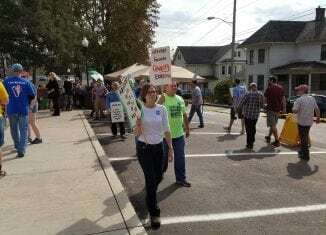 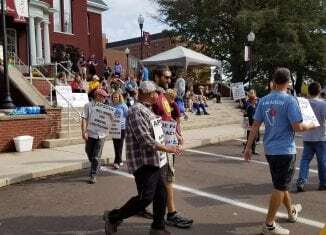 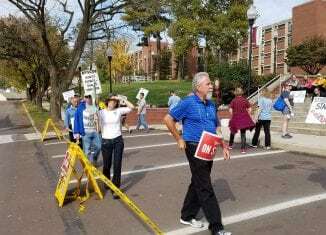 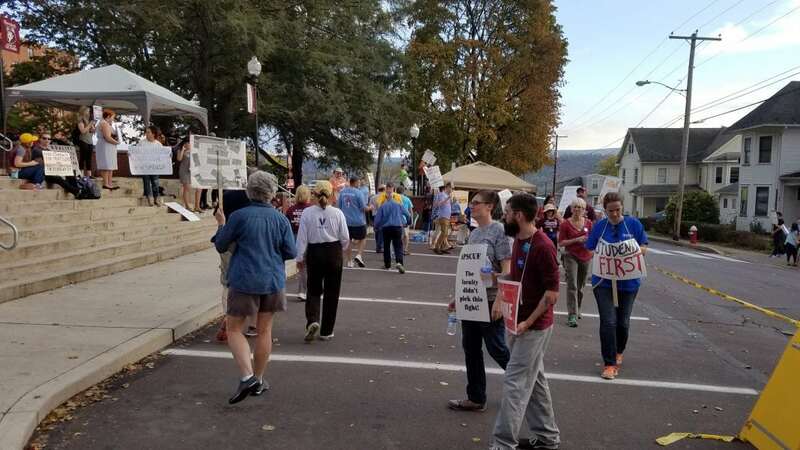 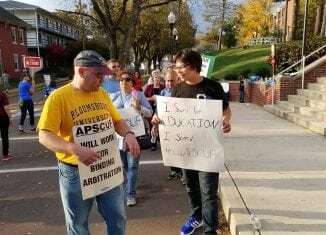 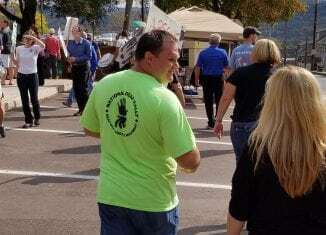 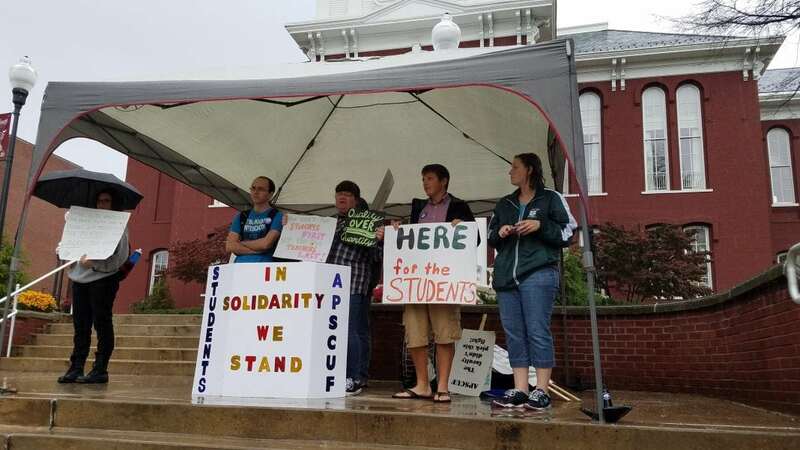 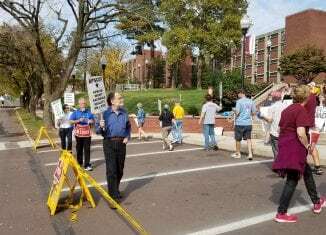 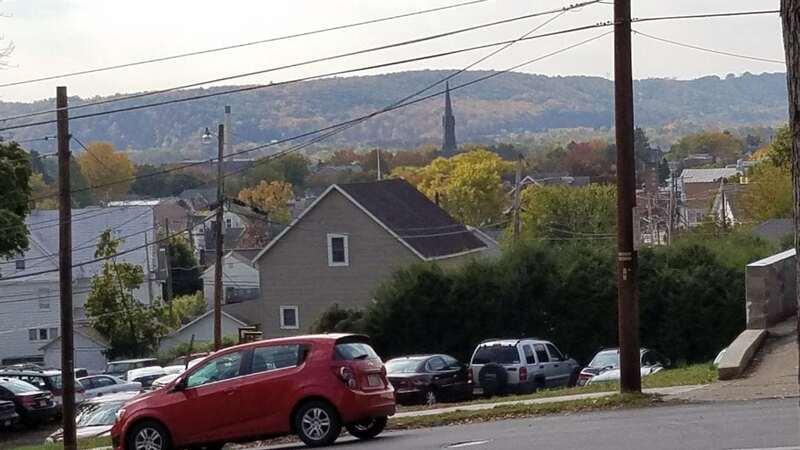 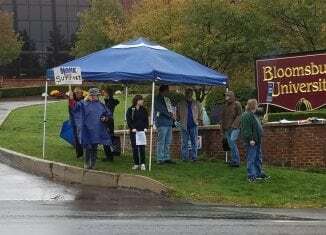 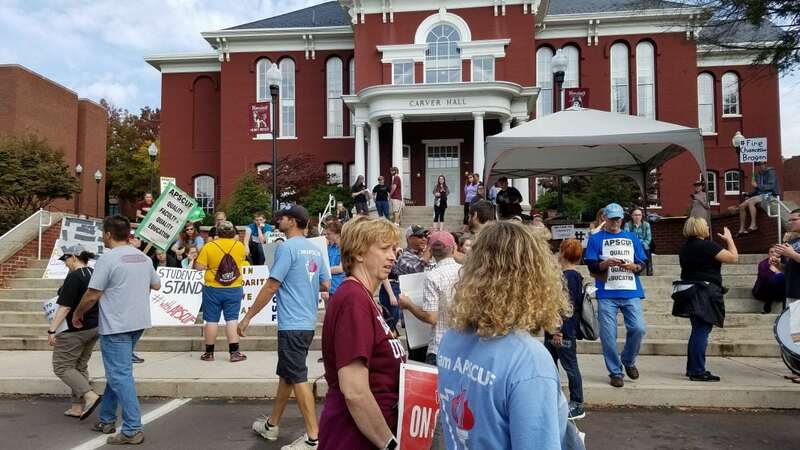 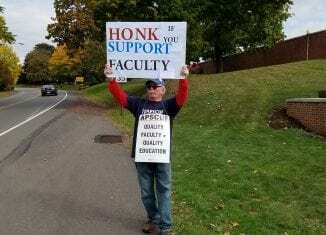 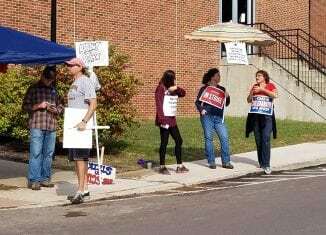 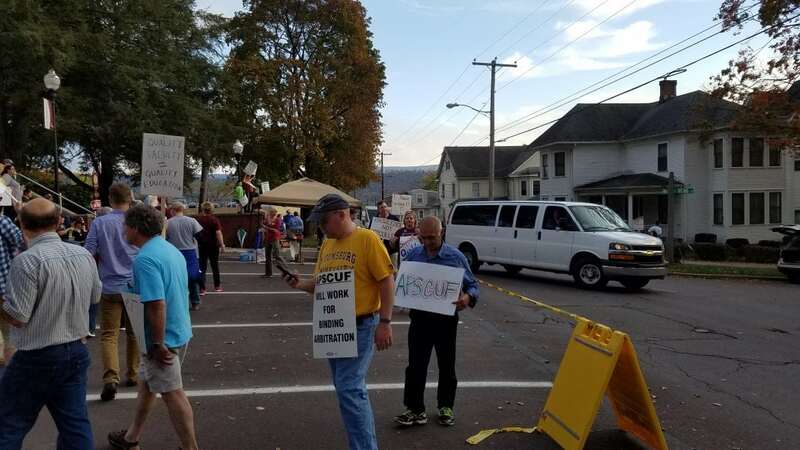 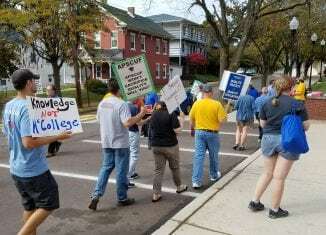 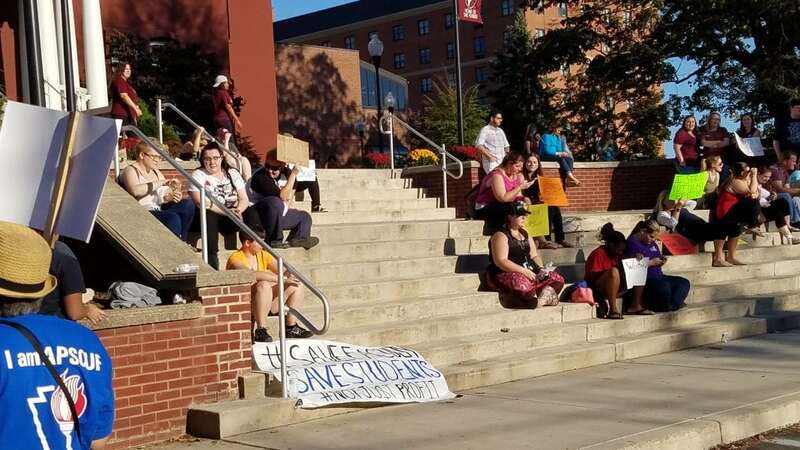 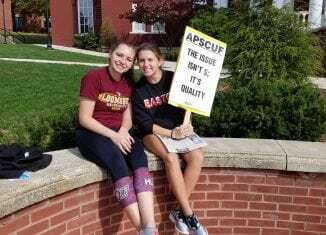 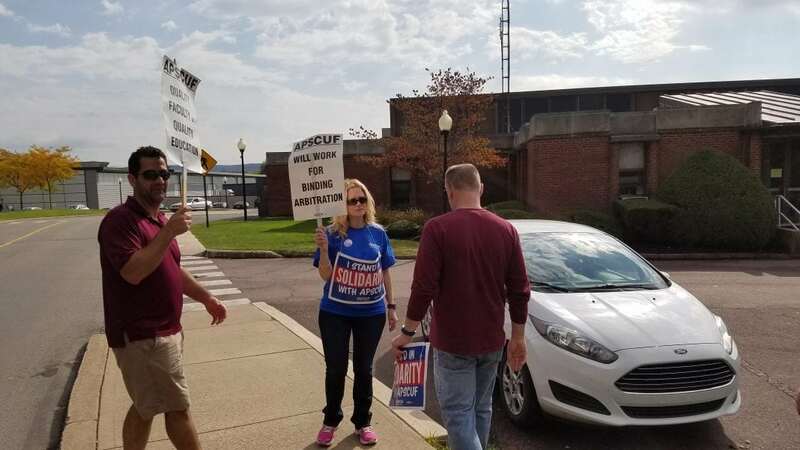 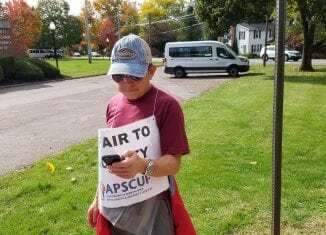 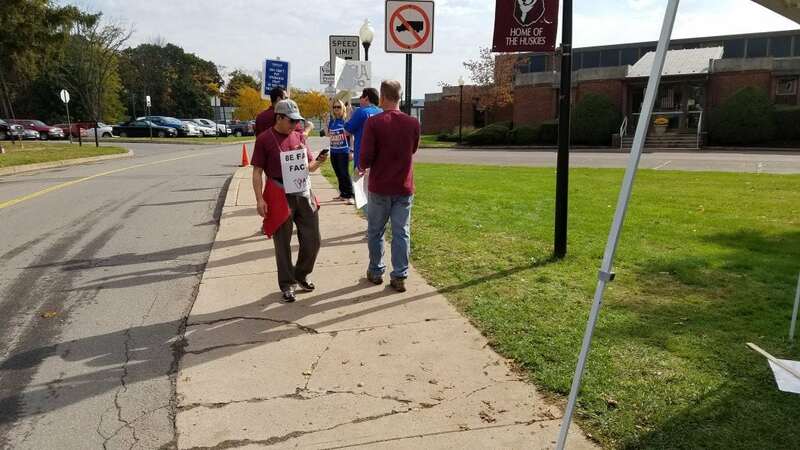 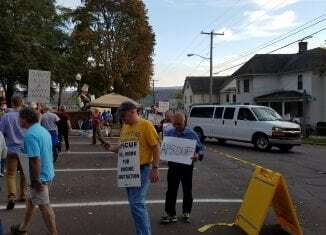 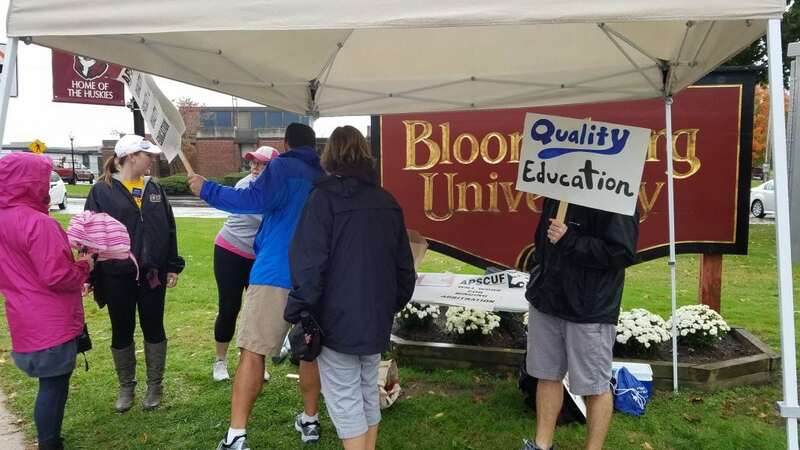 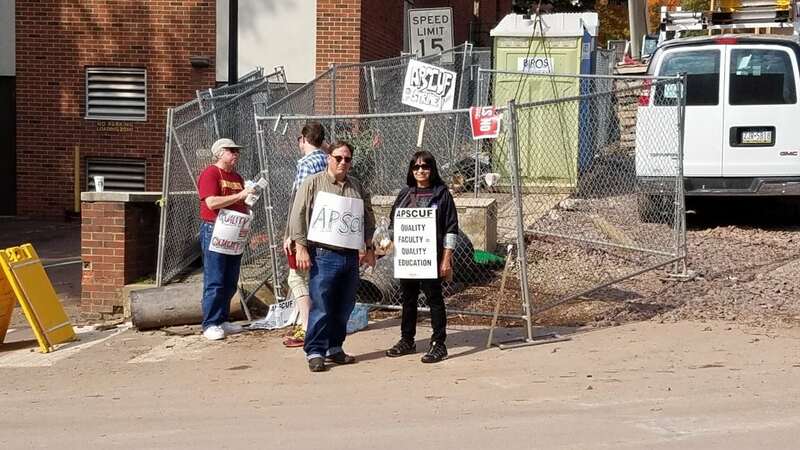 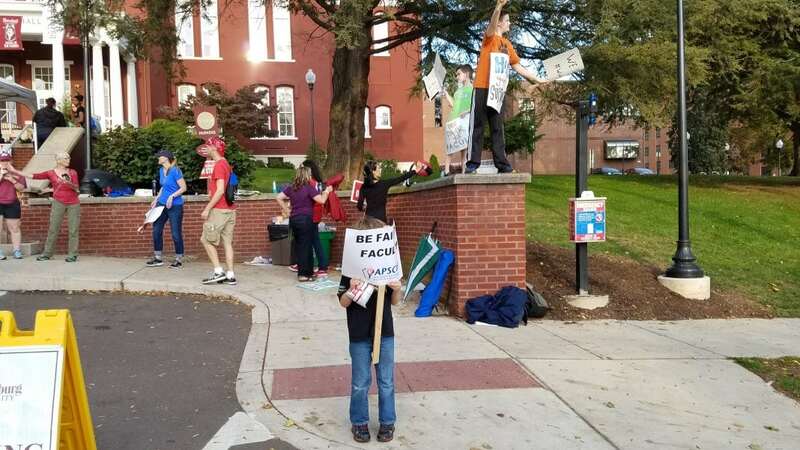 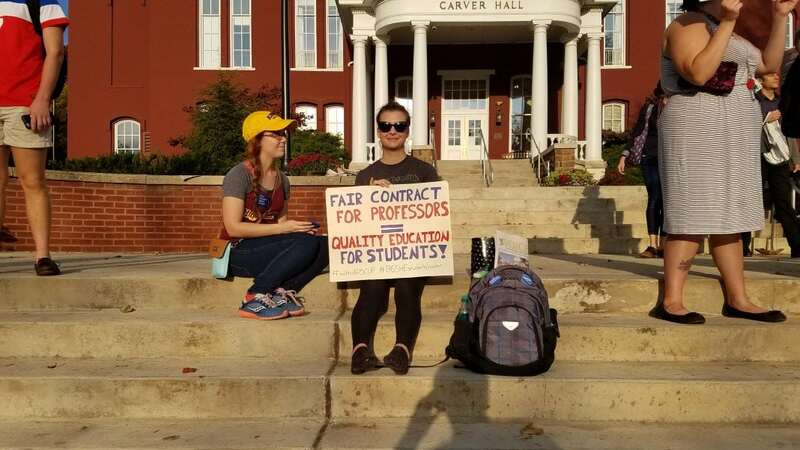 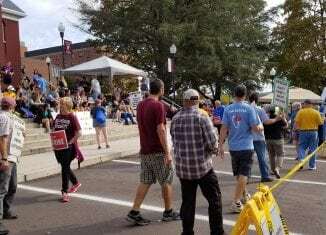 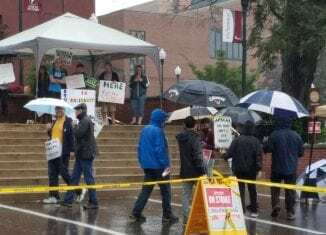 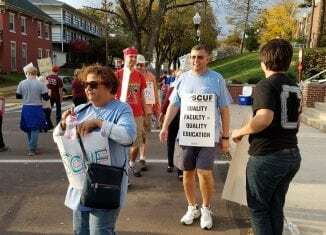 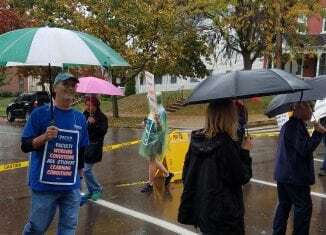 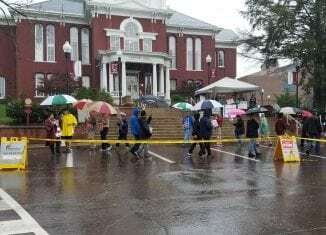 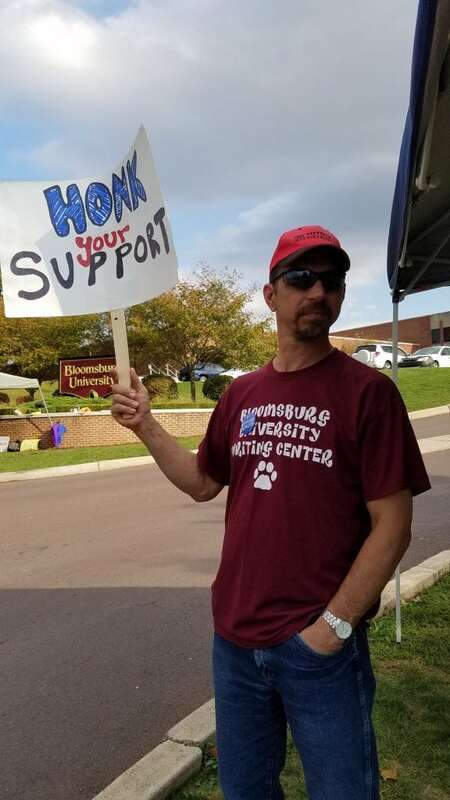 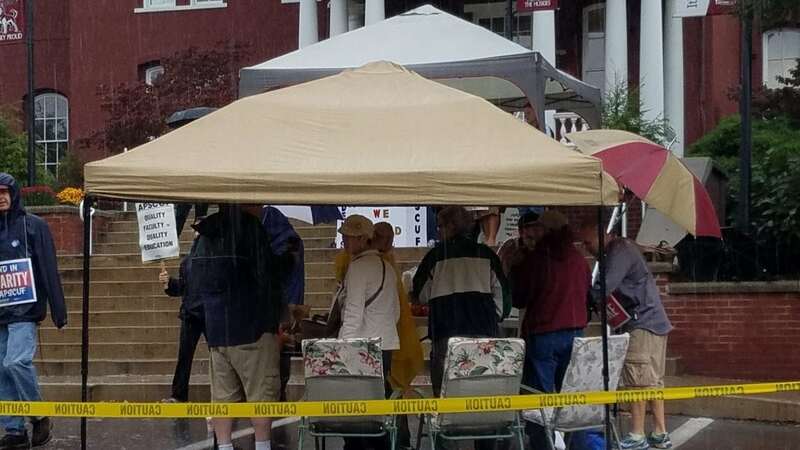 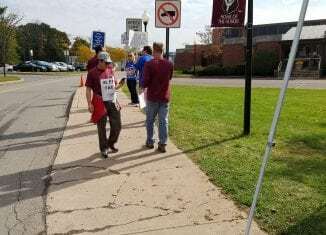 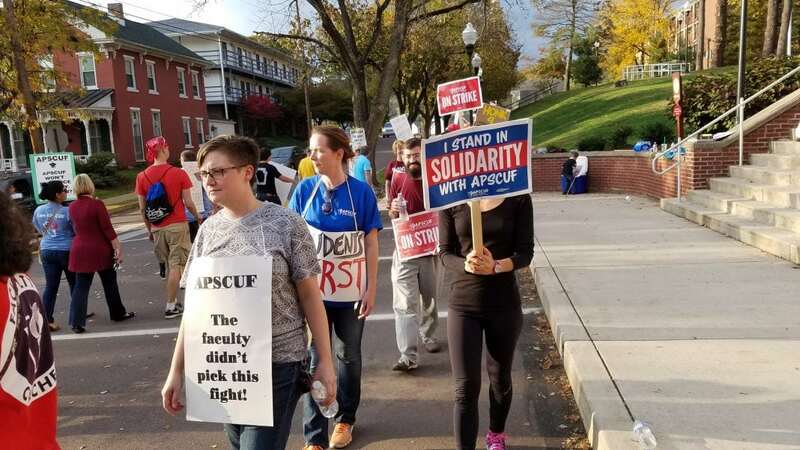 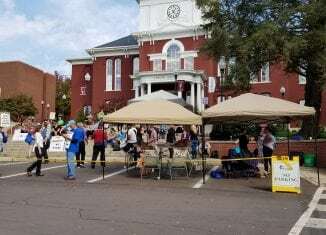 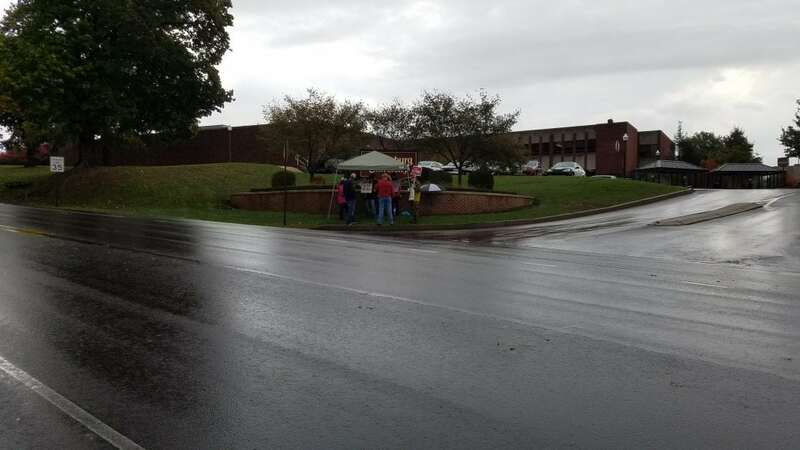 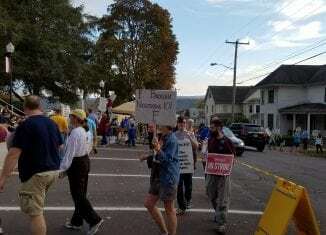 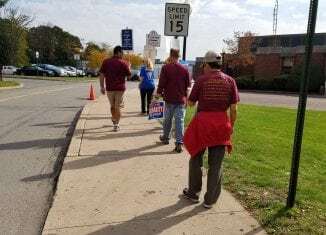 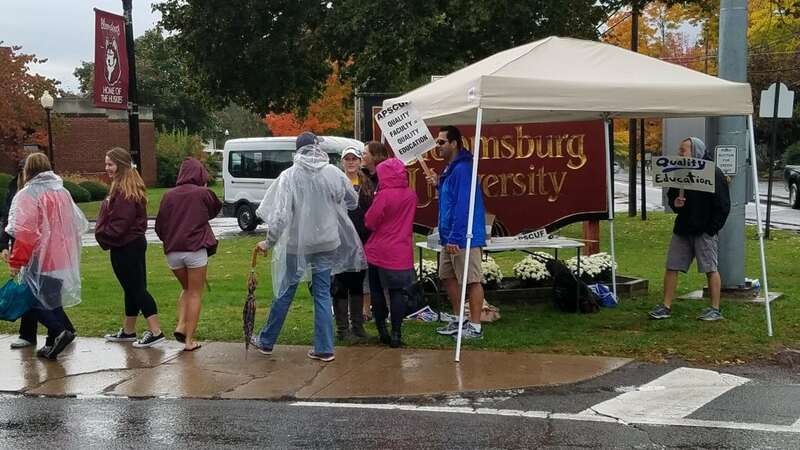 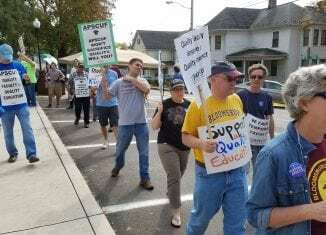 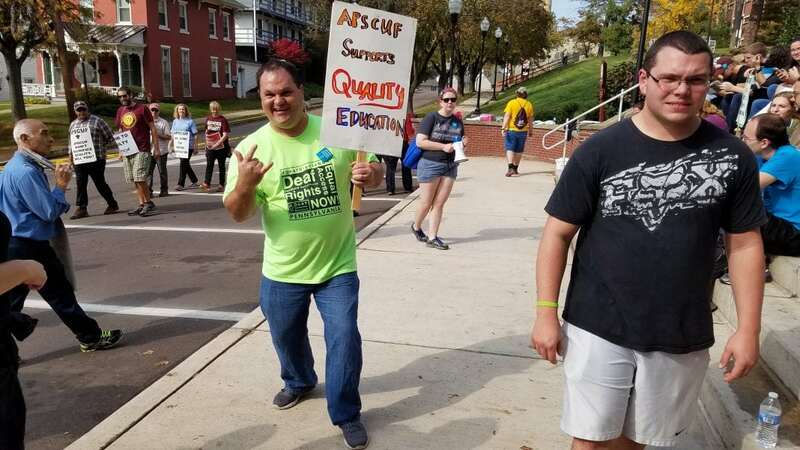 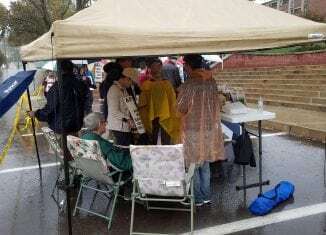 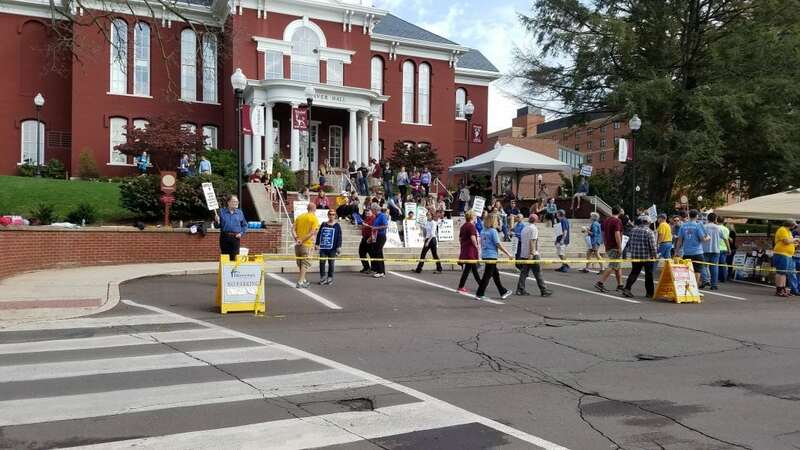 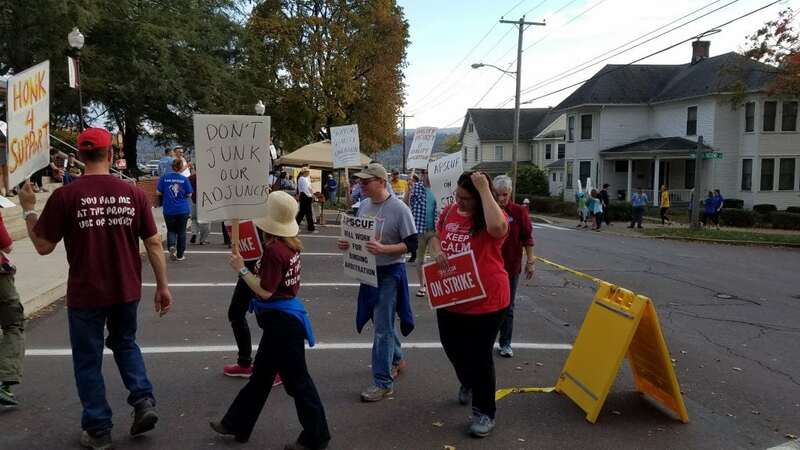 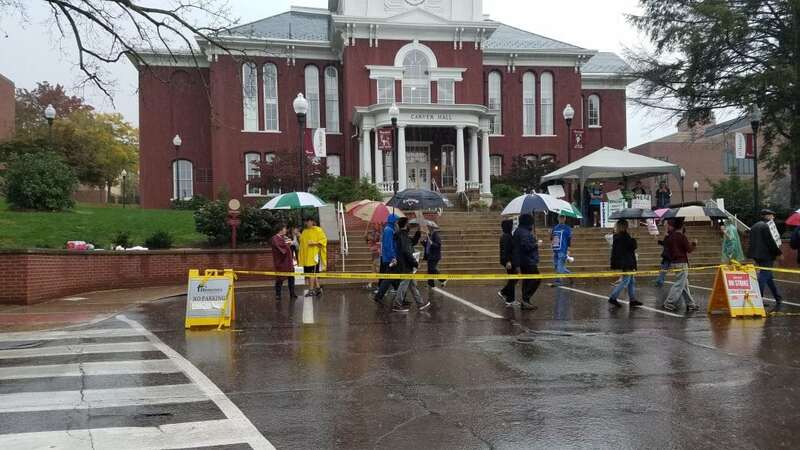 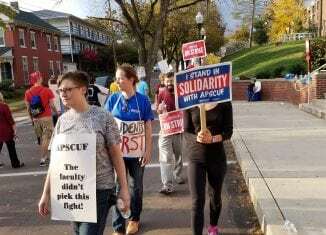 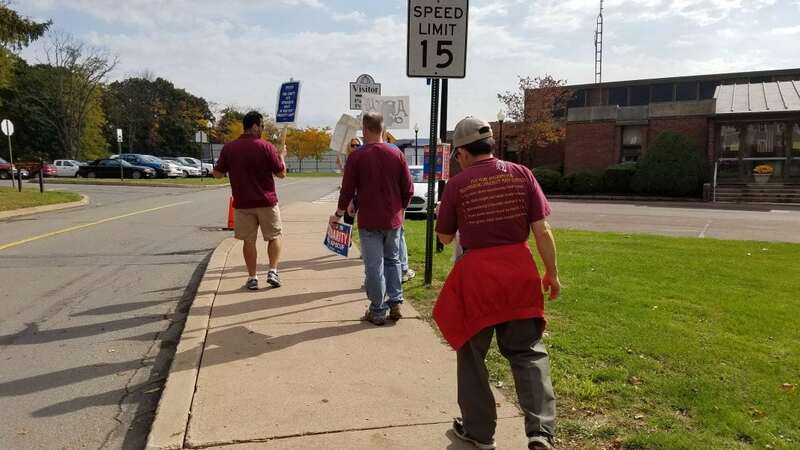 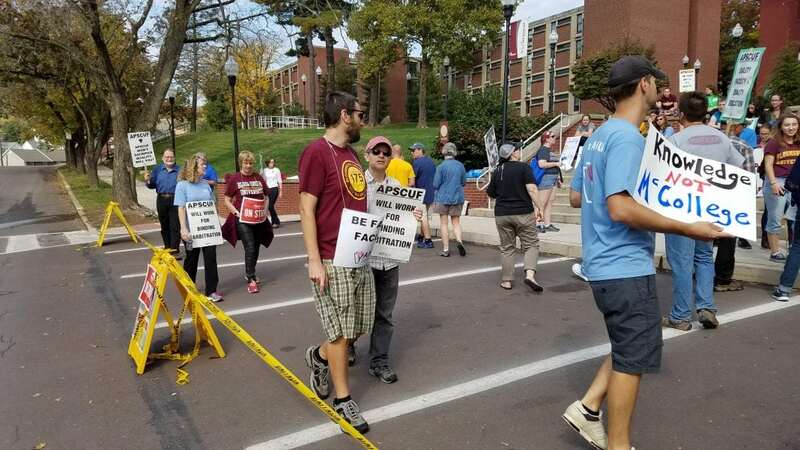 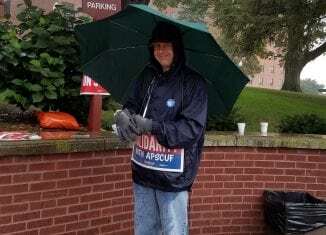 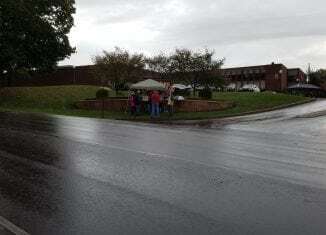 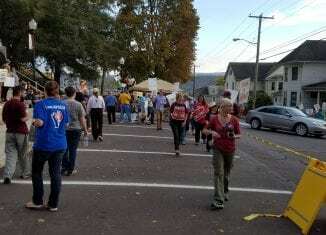 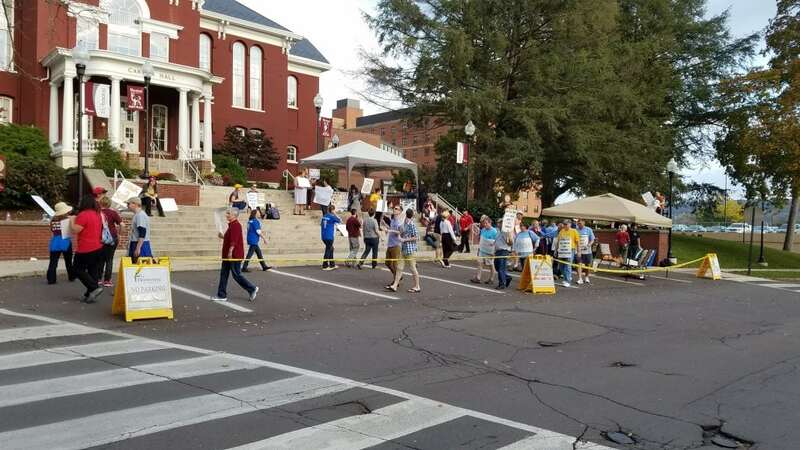 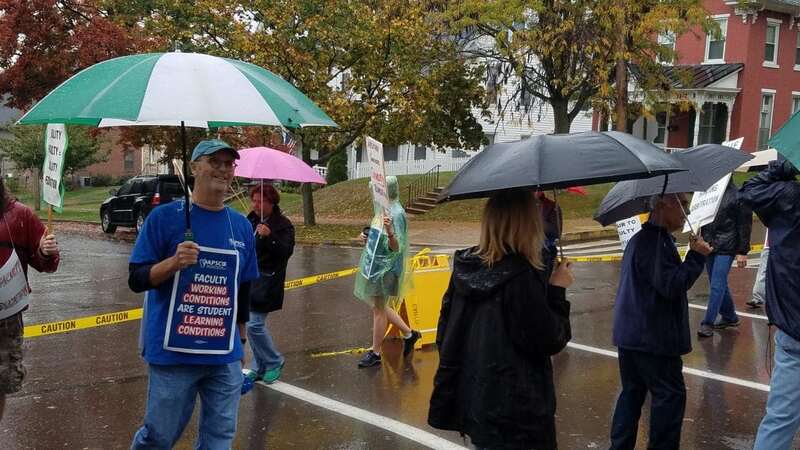 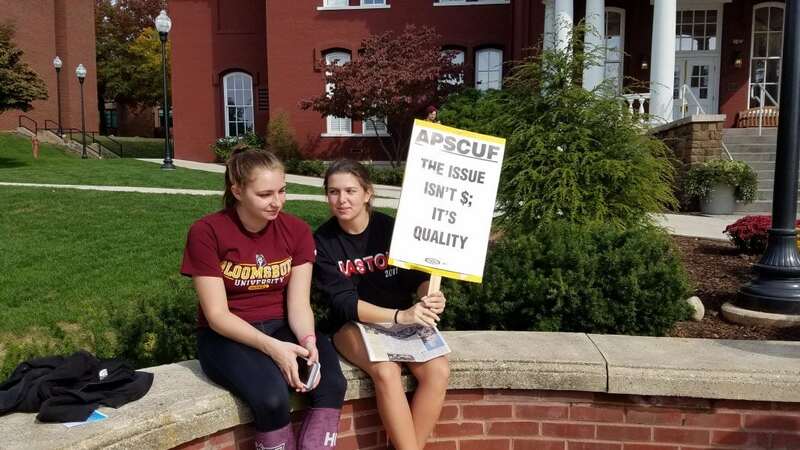 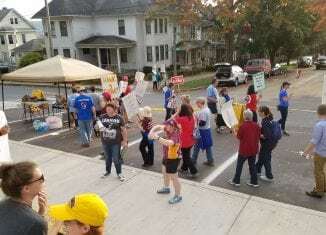 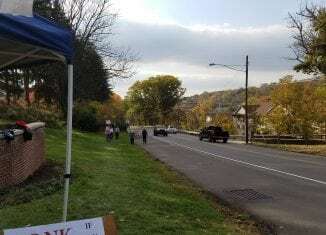 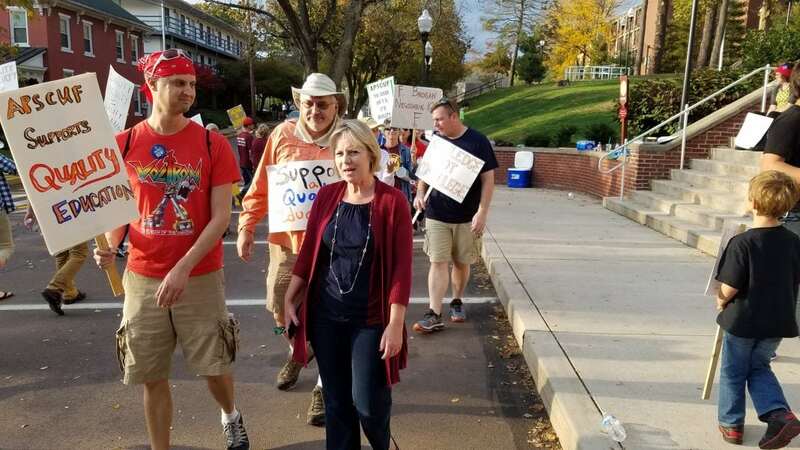 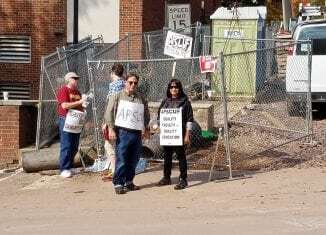 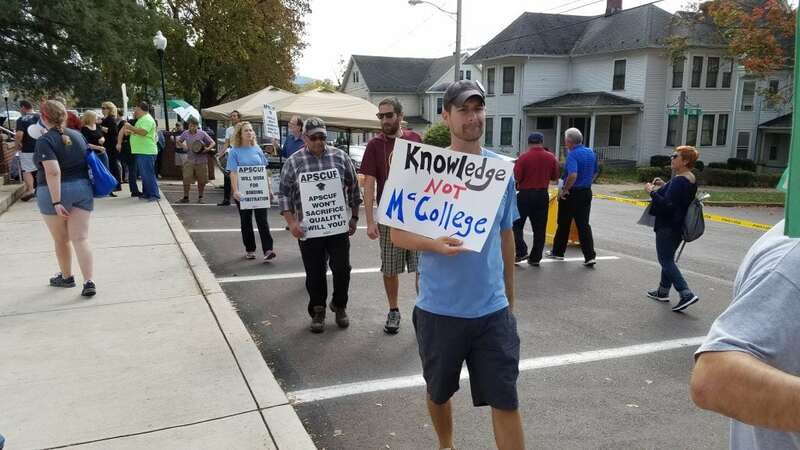 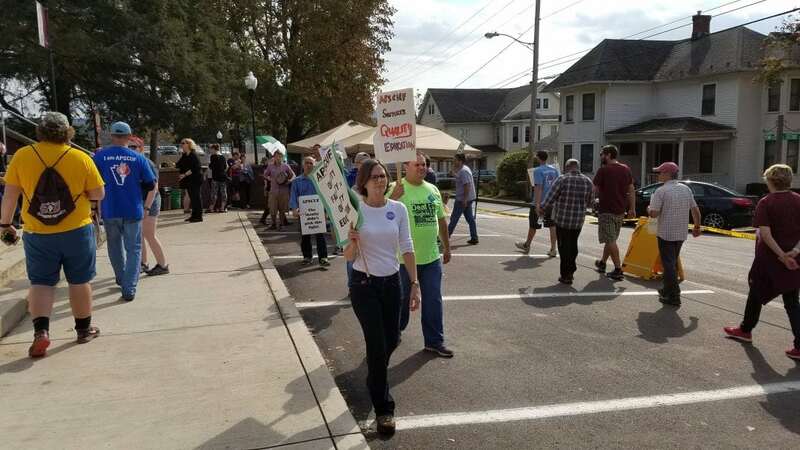 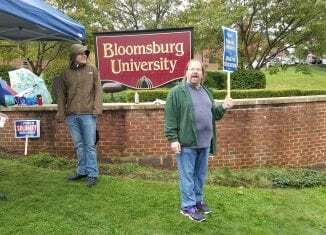 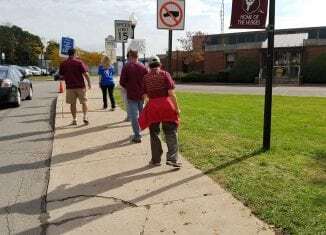 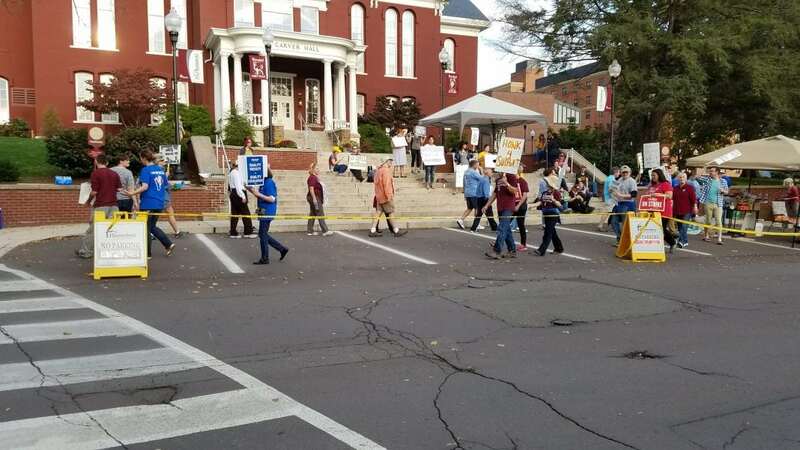 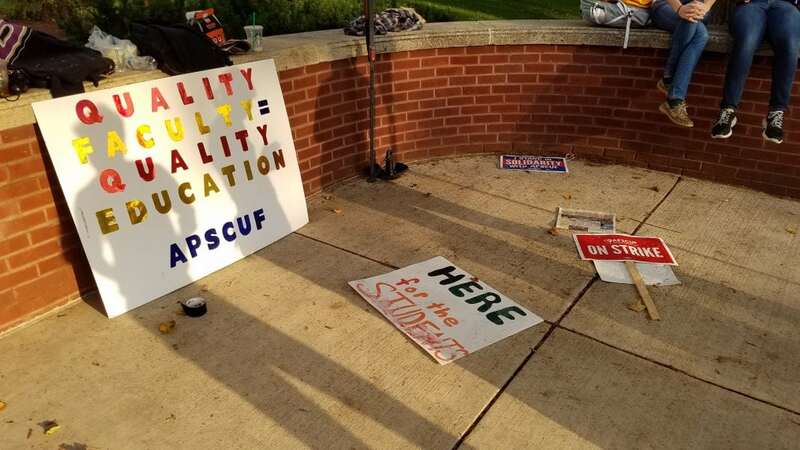 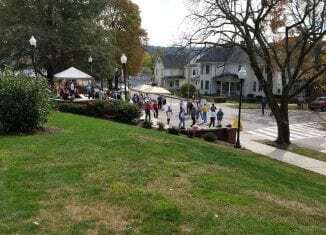 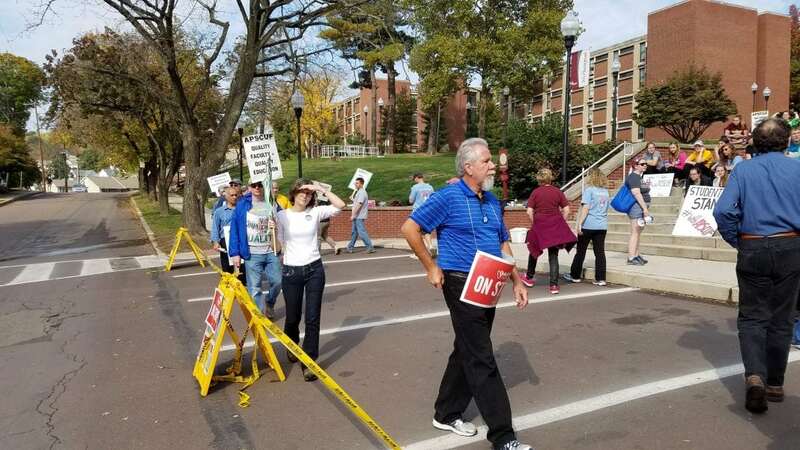 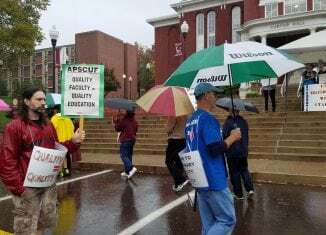 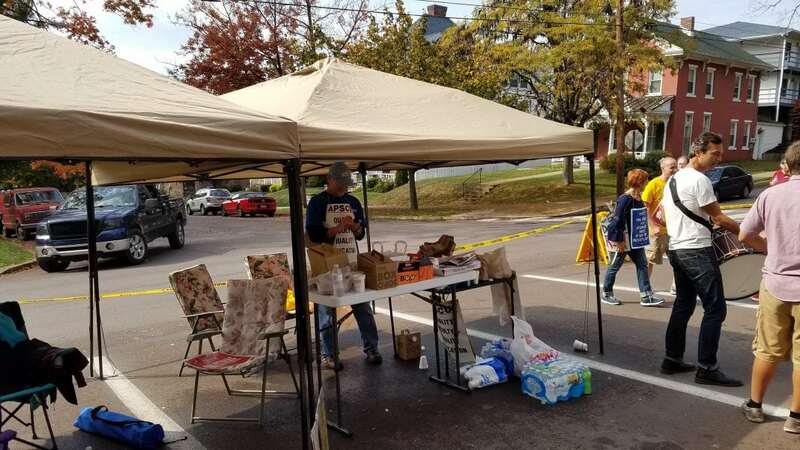 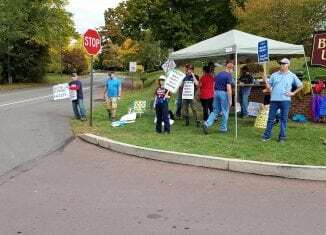 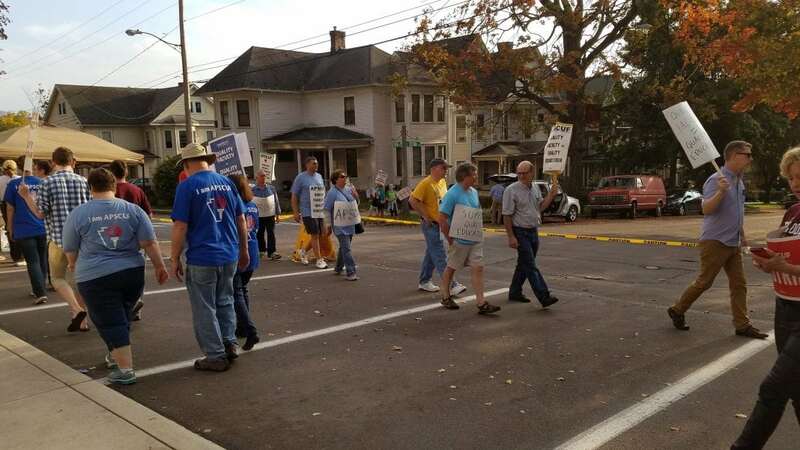 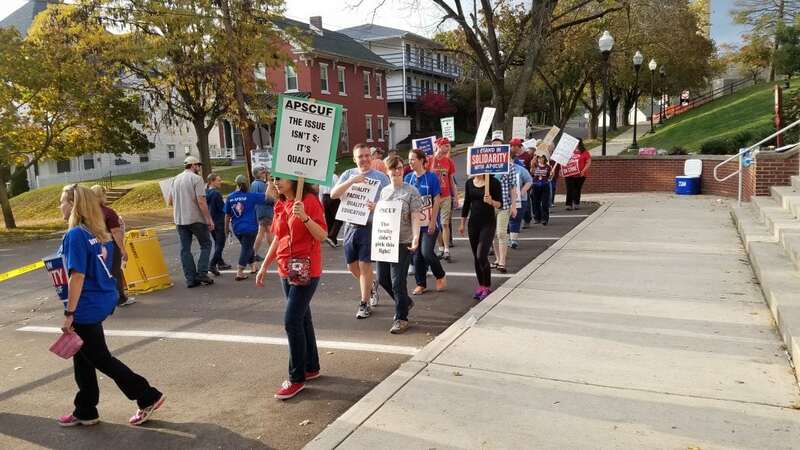 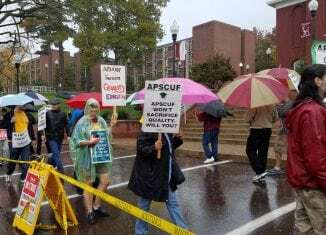 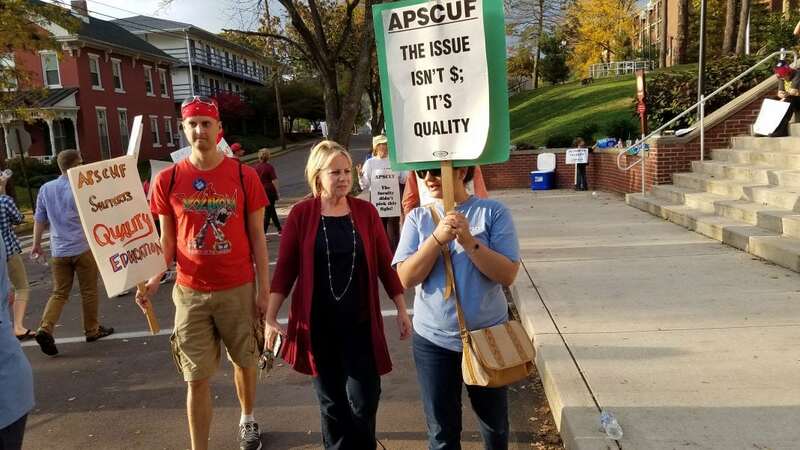 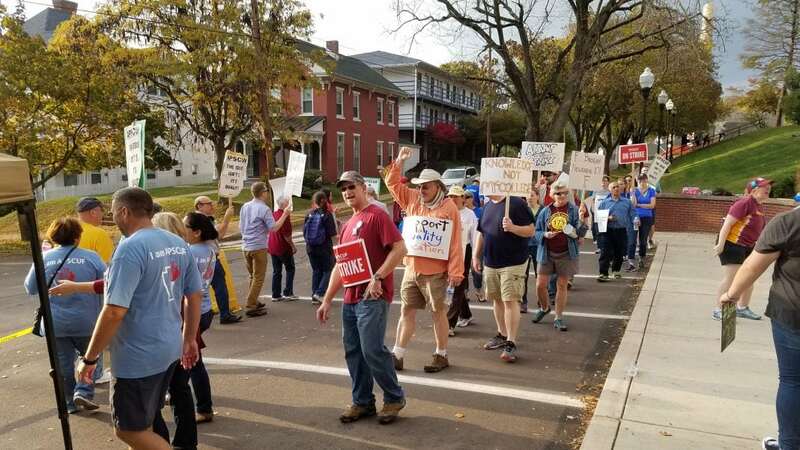 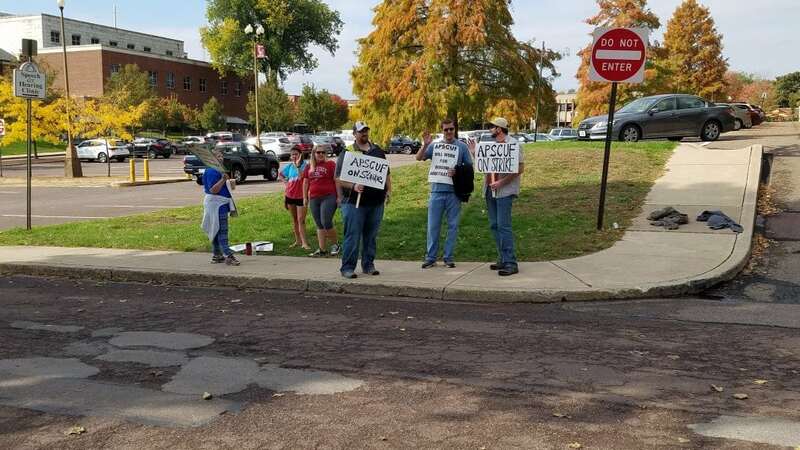 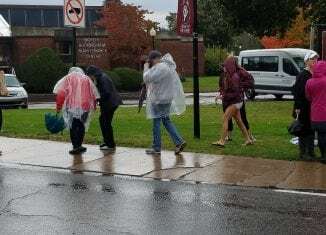 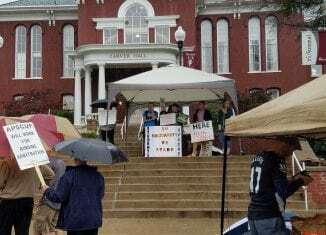 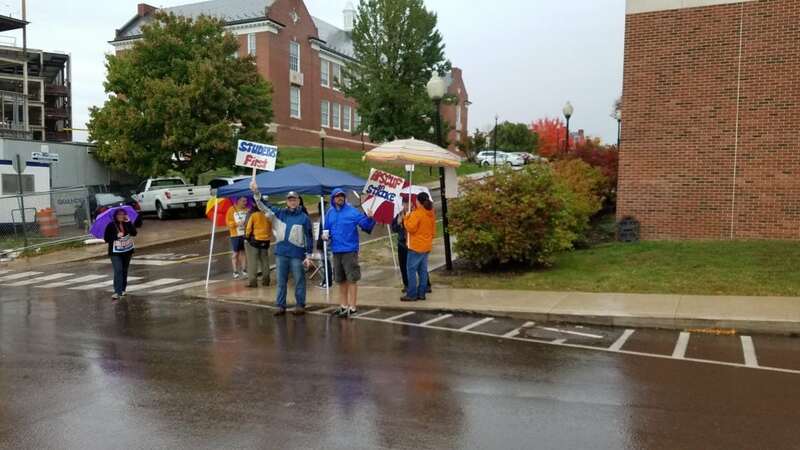 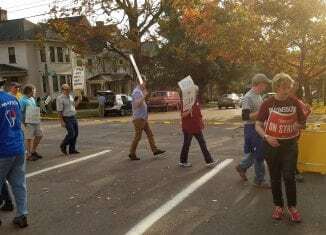 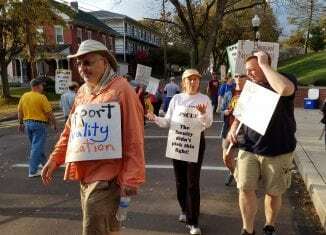 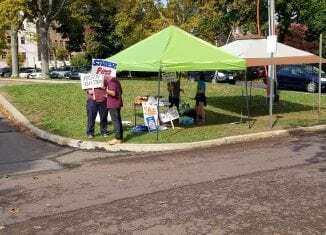 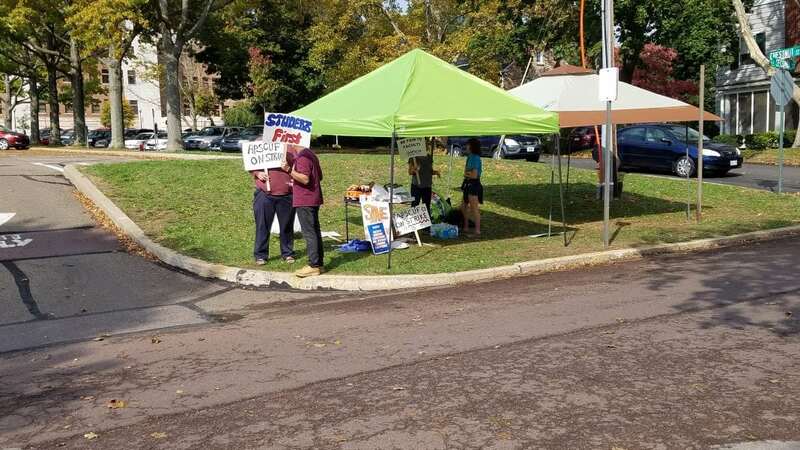 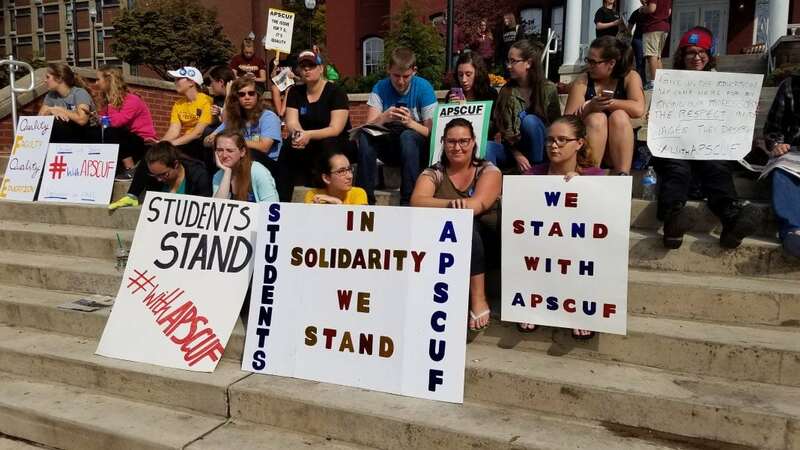 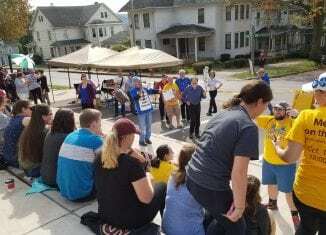 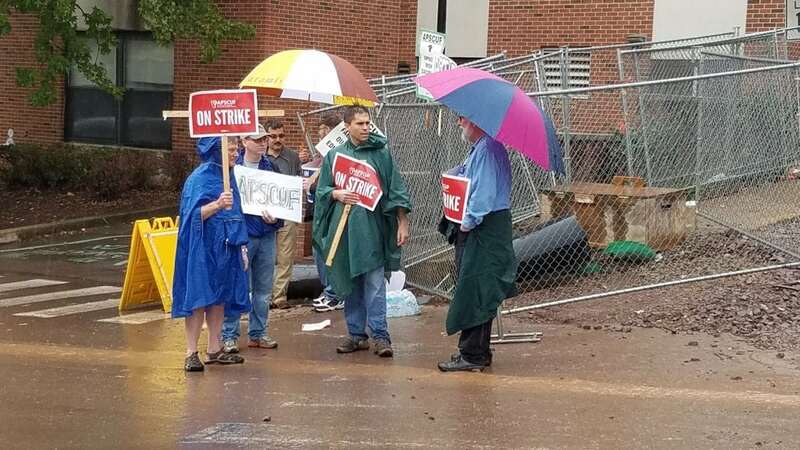 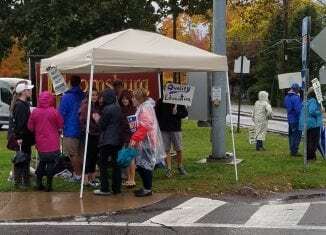 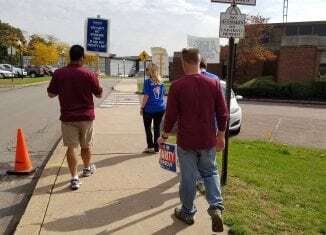 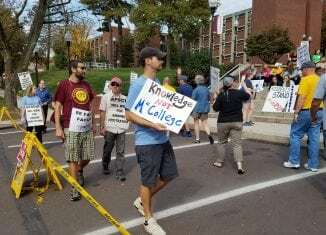 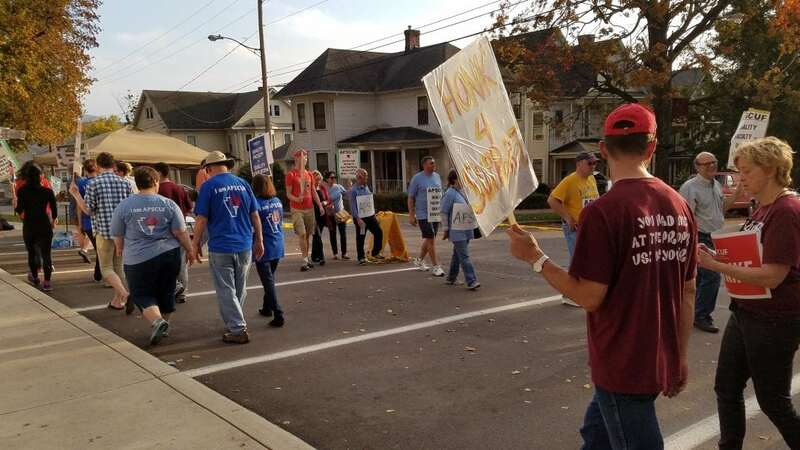 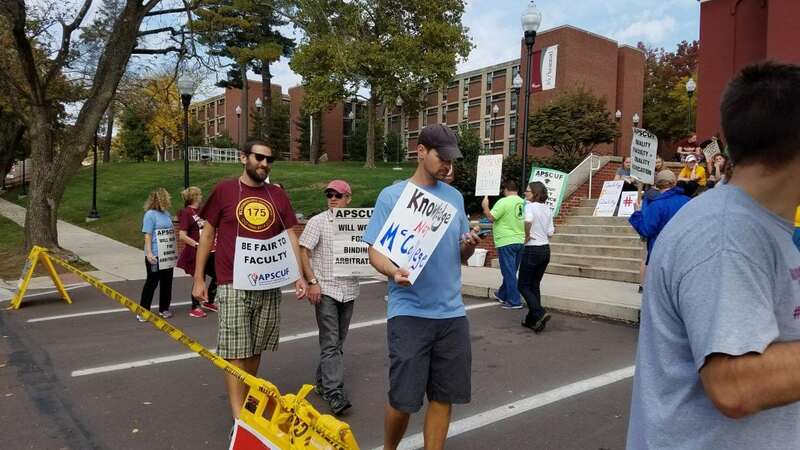 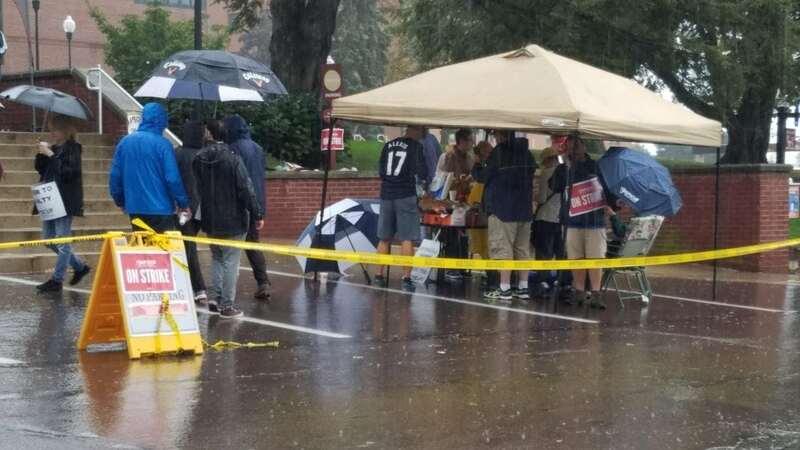 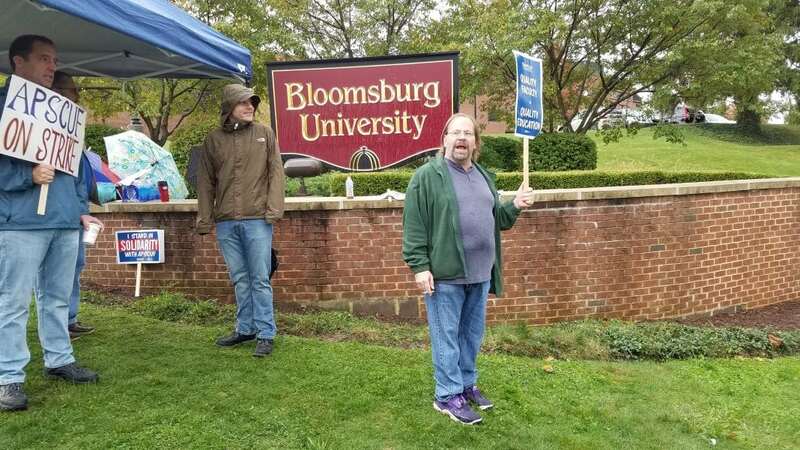 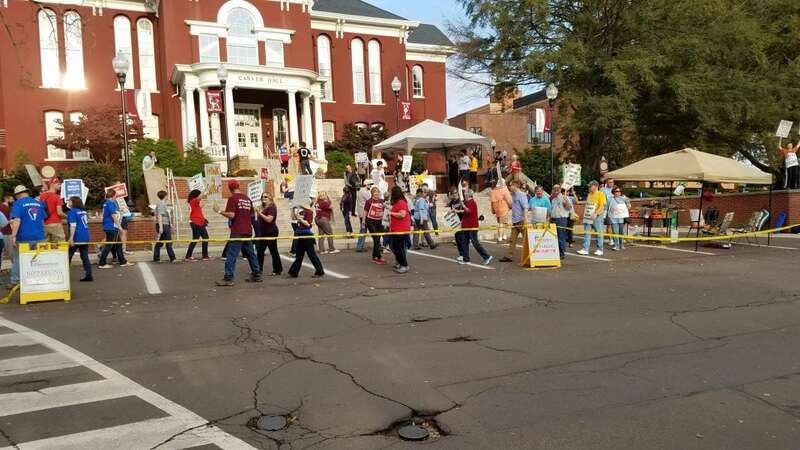 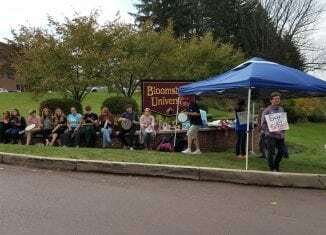 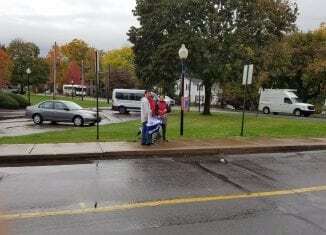 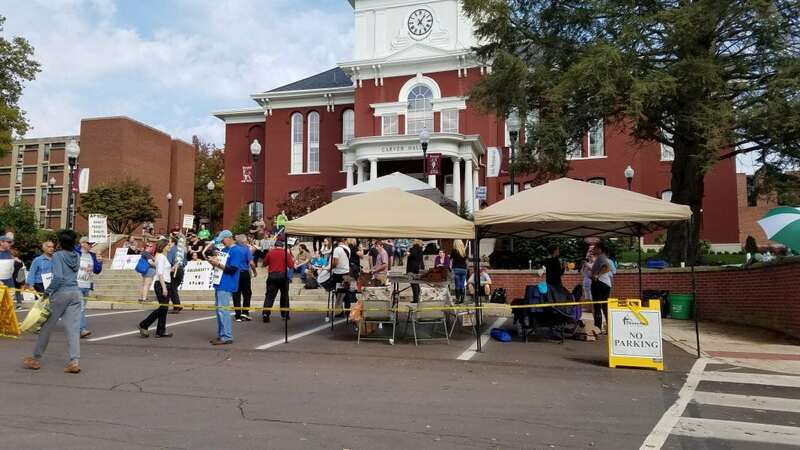 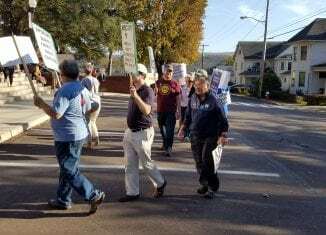 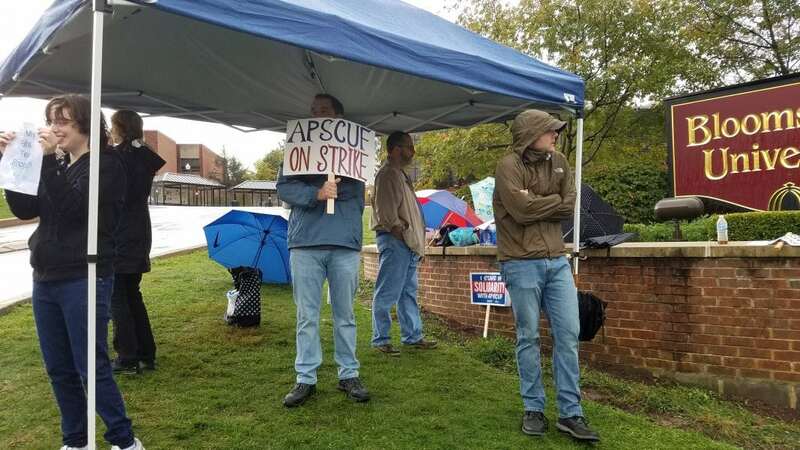 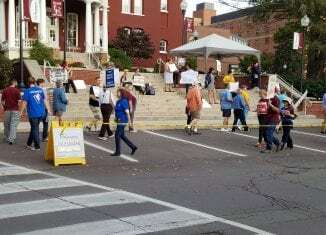 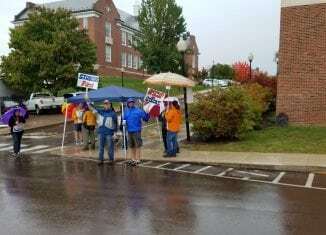 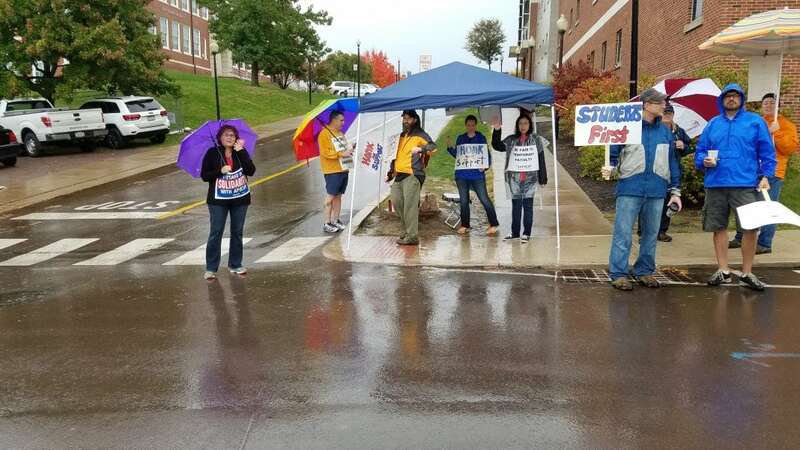 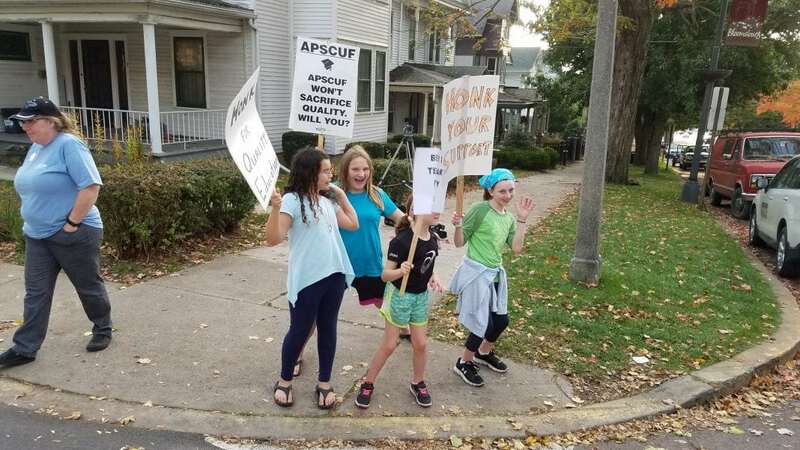 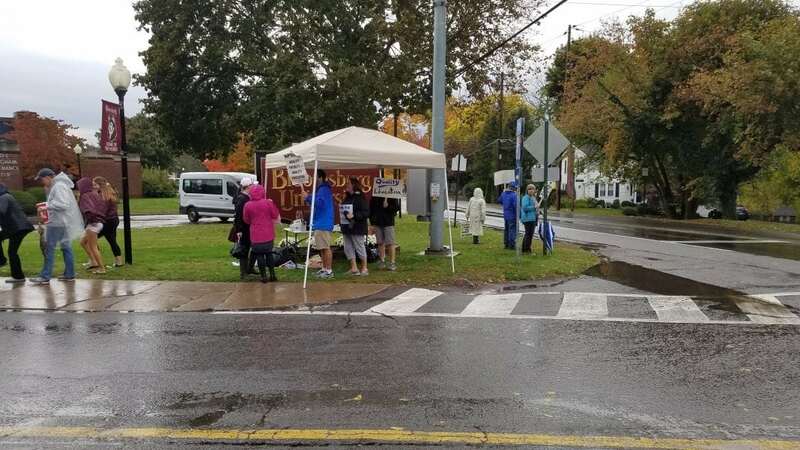 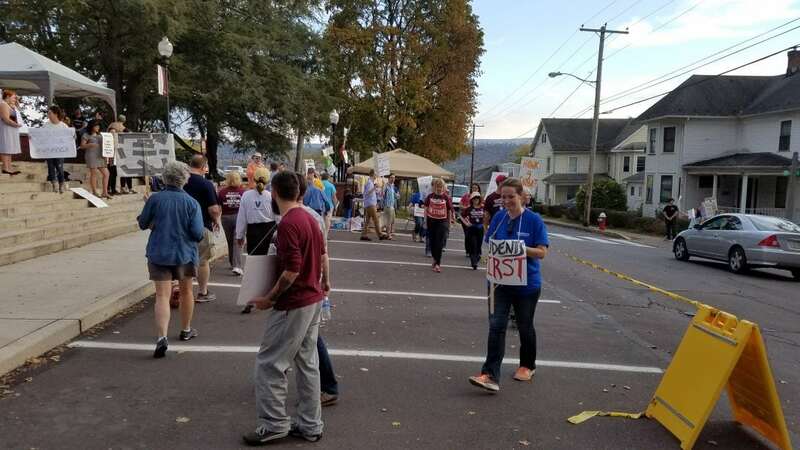 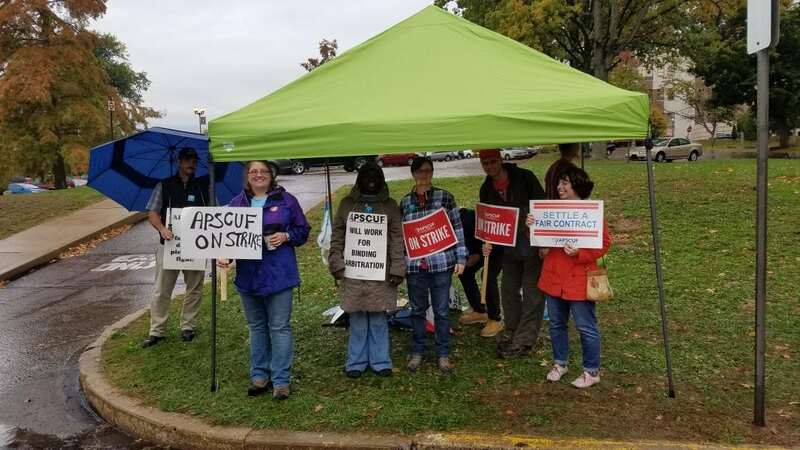 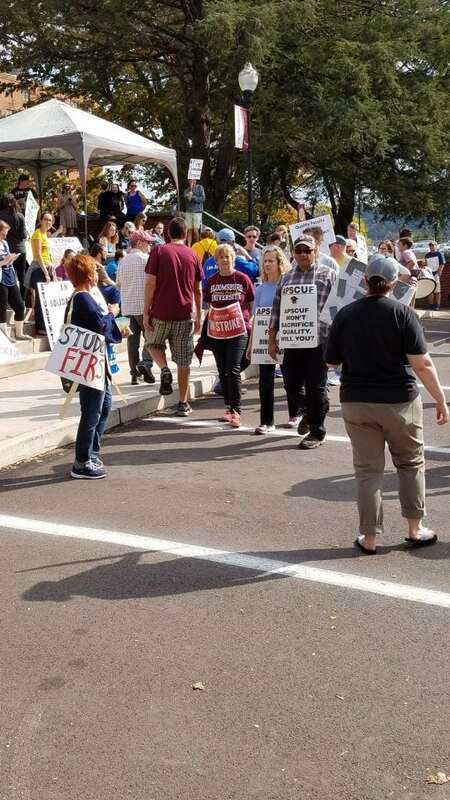 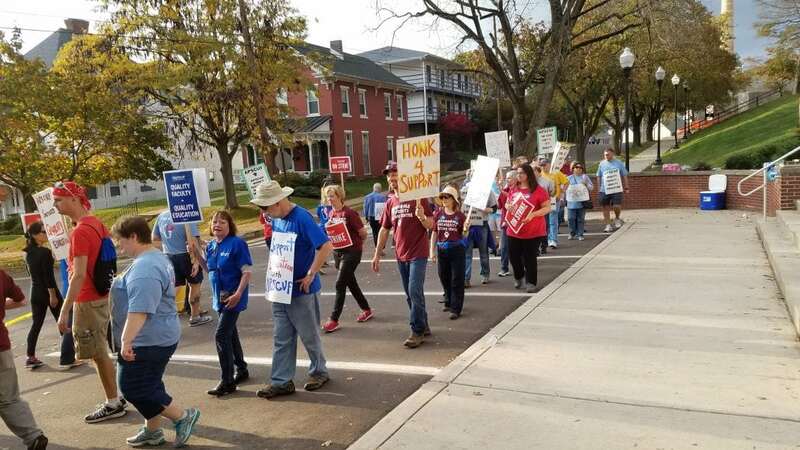 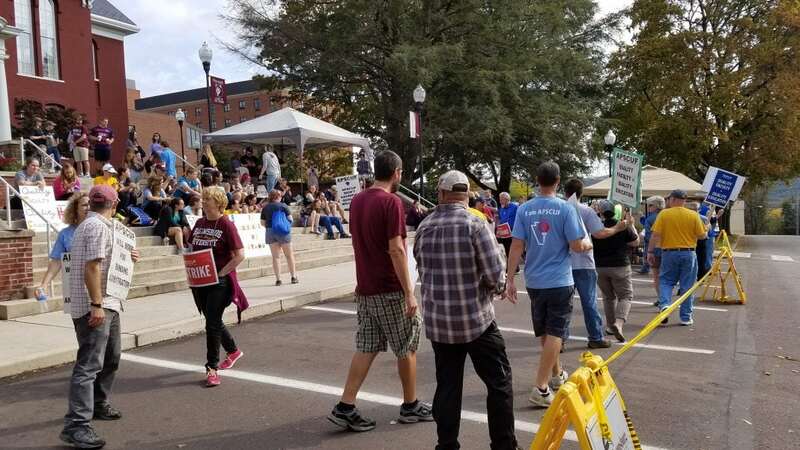 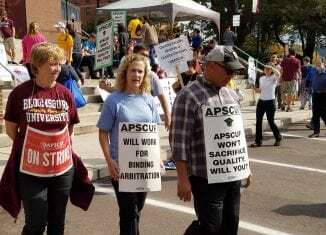 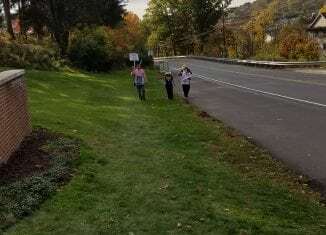 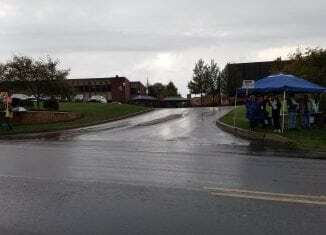 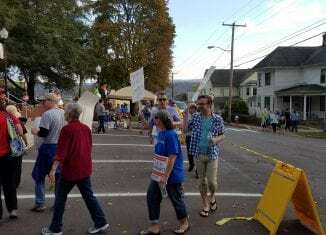 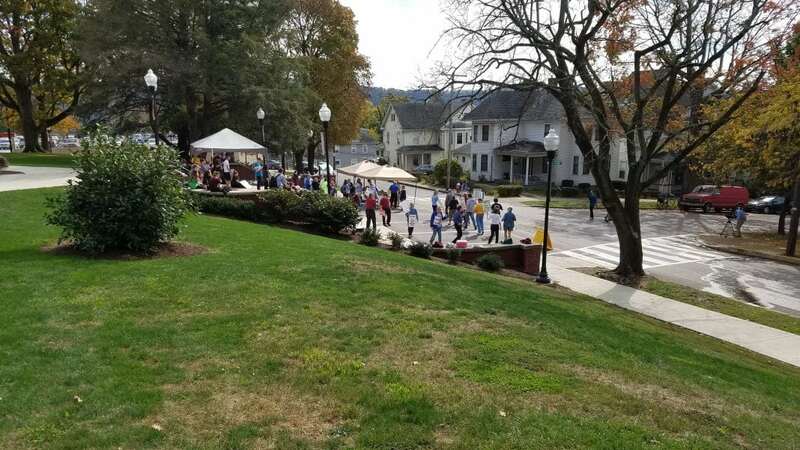 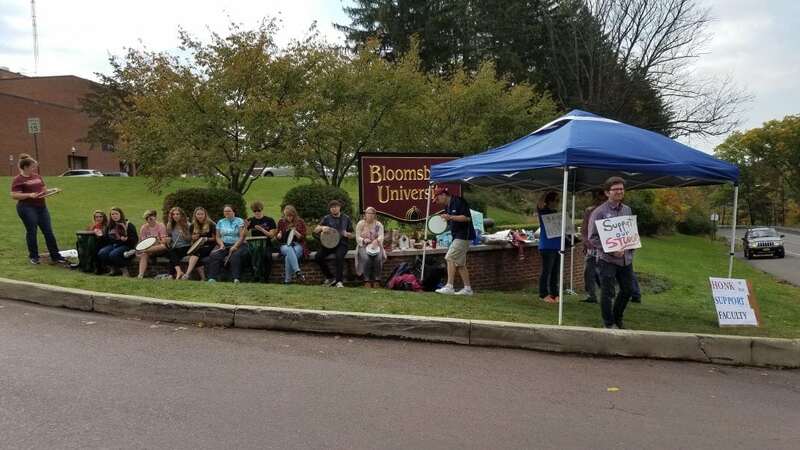 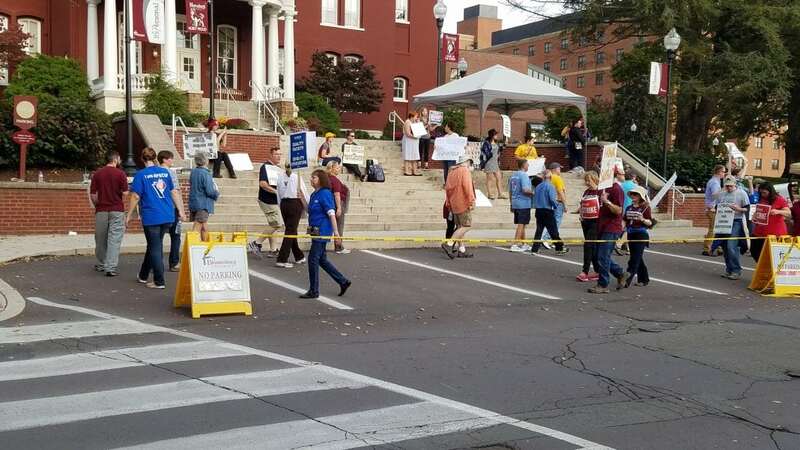 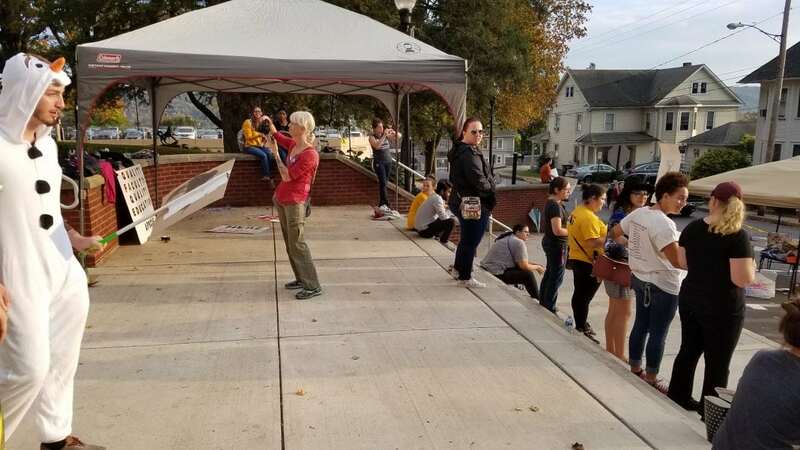 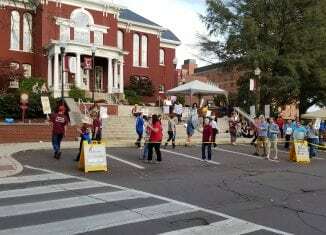 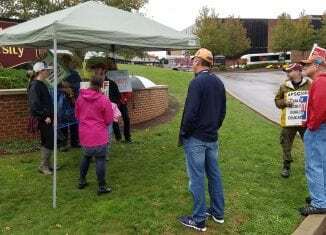 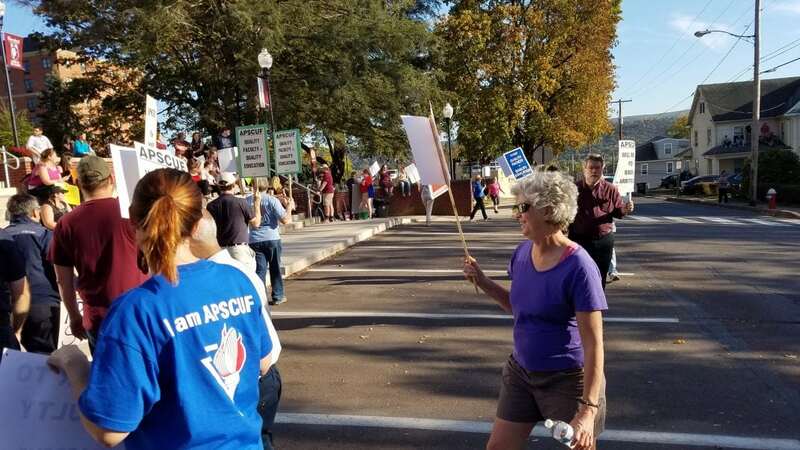 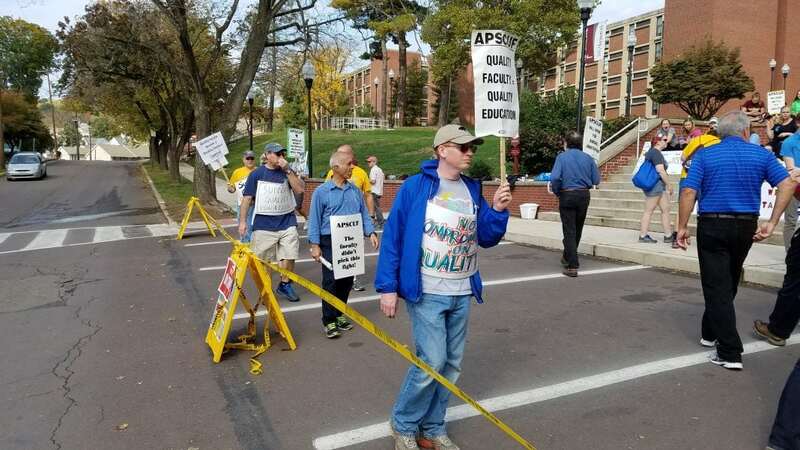 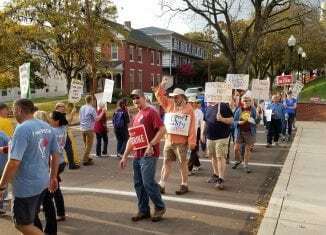 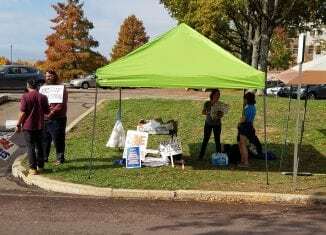 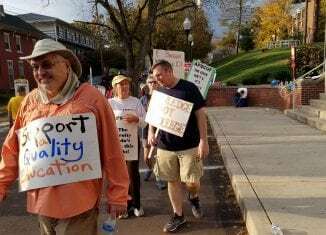 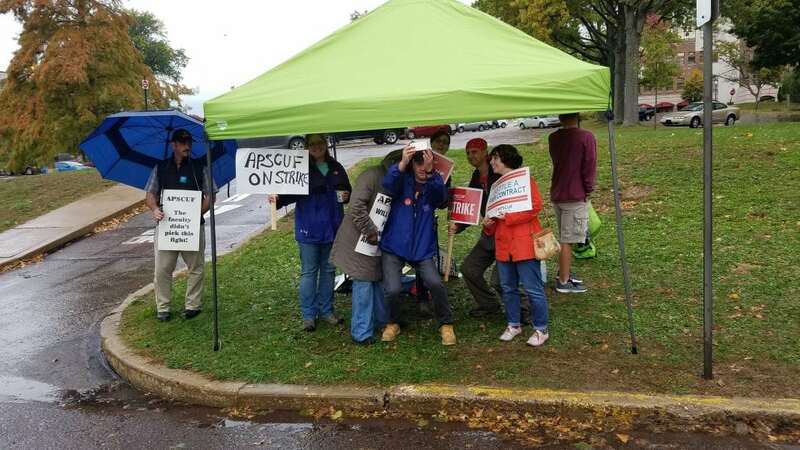 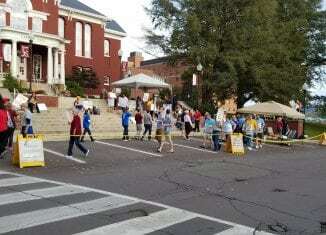 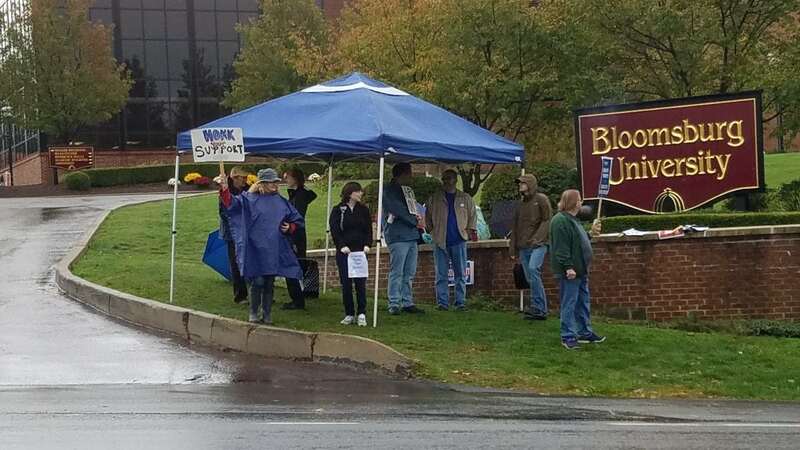 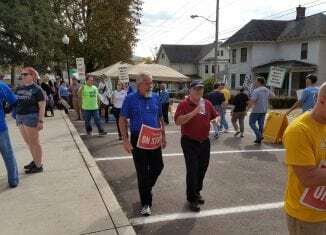 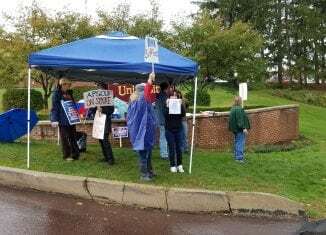 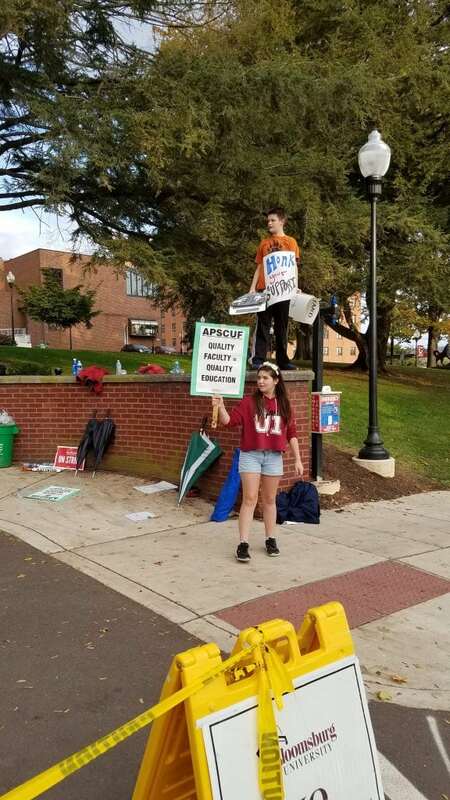 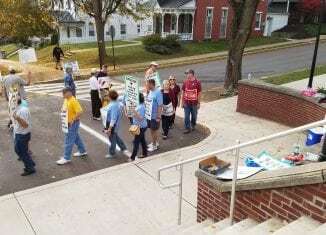 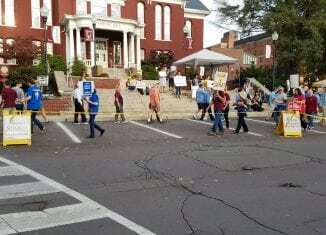 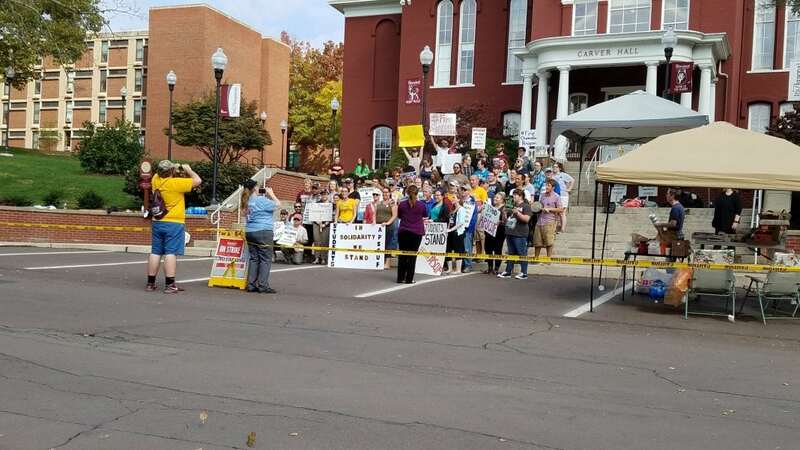 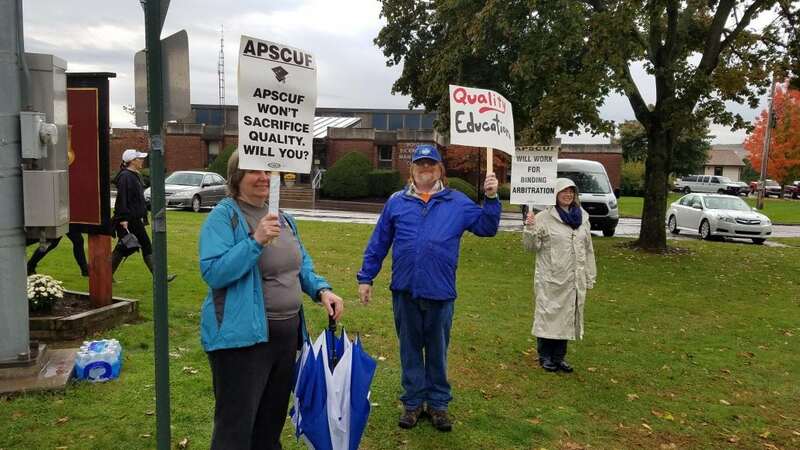 With the second day of the Bloomsburg University Faculty strike coming to a close, the Association of Pennsylvania State College and University Faculties (APSCUF) and Pennsylvania State System of Higher Education (PASSHE) still has not come to amicable terms for a new contract; the strike will continue on tomorrow at Bloomsburg University and the 13 Pennsylvanian state college and universities. 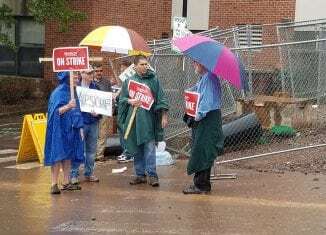 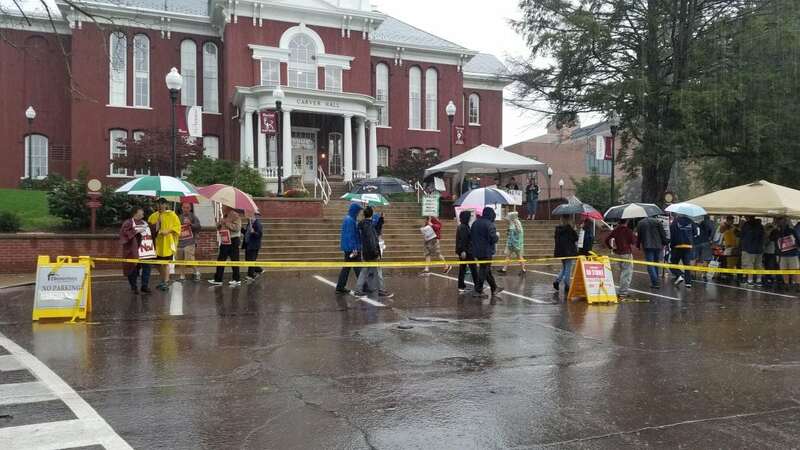 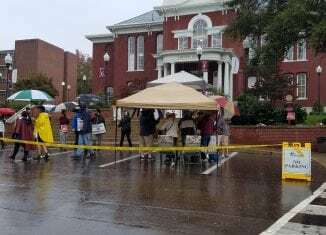 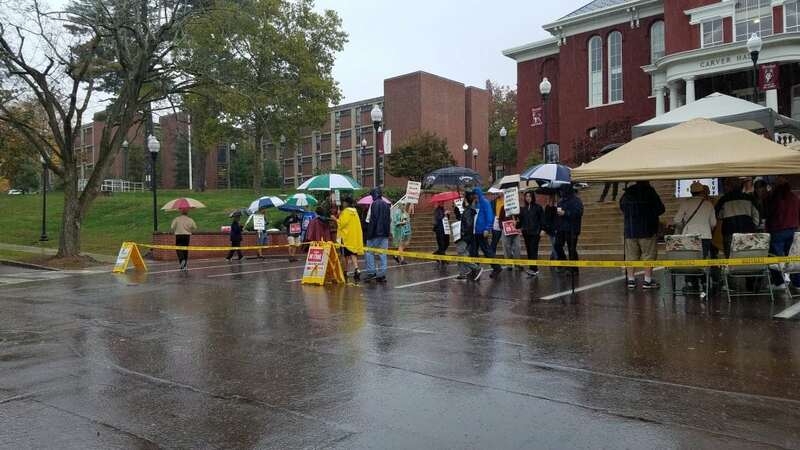 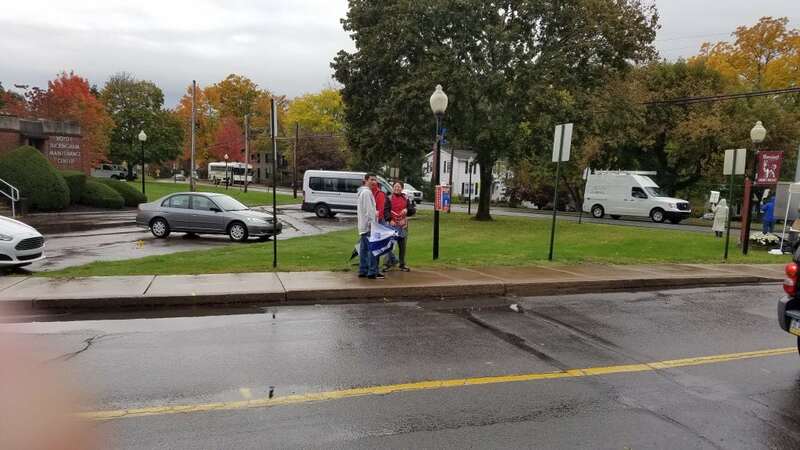 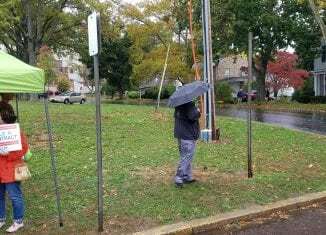 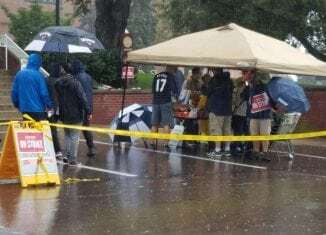 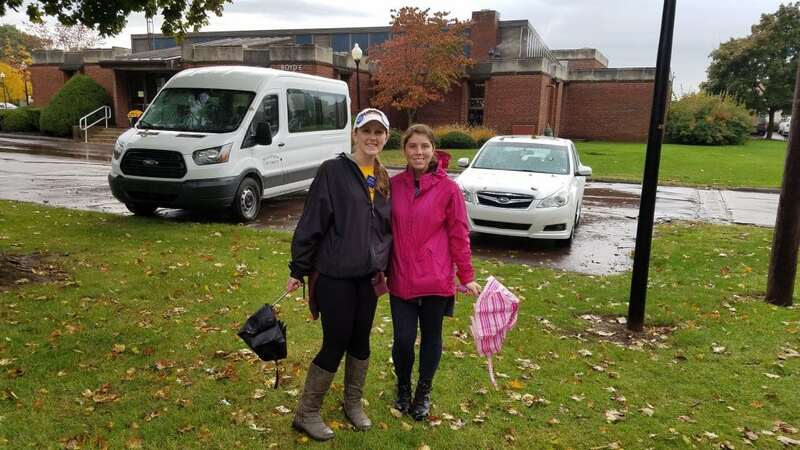 The strike started at a dreary rainy day until the clouds cleared up where the striking faculty and the university students did not have to strike in the rain but in the humid weather. 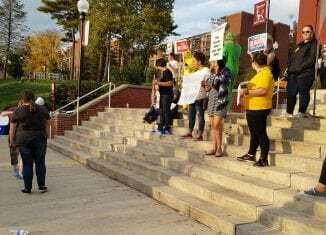 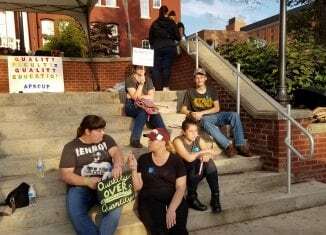 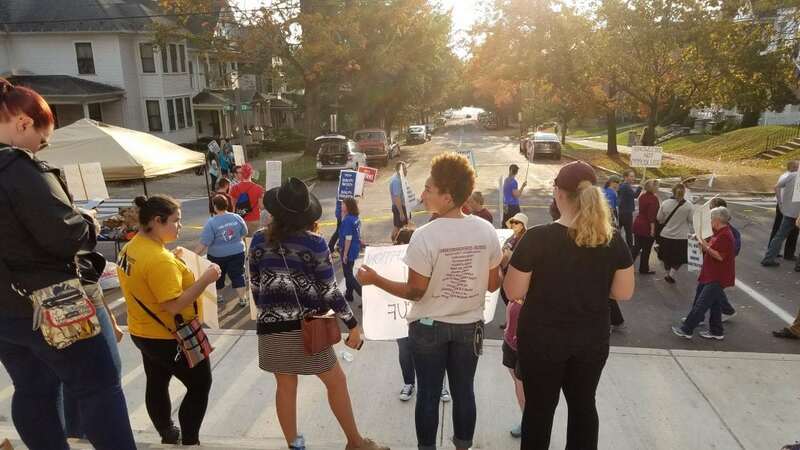 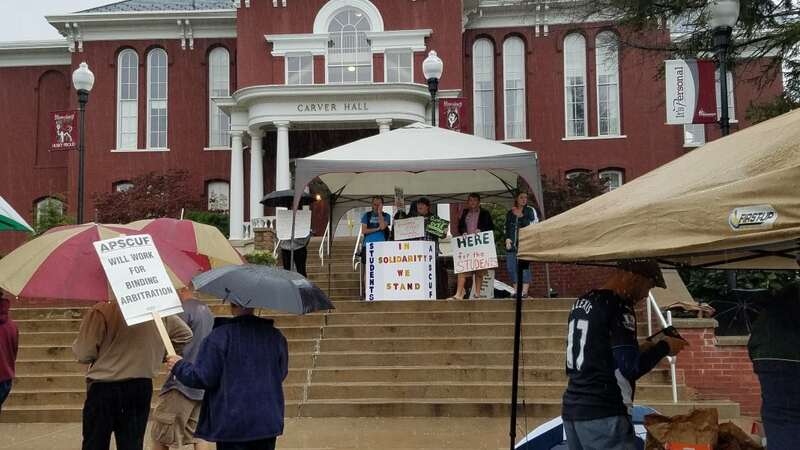 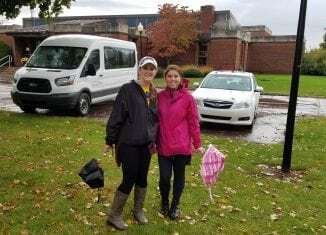 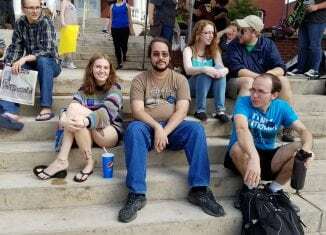 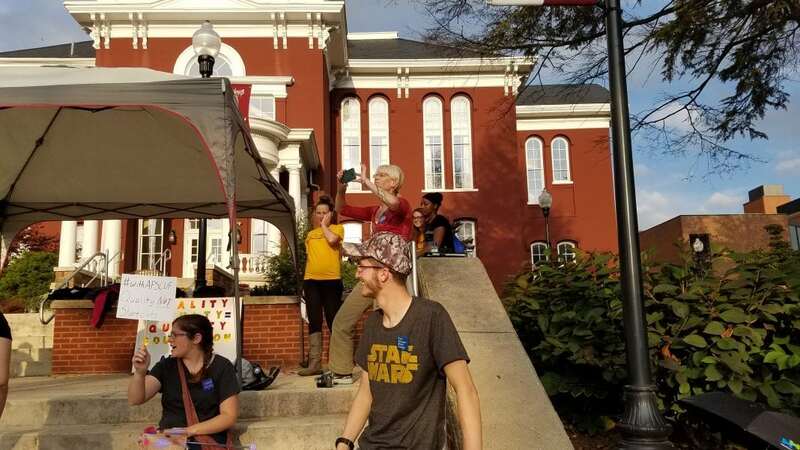 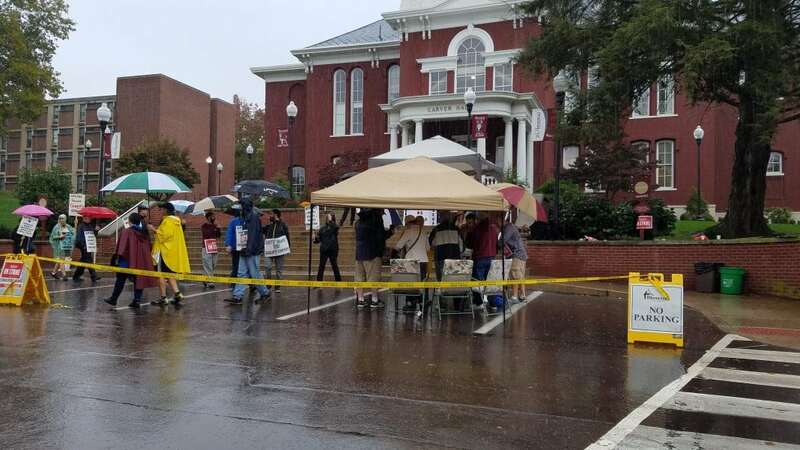 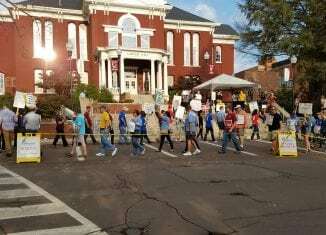 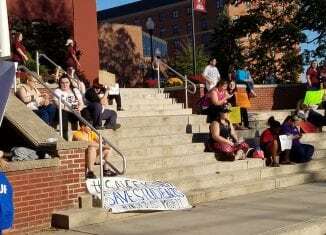 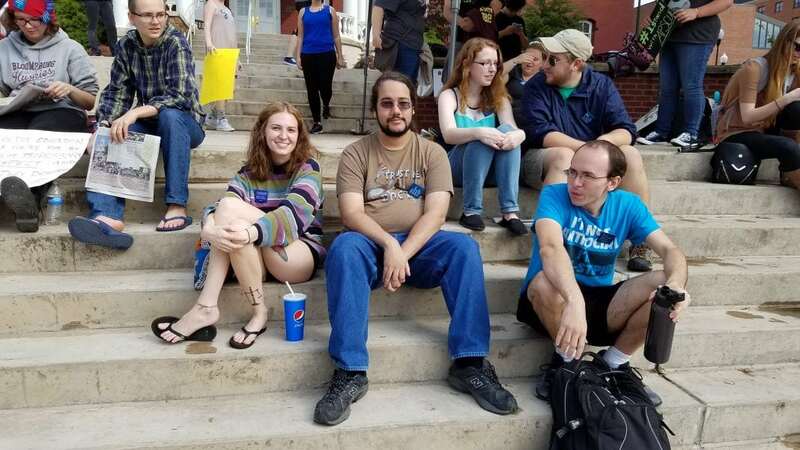 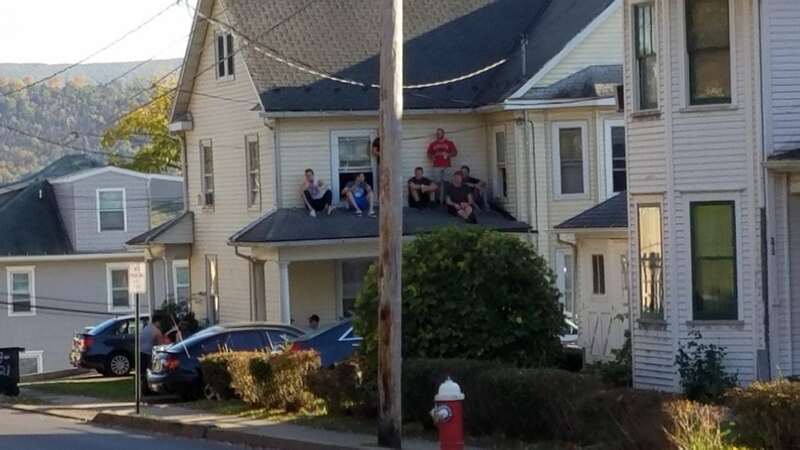 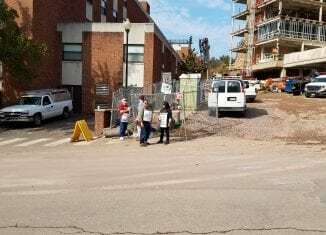 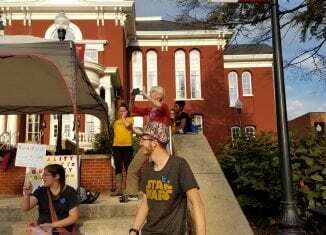 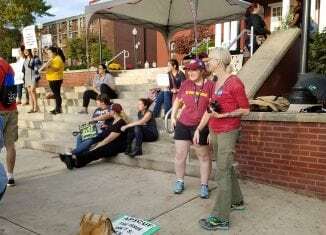 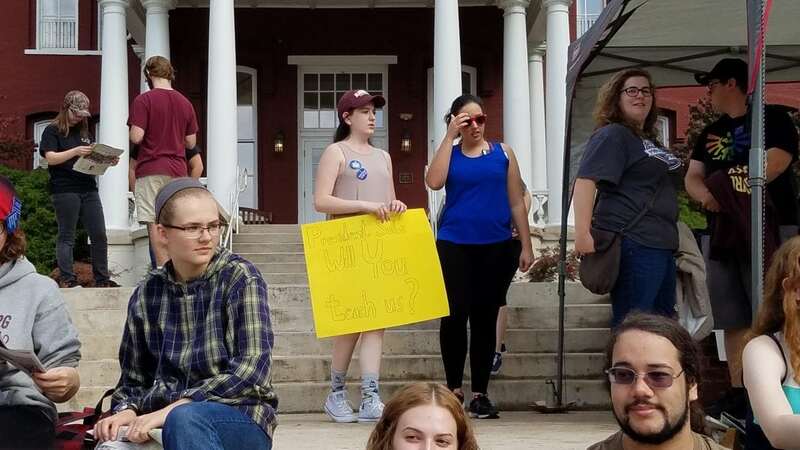 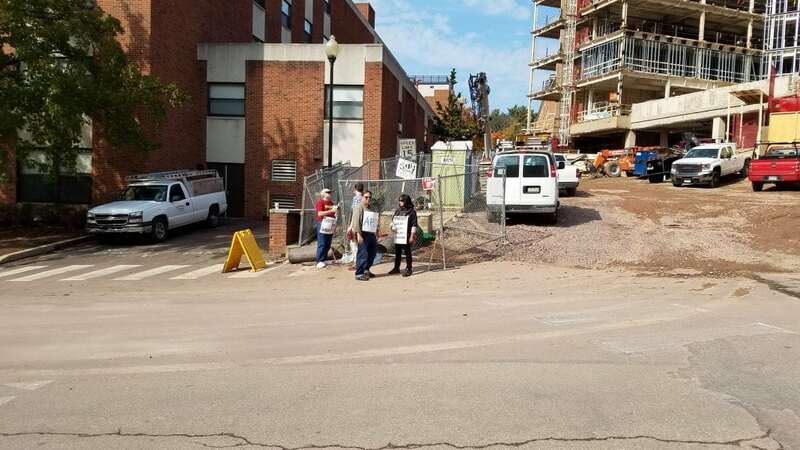 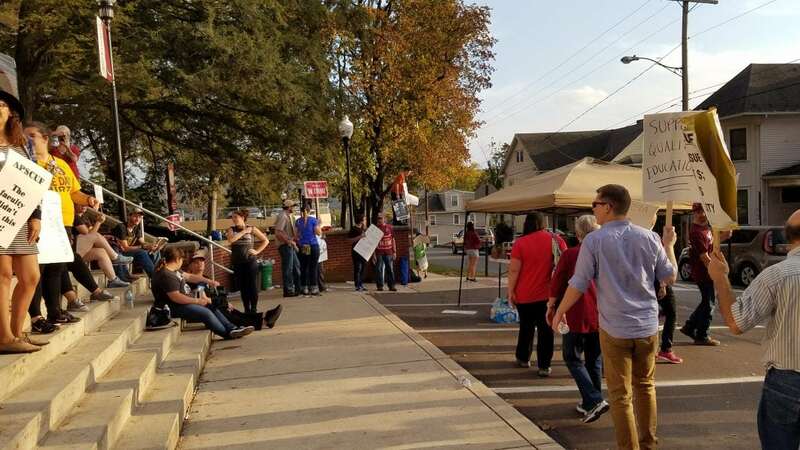 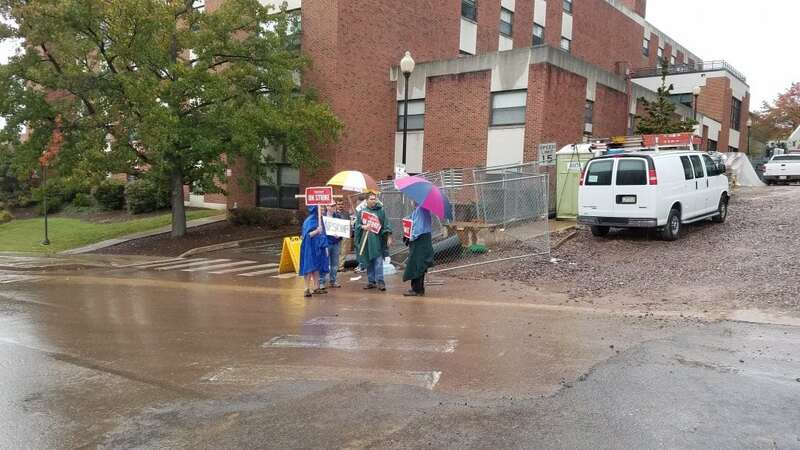 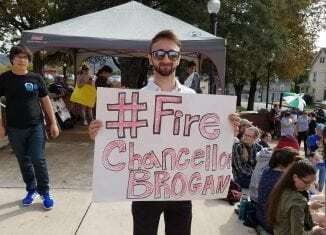 At Carver Hall, there were chants of “Let’s get Brogan off his a*s out and negotiate,” as well as, “Hey Hey, go home, Frank Brogan got to go,” “One, two, three, four, let’s get Brogan out the door,” and, “Chancellor Brogan got to go.” The chants determine that the faculty and the students that are supporting the faculty want the current PASSHE Chancellor, Frank Brogan, to negotiate with APSCUF for a new contract. 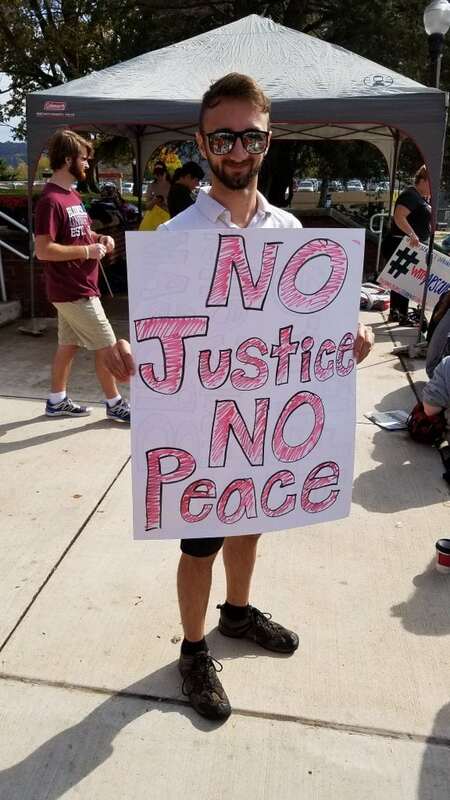 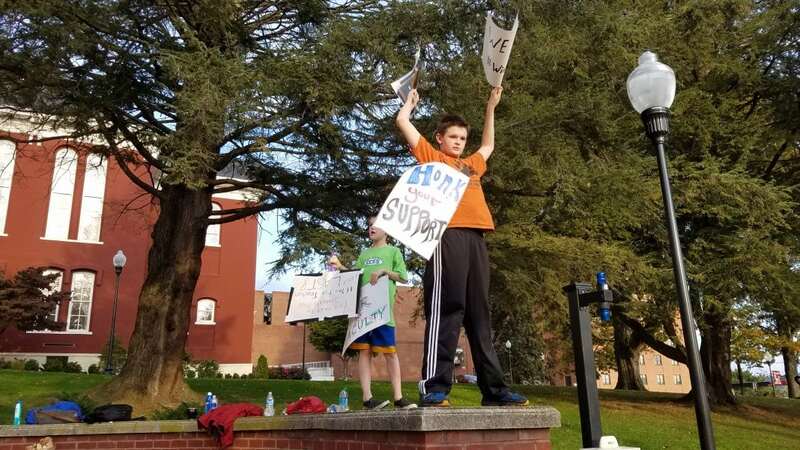 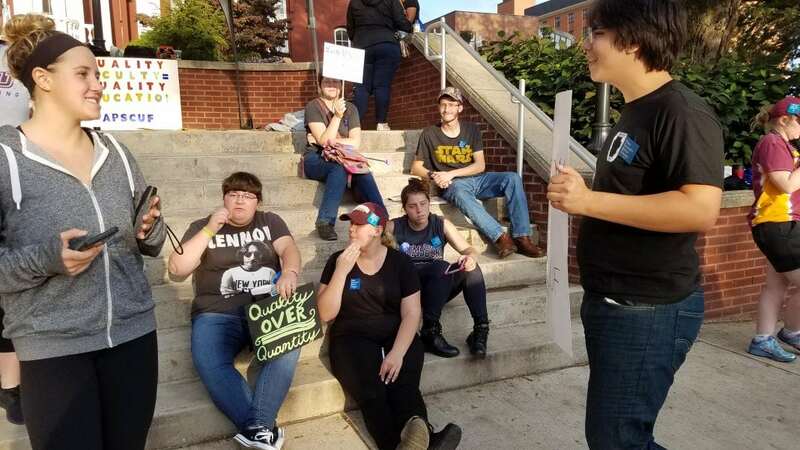 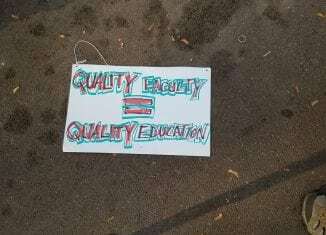 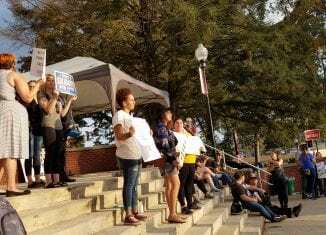 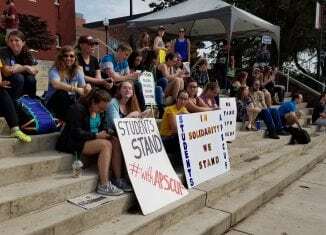 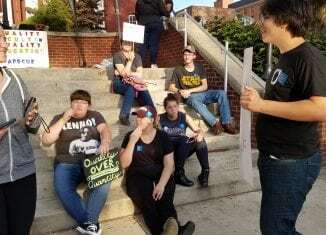 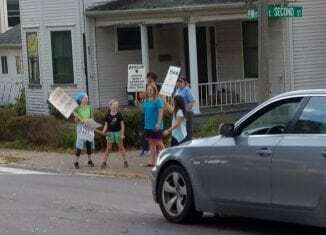 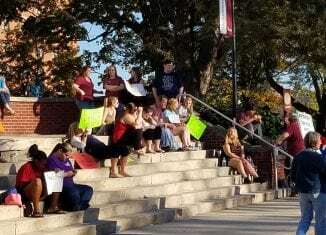 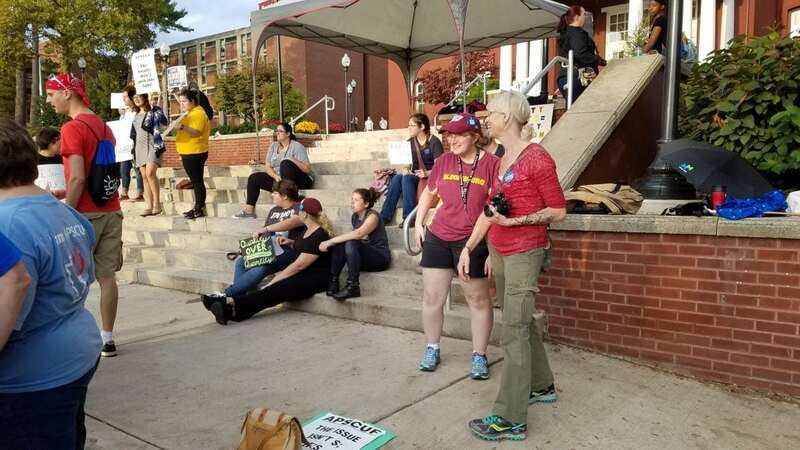 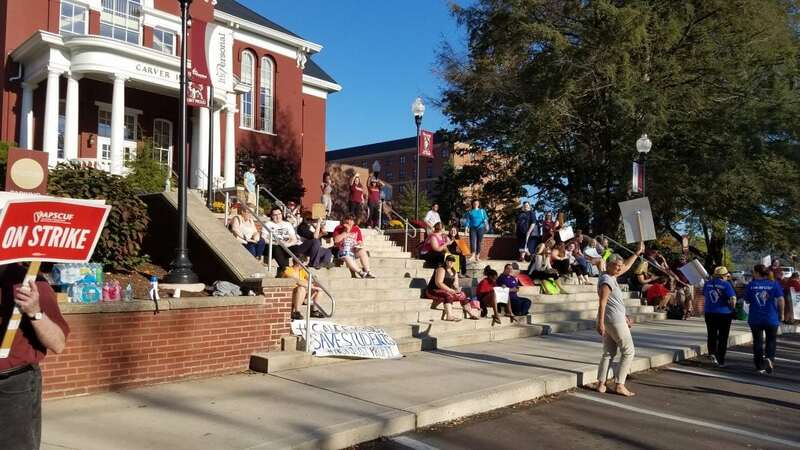 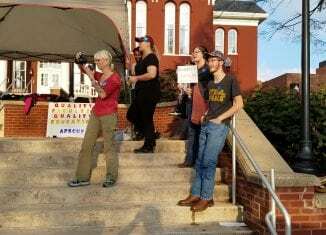 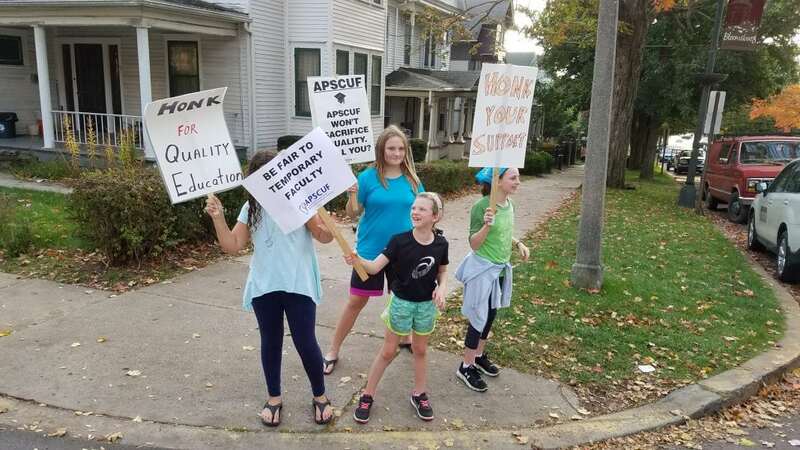 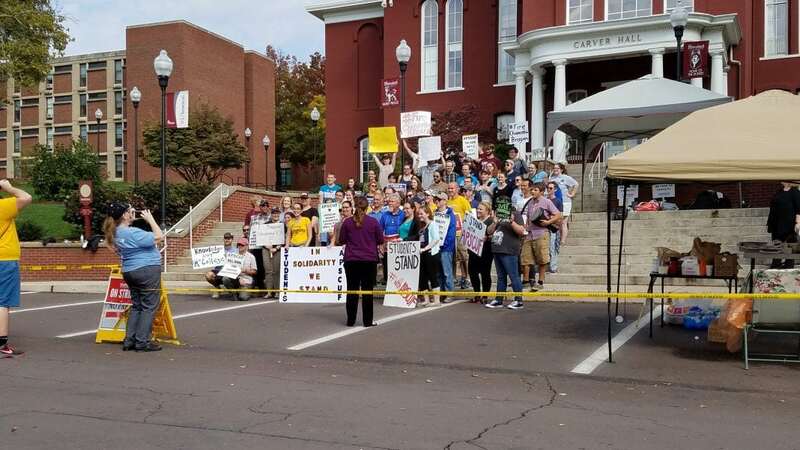 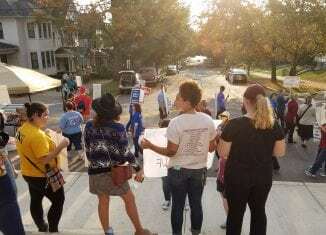 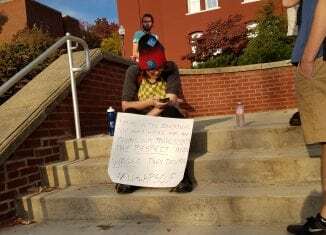 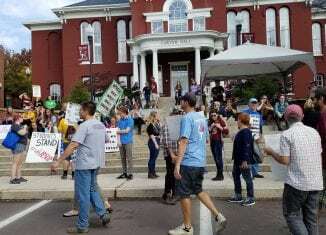 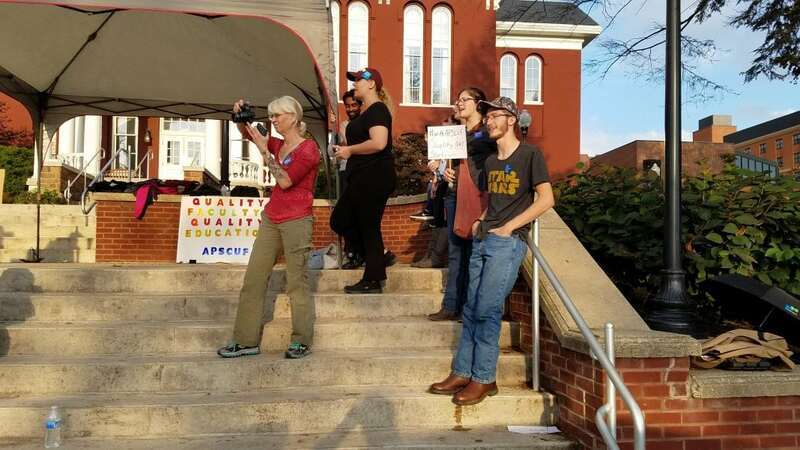 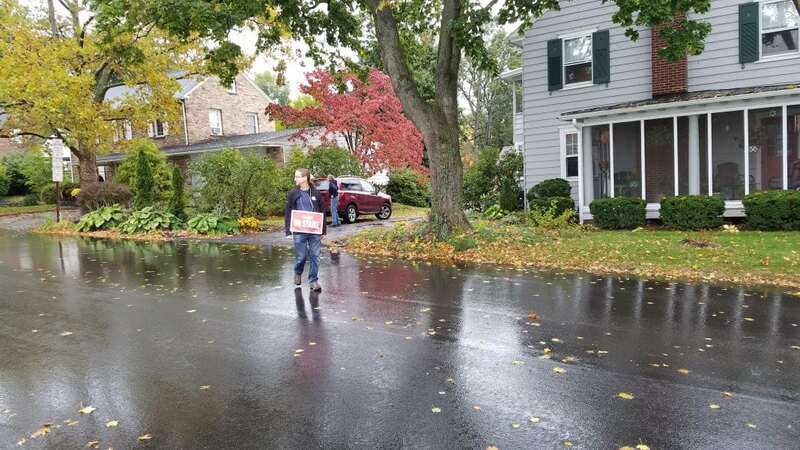 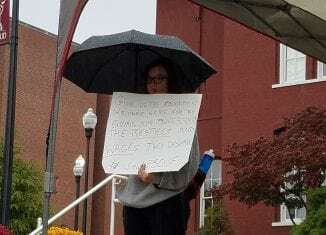 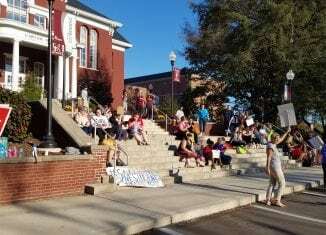 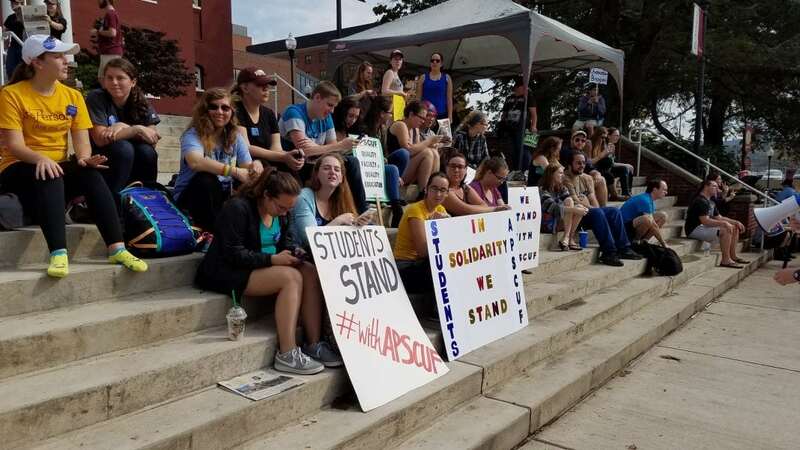 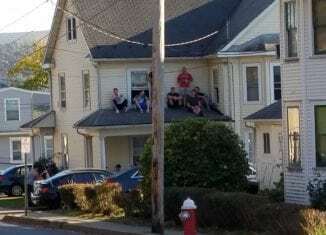 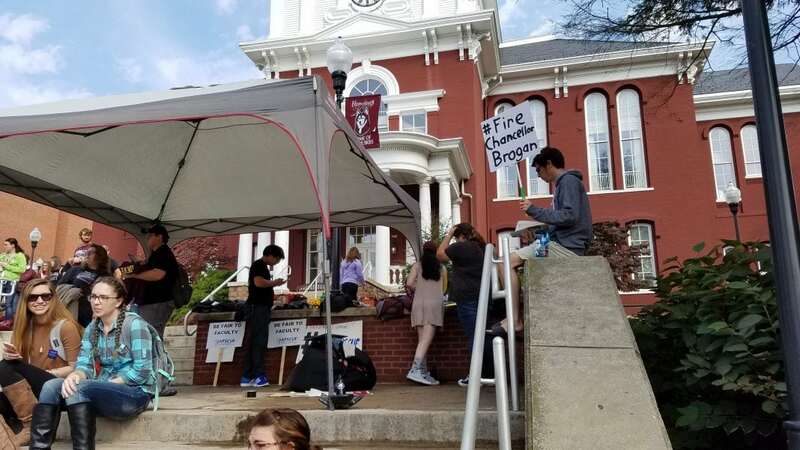 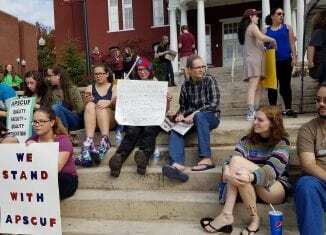 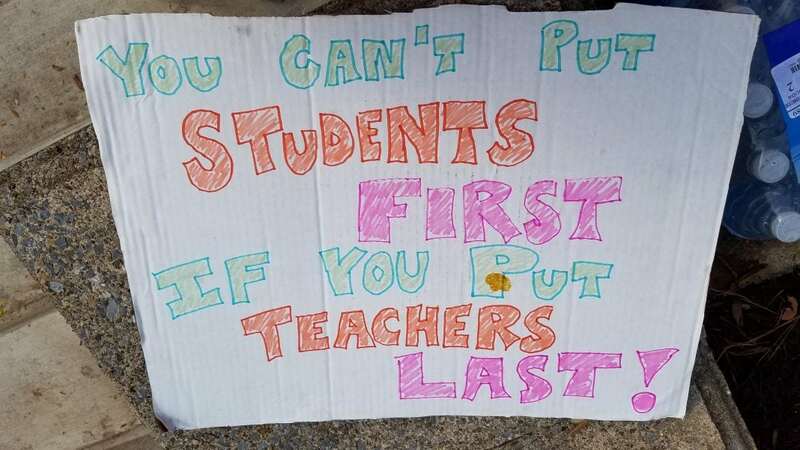 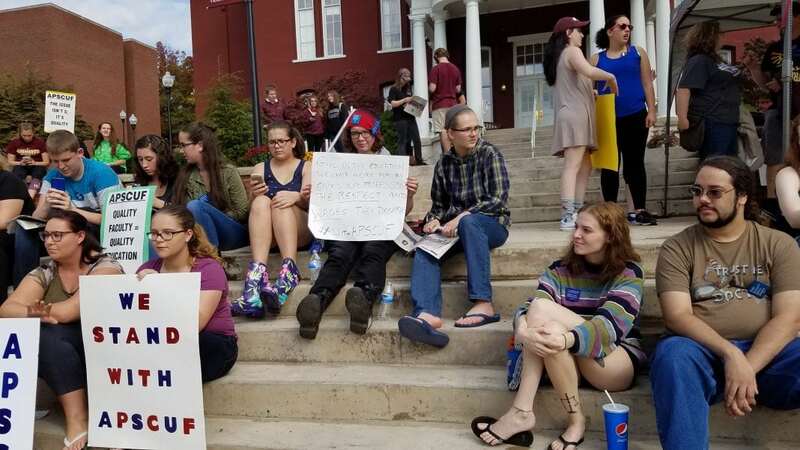 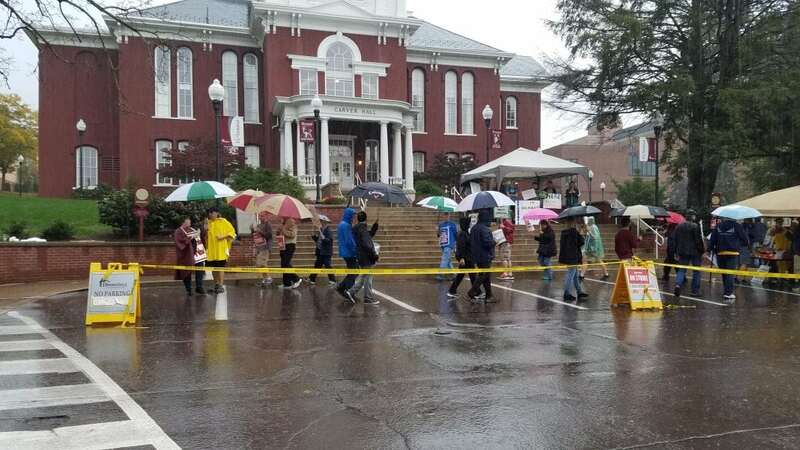 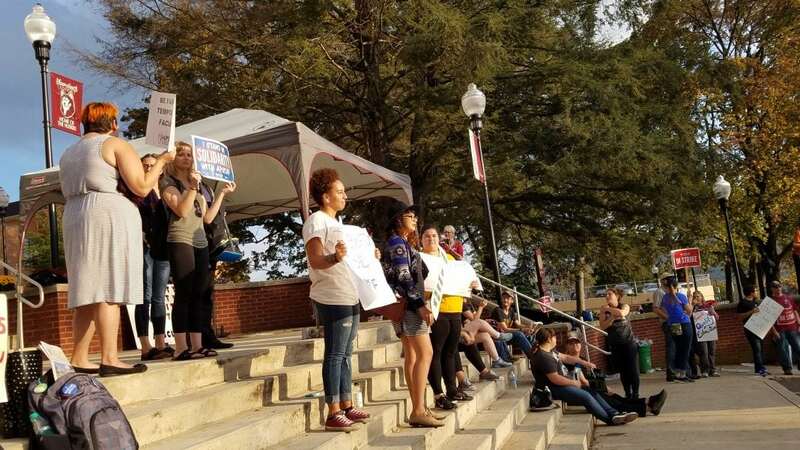 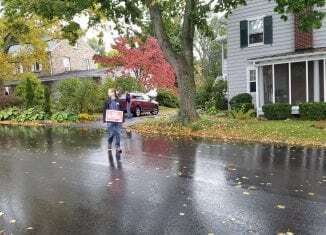 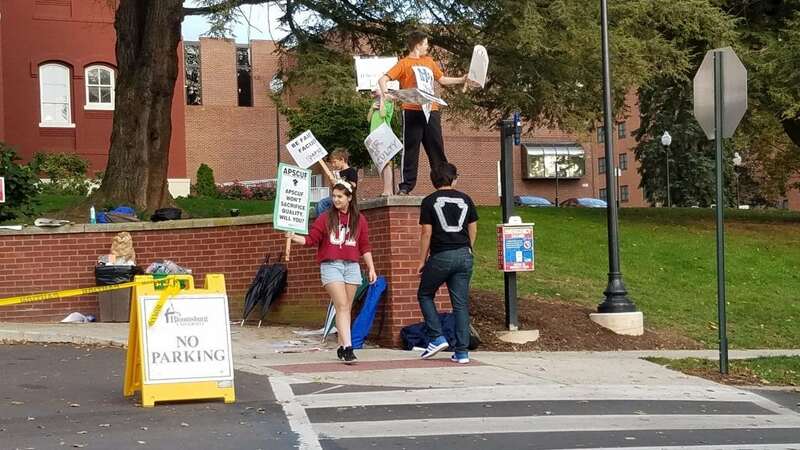 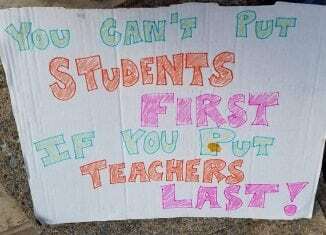 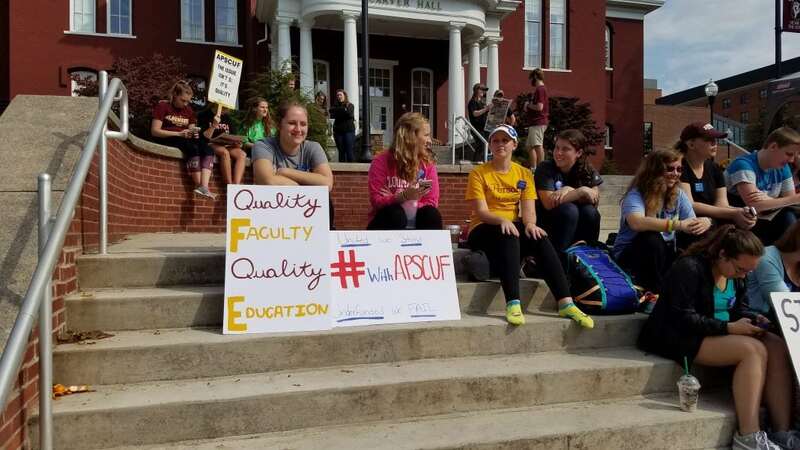 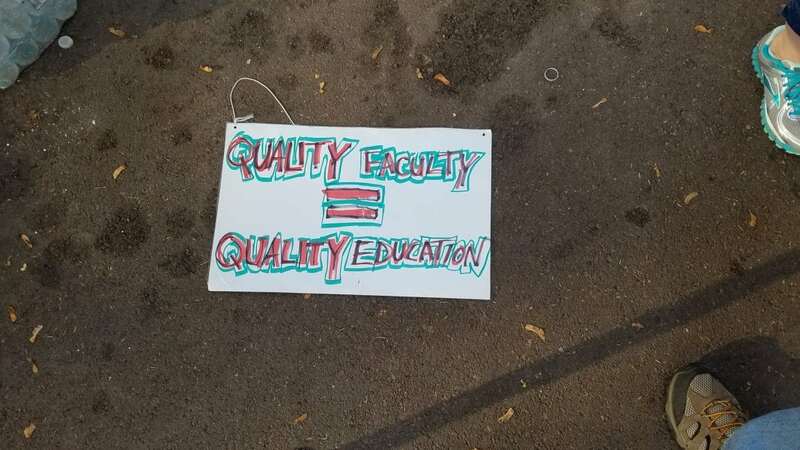 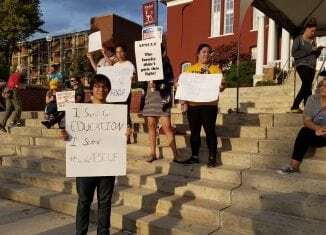 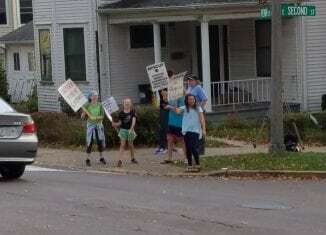 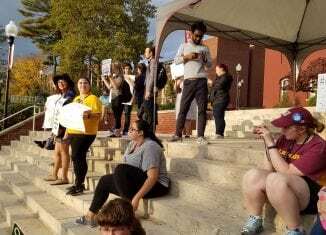 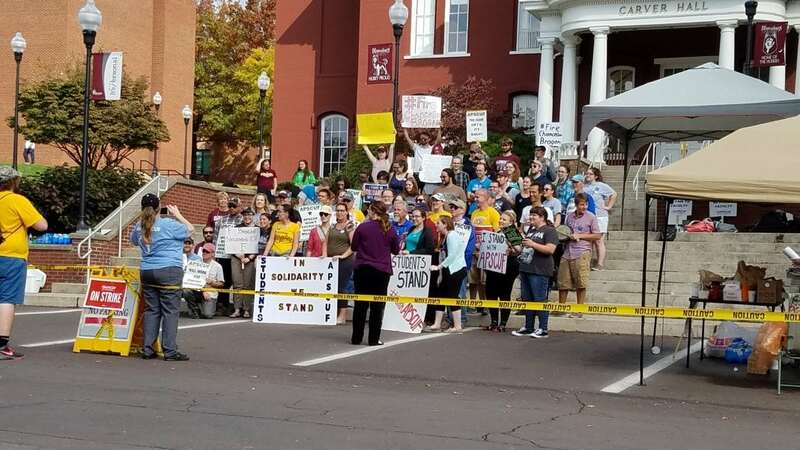 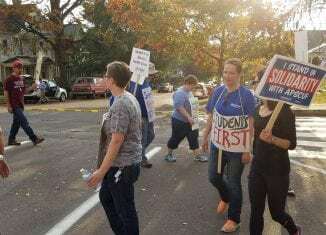 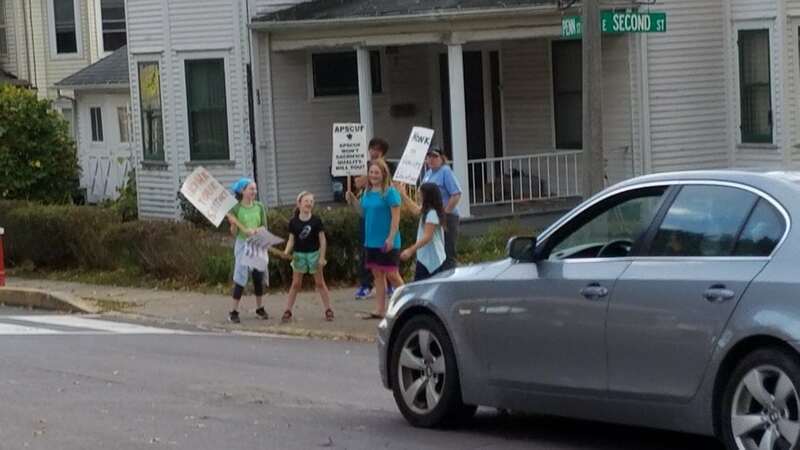 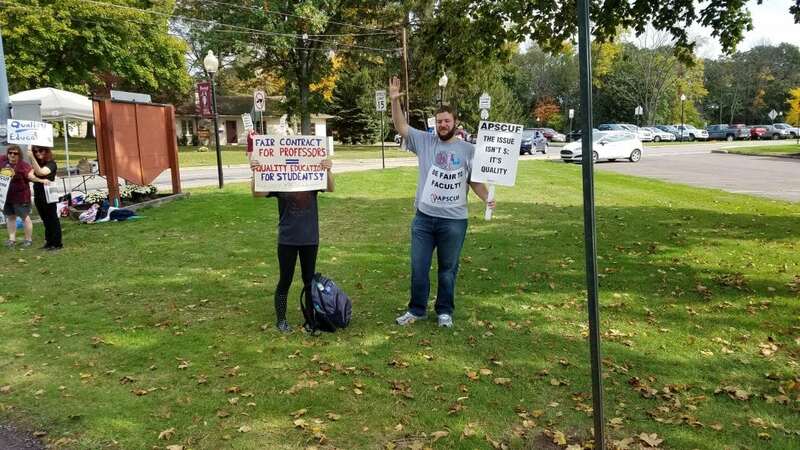 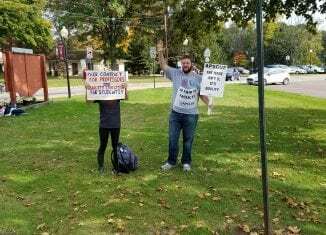 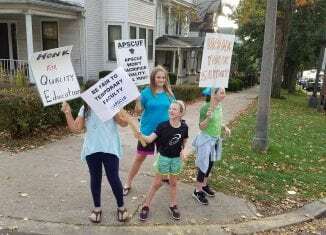 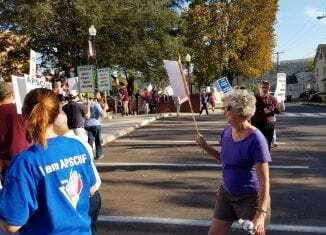 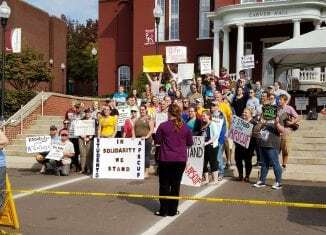 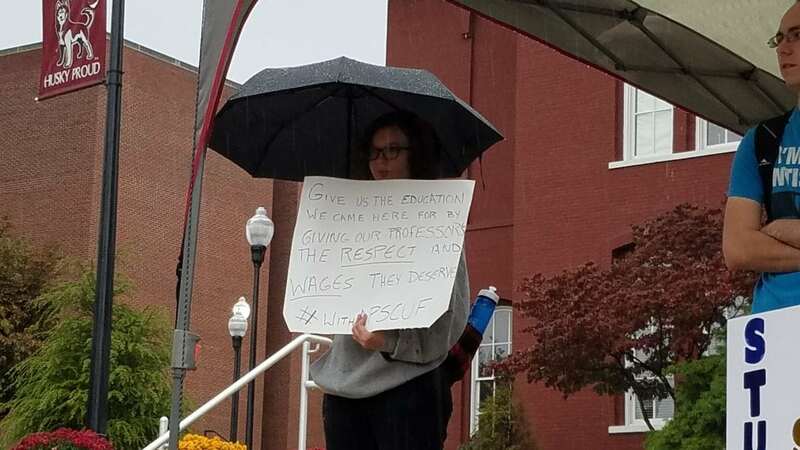 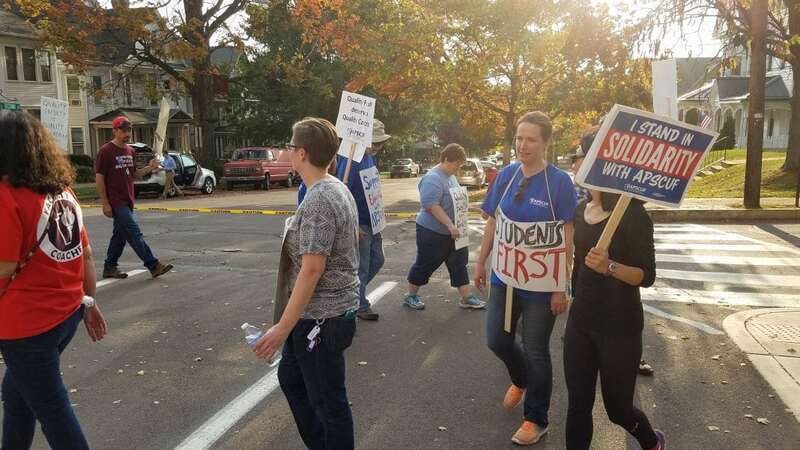 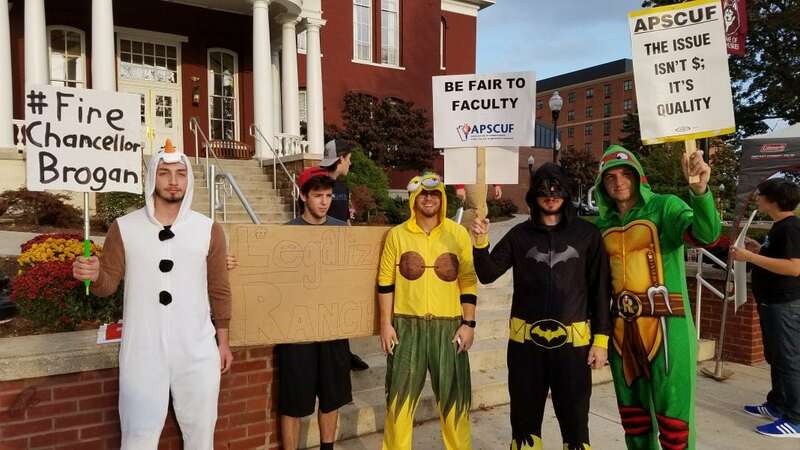 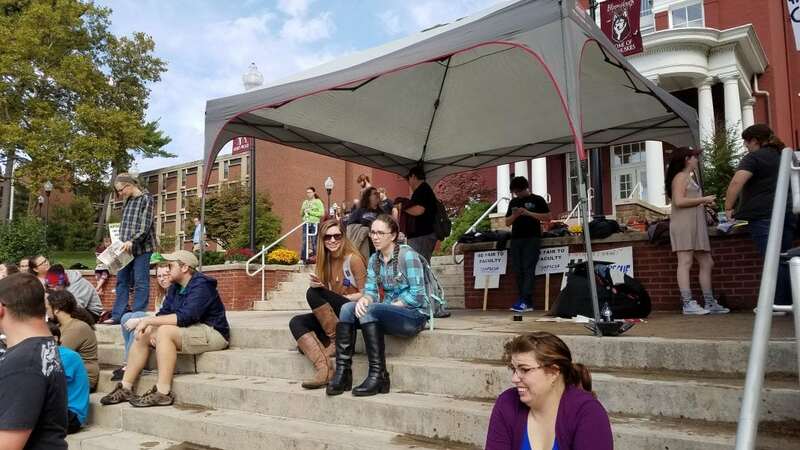 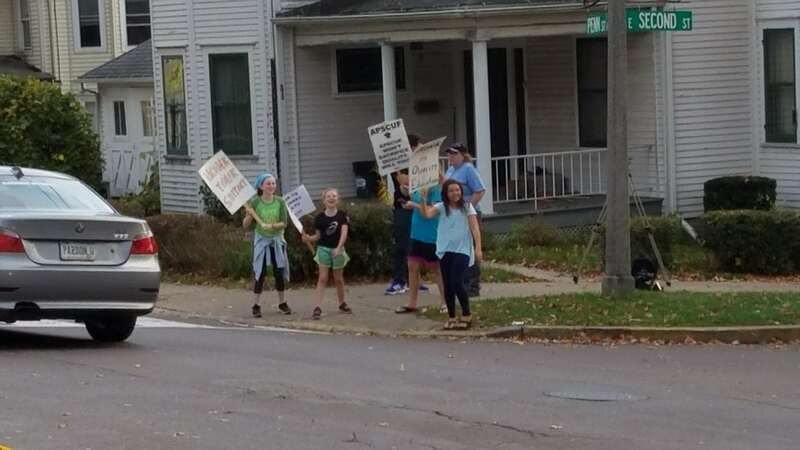 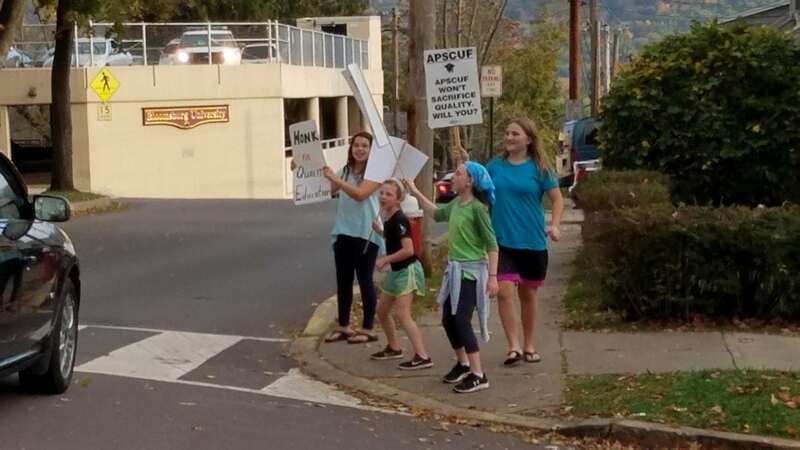 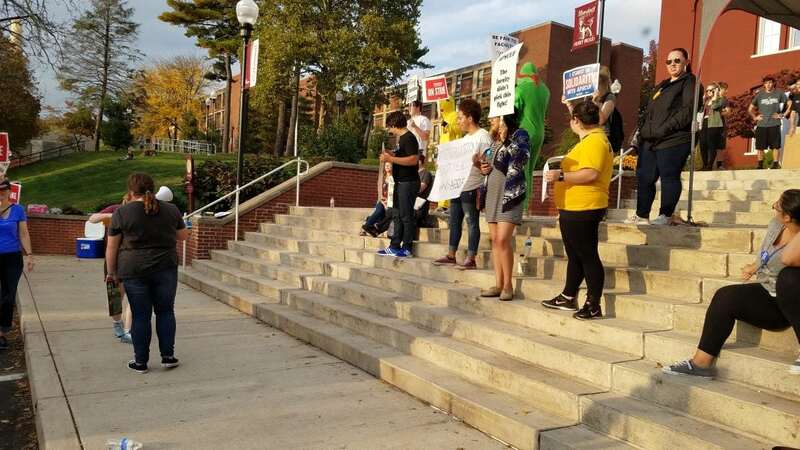 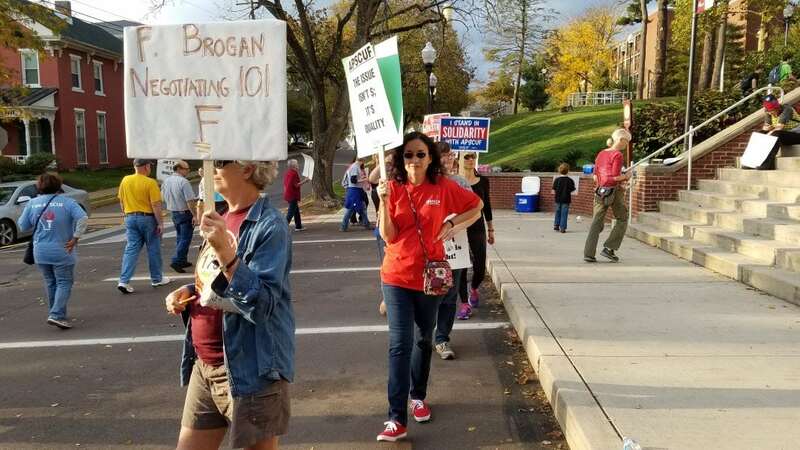 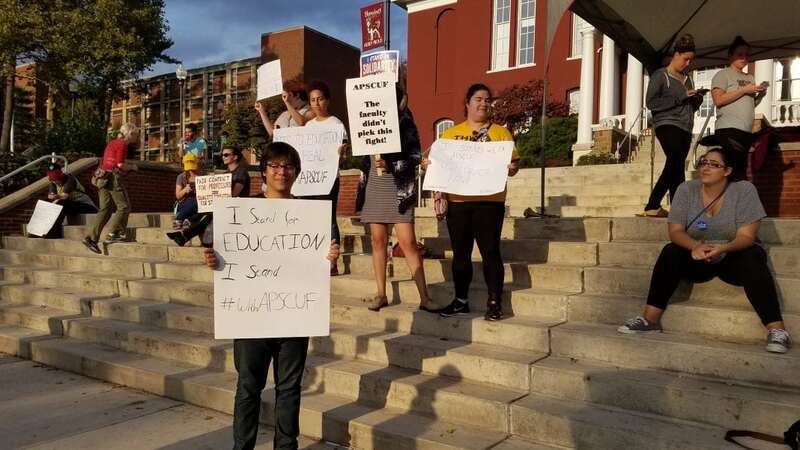 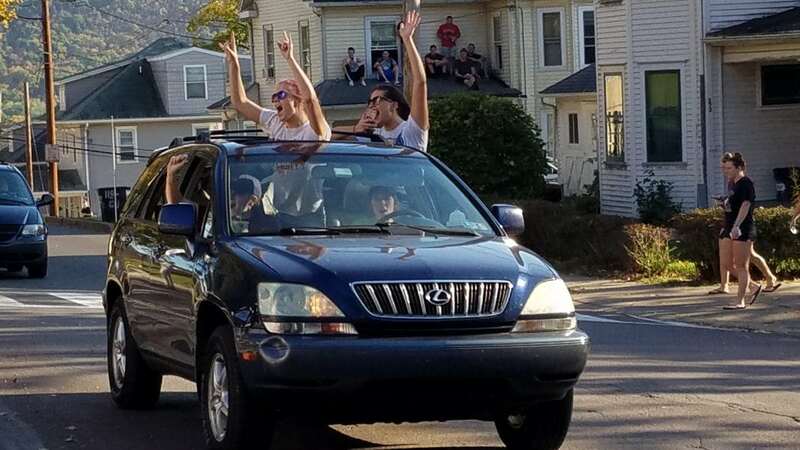 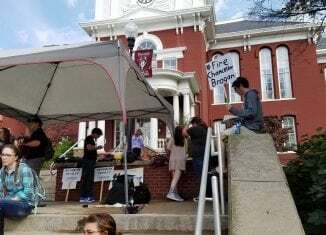 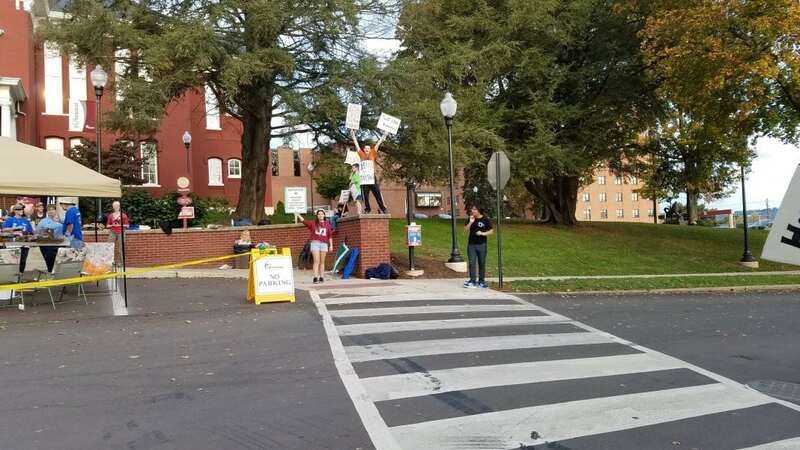 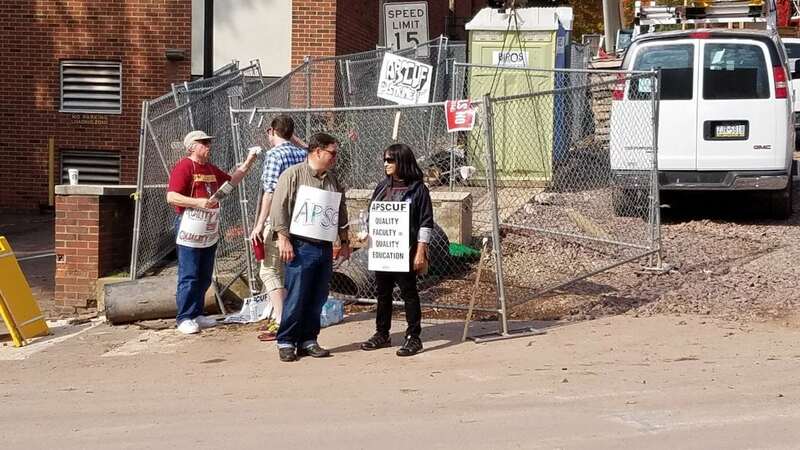 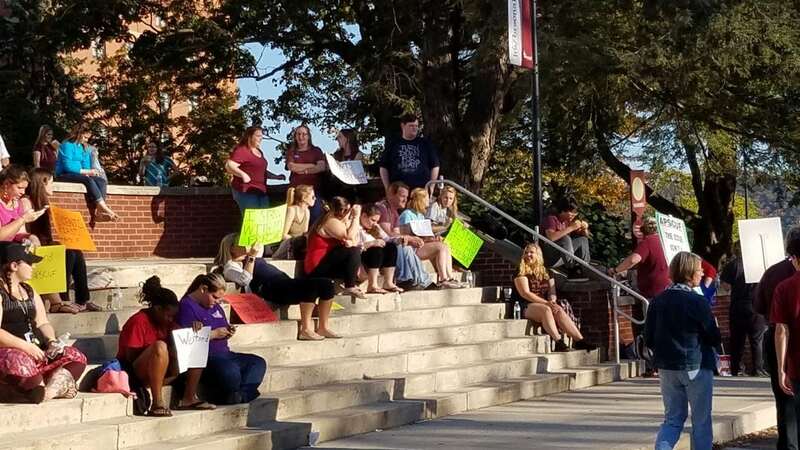 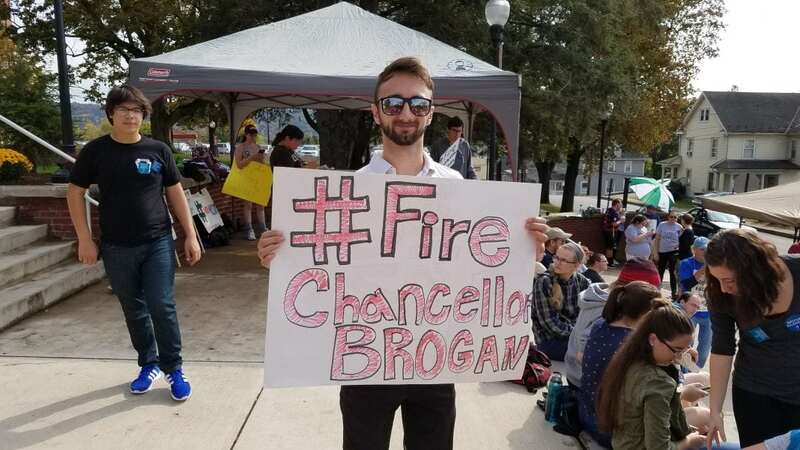 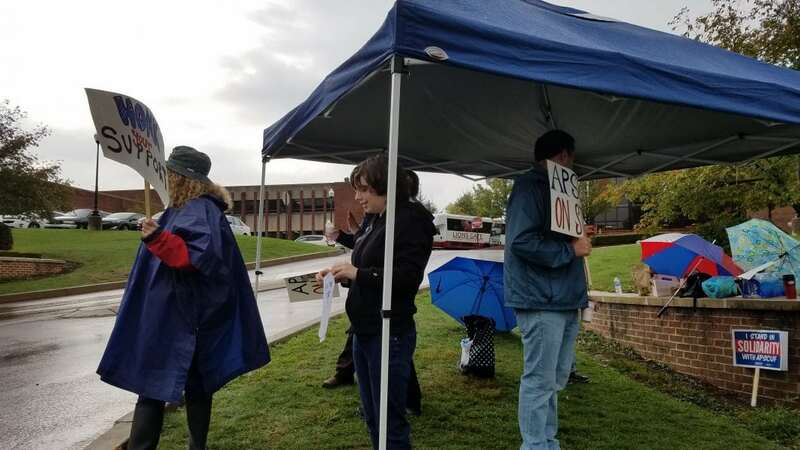 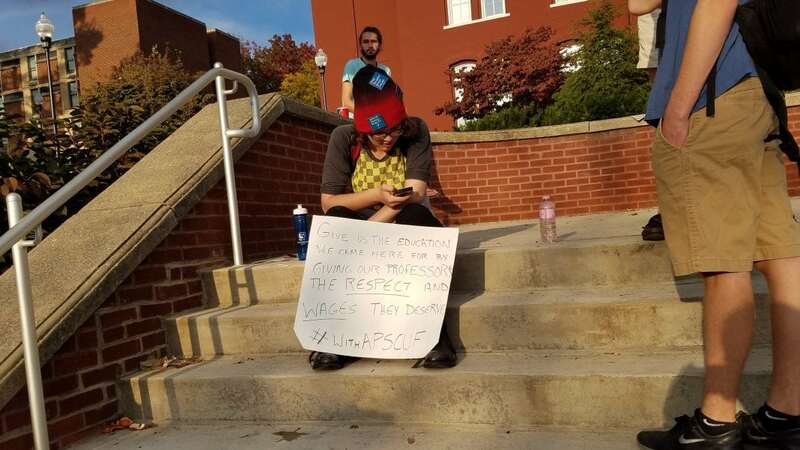 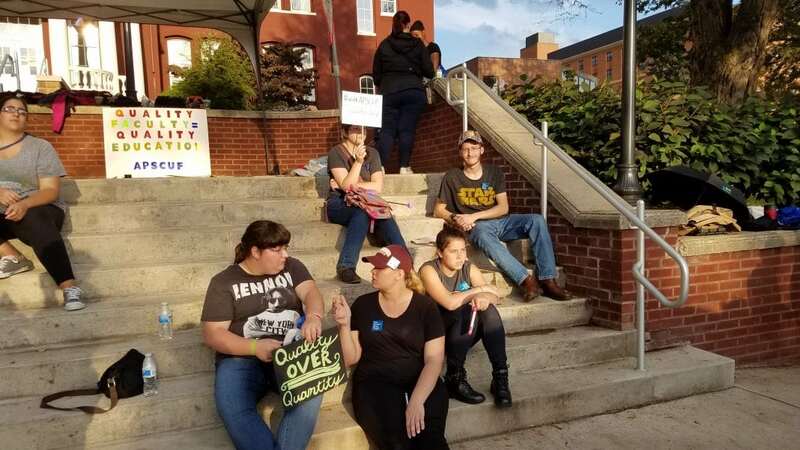 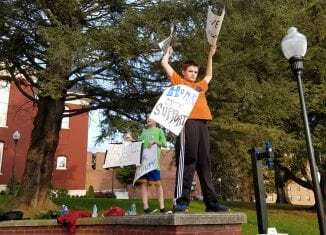 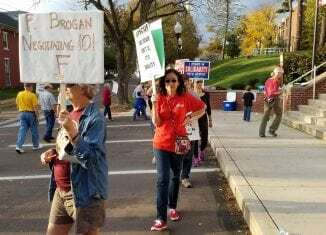 Also, the chants showed that the faculty and the students wanted Brogan to either step down or the state to fire him for the labor dispute. 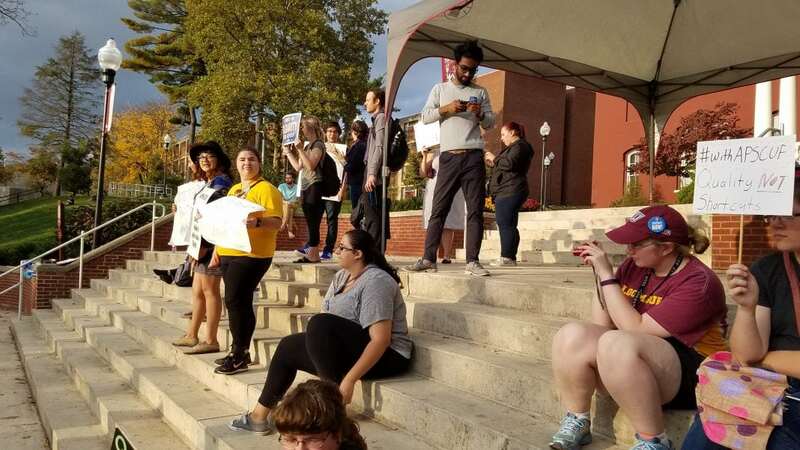 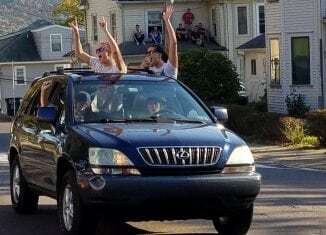 There are some clips of the chants: be advised that the videos will contain some foul language.